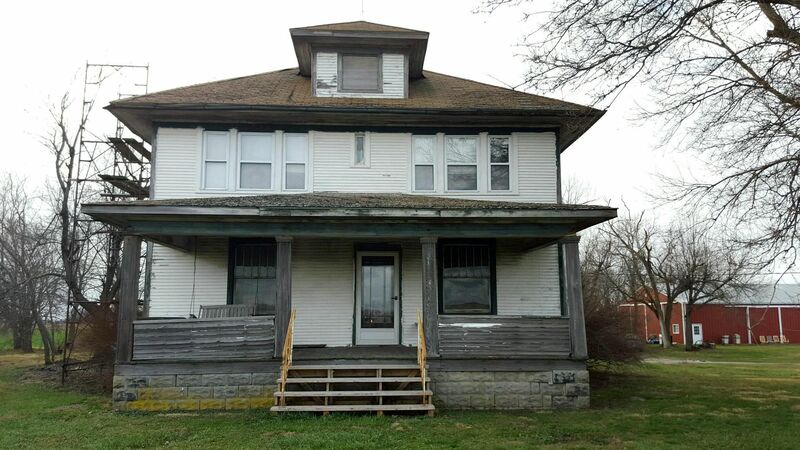 Twice in the last several months, I’ve done a blog on a Sears House that I’d never seen, but had hoped to see, and both times, readers have found those houses! 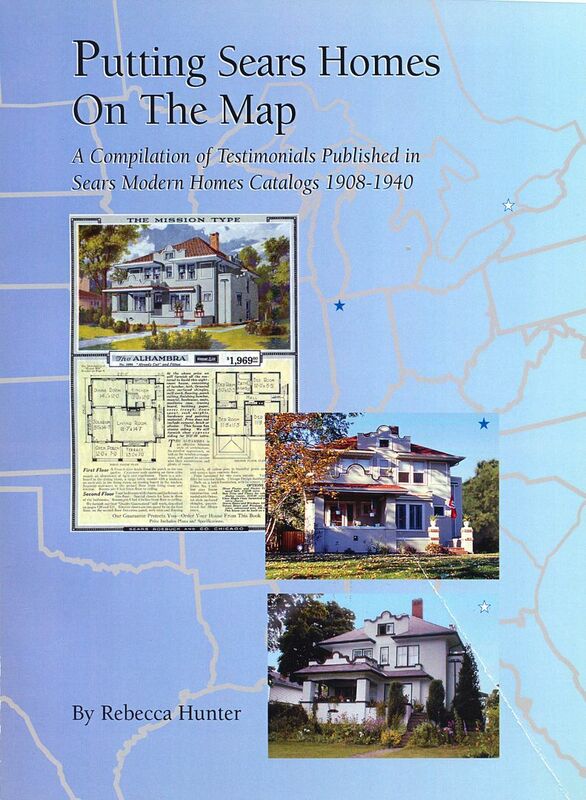 The first one was the Sears Monterey, which Jennifer successfully found and identified in Pennsylvania. 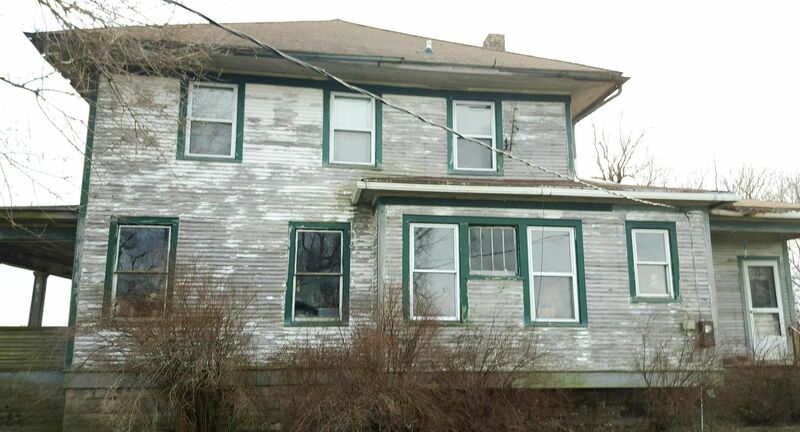 And now, Jim has found and identified a Sears Modern Home #158 in West Virginia! Part of what piqued my interest in this house is that it merited an honorable mention in a book titled, “Flesh and Bone” by Jefferson Bass (2007). Thanks to Jim for contacting me on this #158! Many thanks to the unnamed and unknown Realtor who took the photos. If I knew who you were, I’d give you some link love. To read about Jennifer’s find in Pennsylvania, click here. The blog to which Jim responded can be found here. 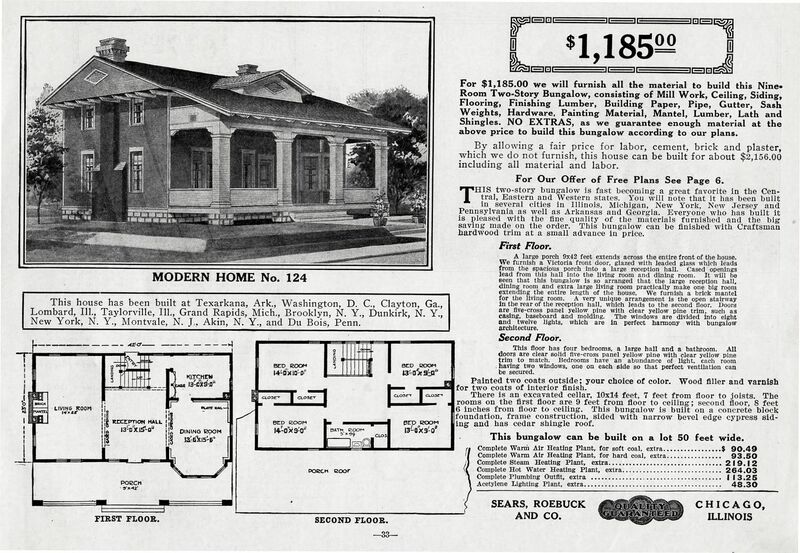 Sears Modern Home #158, as seen in the 1910 catalog. 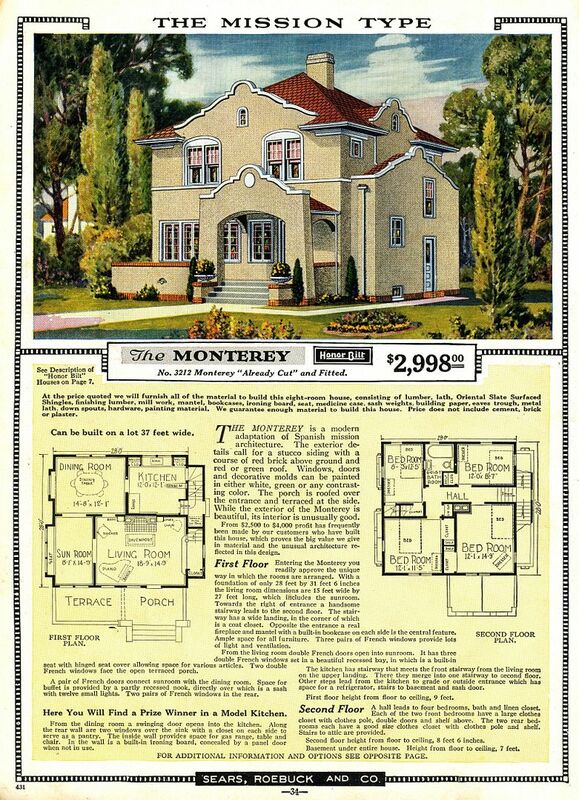 It always tickles me to find a Sears kit home with servant's quarters. 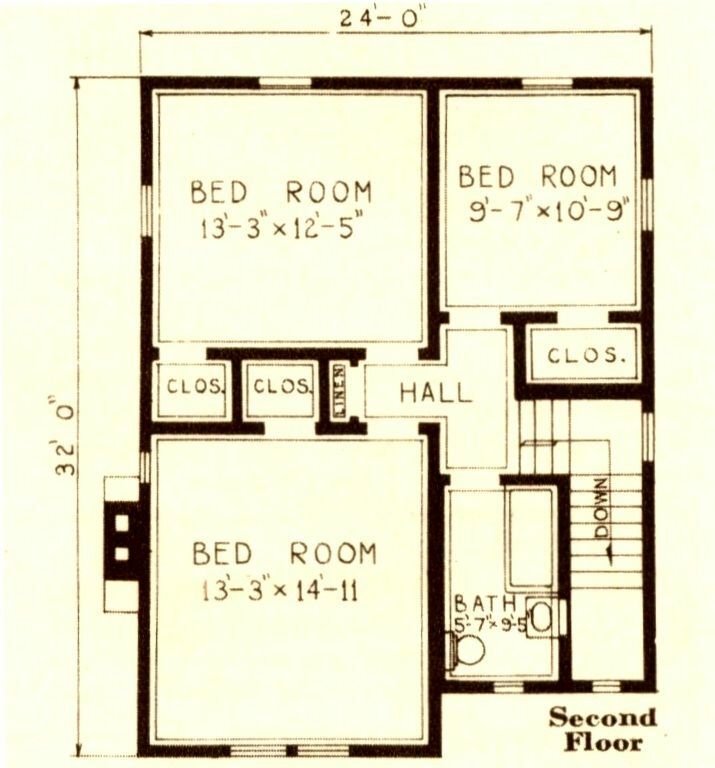 The bedroom on the front left is 12x20, which is massive for a Sears House. Cement, brick and plaster were not included in the kit, due to weight and freight. As Jim said, it's a pretty distinctive house! There it is, in all its beauty, in West Virginia. 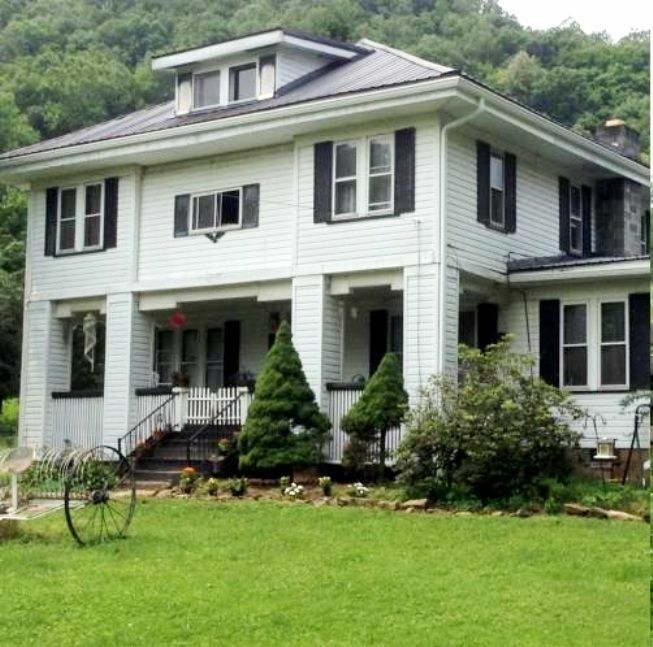 If anyone ever decides to leave me a Sears House in their will, I hope it's in West Virginia. What a fabulous place to live! I'd also settle for Western Virginia. Or Southern Virginia. Or North Carolina. Or South Carolina. Maybe Maryland. And California. And even Hawaii. Heck, I'd take one anywhere. 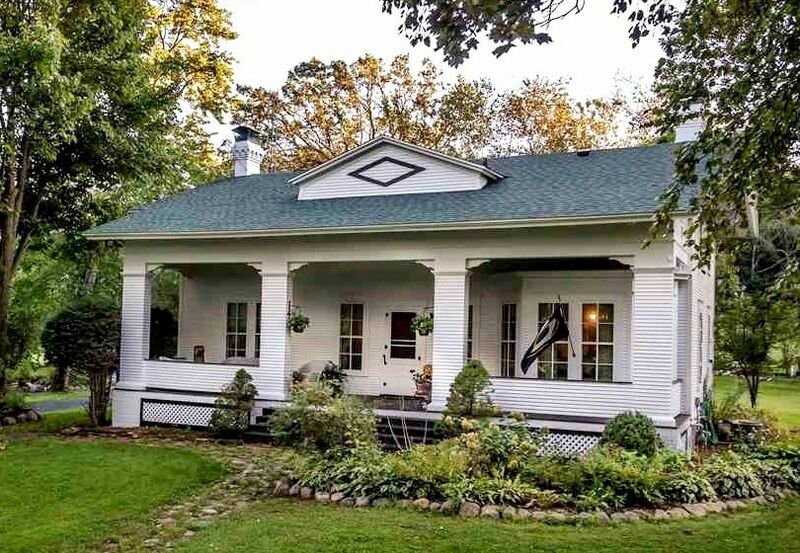 Put side-by-side, you can see that the house in West Virginia is a really nice match, down to the detail on the underside of the porch roof. And what a delight to see that those full-length porch railings are still in place. Nice back yard, too. Plenty of room back there for some horsies. The outside is lovely, but it's the interior that made me swoon. My heart is all aflutter just looking at these images. Now that's a view to wake up to! Does the swing convey? How about the adorable baby Adirondack chair? 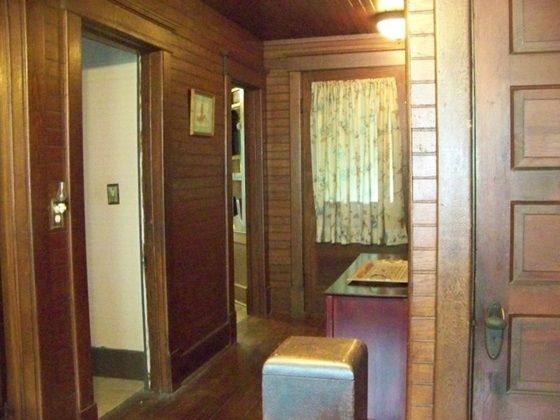 However, I'm fairly certain that all this original wood planking is original to the house. And it's too beautiful for words. Here's hoping the new owner doesn't paint it or tear it out. Thanks again to Jim for contacting me about this treasure! The Croydon: A Spanking New Outlook! 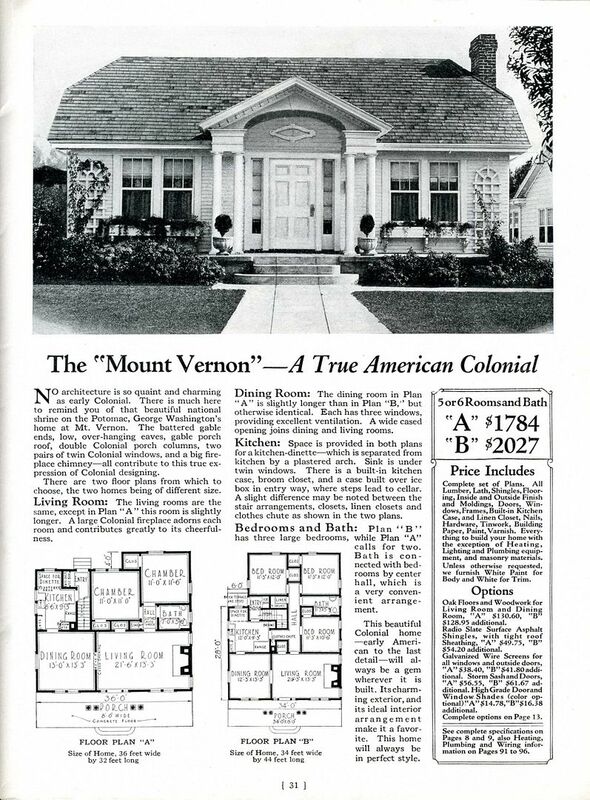 So read the liner notes for the Sears “Croydon,” a darling Tudor Revival from the late 1930s. 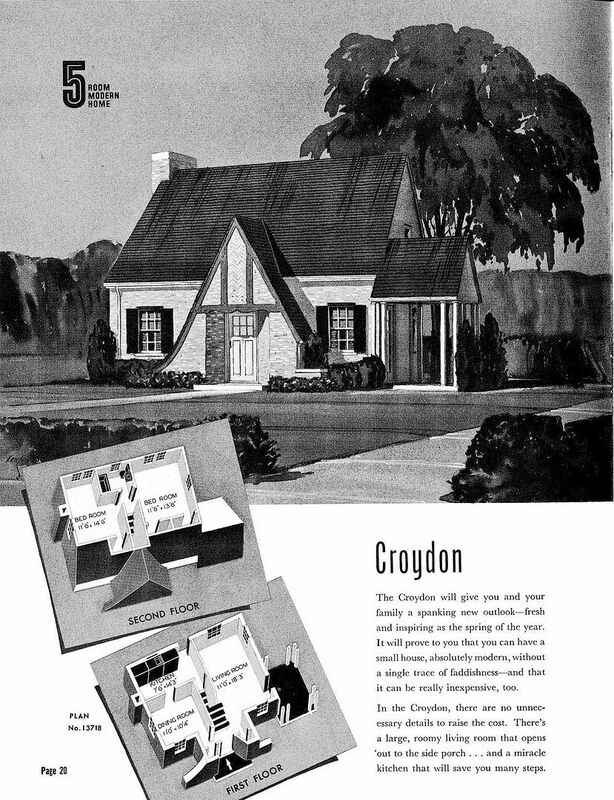 From what we can discern, the Croydon was offered only in 1939 and 1940, the final two years of the Sears Modern Homes program. 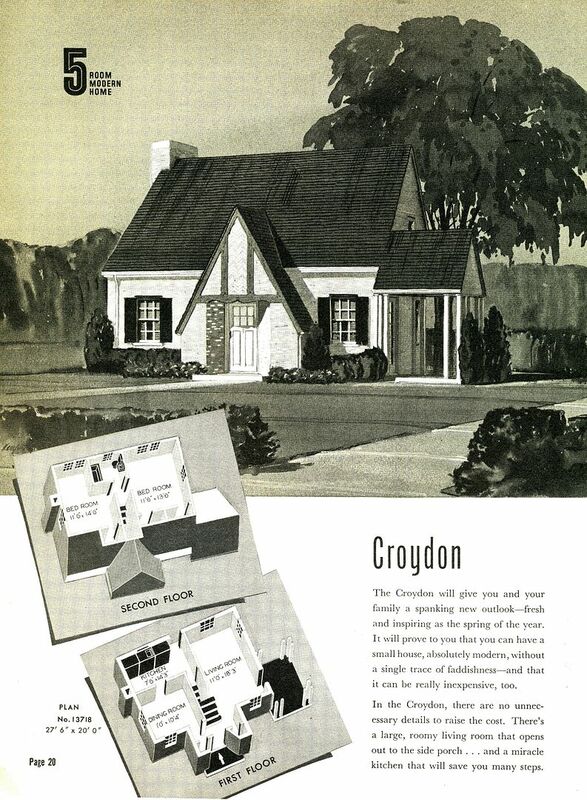 These post-1935 Sears Homes are scarce as hen’s teeth, and discovering a Croydon is a remarkable thing. And, it removes another “never seen this one” model from my life list! The joy of discovering this rare bird goes wholly to Jeff S. Alterman, who not only found it, but provided all the photos you’ll see below. To see Rose and Rebecca’s list list, click here. 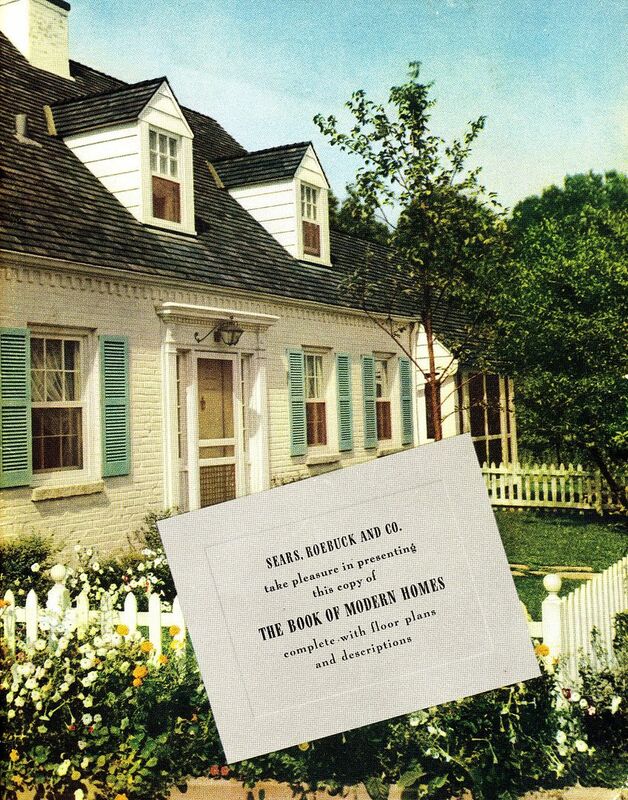 For years and years, we'd always believed that the 1939 and 1940 Sears Modern Homes catalogs were identical, and that the 1940 catalog was a straight reprint of the 1939. Reading up on "The Croydon" we learned that this wasn't the case. 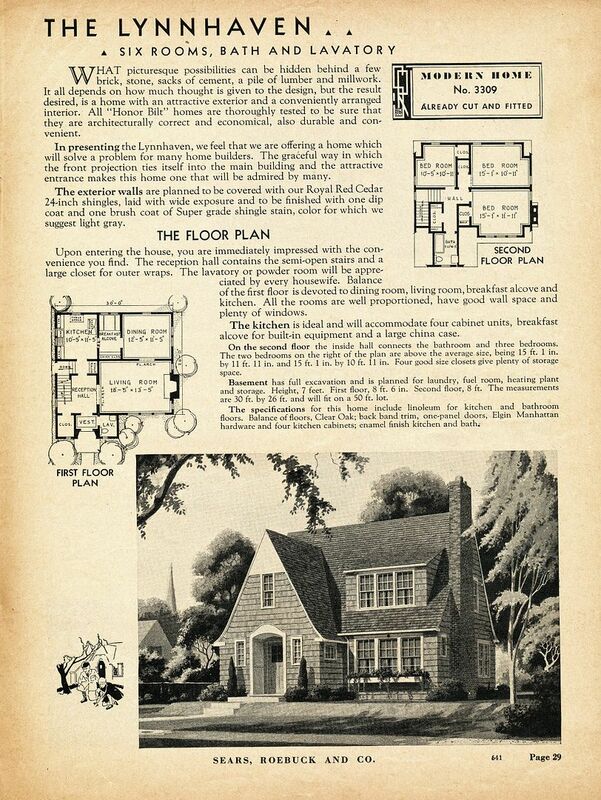 In the 1940 catalog, the Croydon looked like this. 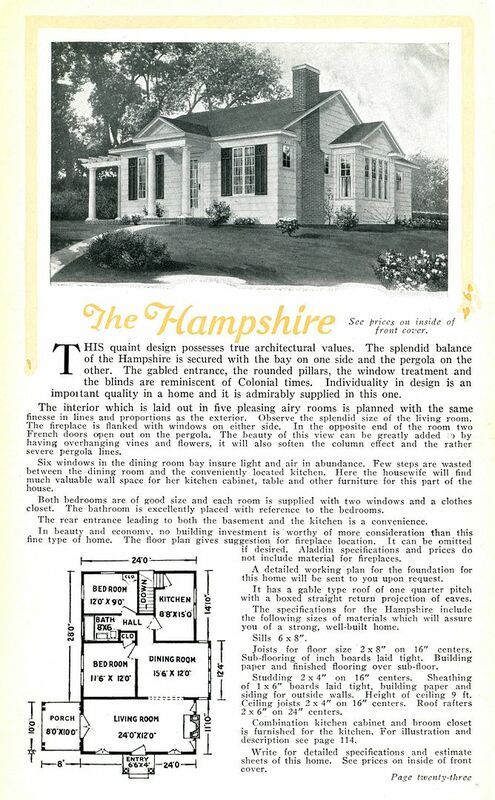 In the 1939 catalog, it looked like this. Remember that feature in "Highlights Magazine" where readers were invited to spot the differences in two images? Let's play that game here. Here, I'll make it easier. 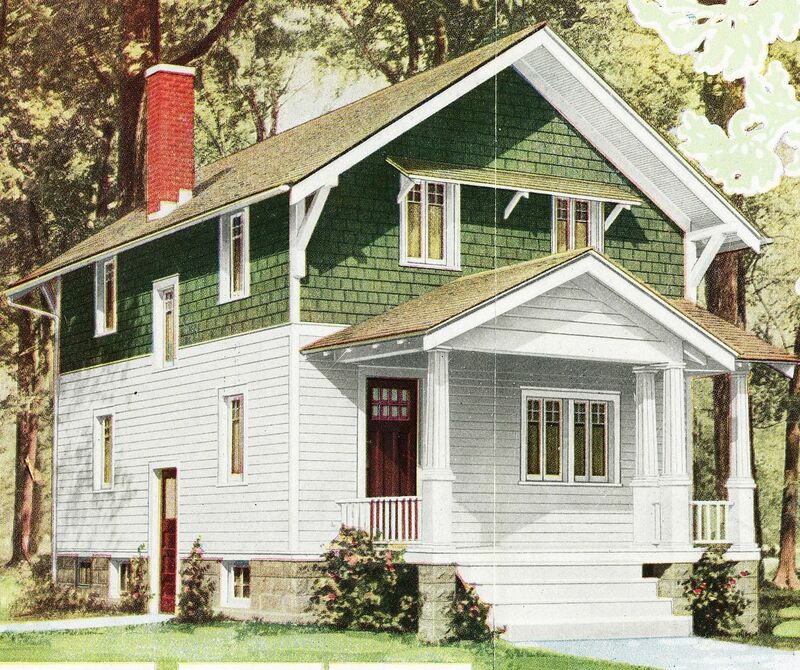 The Croydon that Jeff found in Hastings-on-Hudson is a beautiful match to the 1939 catalog image. (I'm assuming you figured out the difference between the 1939 and the 1940 by now.) Photo is copyright 2015 Jeff S. Alterman and may not be used or reproduced without written permission. 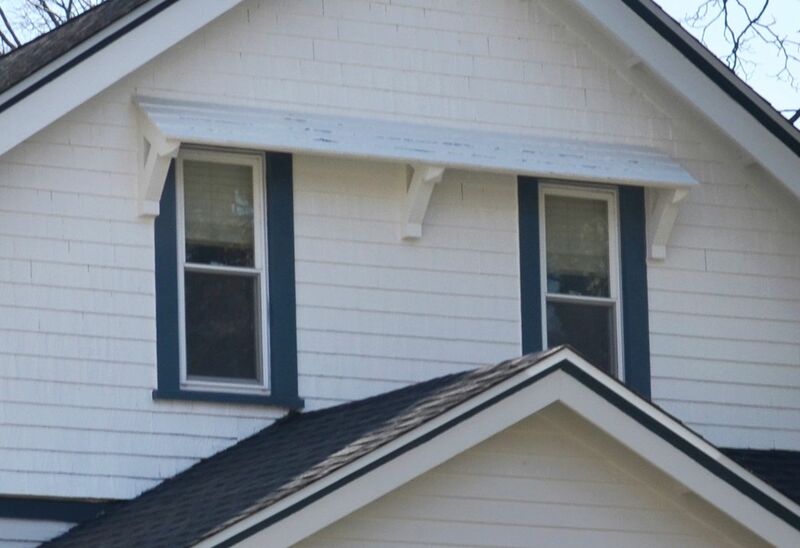 And here's a fun close-up of the detail on that bell-cast asymmetrical front gable. I love this photo and am so tickled that Jeff's keen eye decided to zoom in on this. 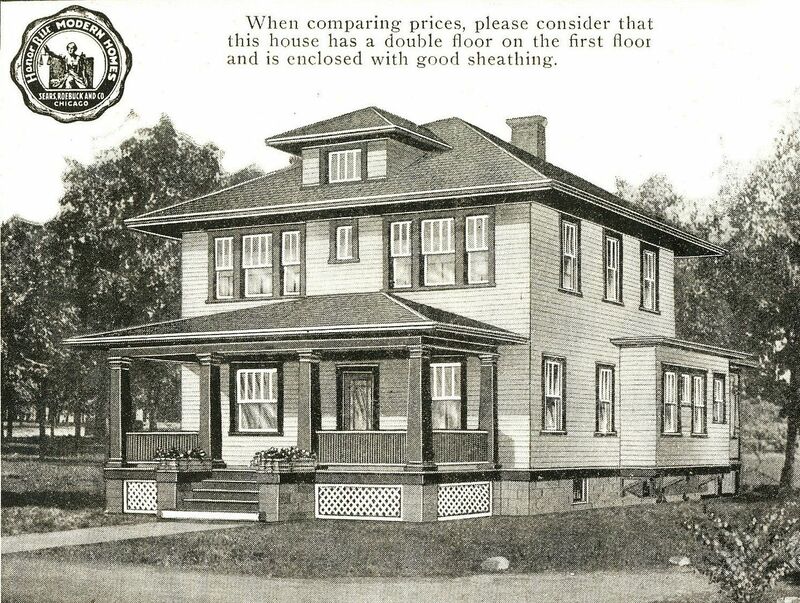 Plus, it shows that the Croydon had functional shutters - very unusual for a Sears Home. 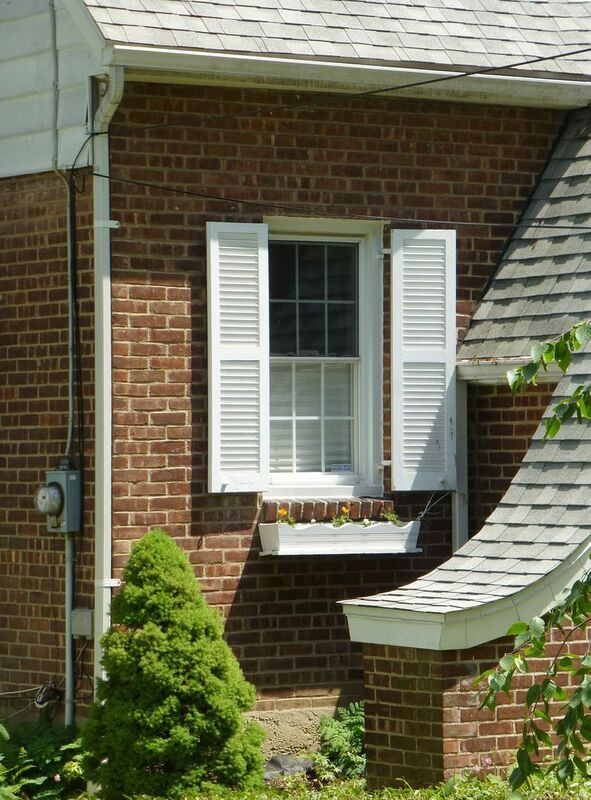 Only a handful of models had working shutters; most were ornamental. Photo is copyright 2015 Jeff S. Alterman and may not be used or reproduced without written permission. Reason #1,489 that vinyl-siding salesmen should be legislatively banned from old-house neighborhoods. Technically, this is aluminum trim (not vinyl) but c'mon. 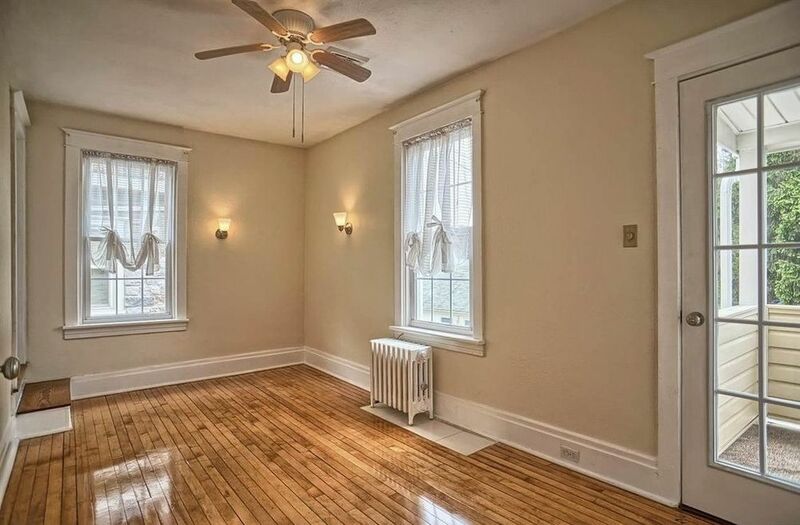 Instead of peddling your putrid products so aggressively, why not suggest to the homeowners that this particular piece of front-facing trim be left uncovered, and simply be re-painted once every 10 years or so. Photo is copyright 2015 Jeff S. Alterman and may not be used or reproduced without written permission. 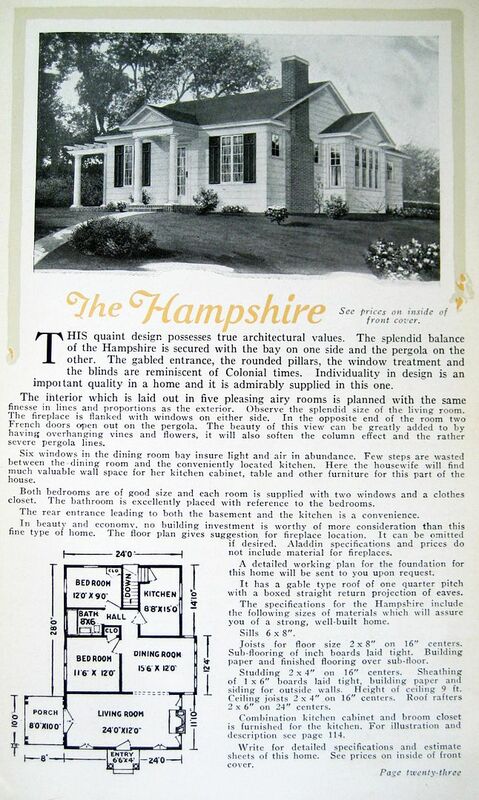 Back to the happy comments: The Croydon was a beautiful house. What a pity that this model in Hastings-on-Hudson may be one of only a handful ever built in the country. However, this one is in beautiful condition. Photo is copyright 2015 Jeff S. Alterman and may not be used or reproduced without written permission. That upstairs is actually spacious, with two bedrooms and a full bath. Photo is copyright 2015 Jeff S. Alterman and may not be used or reproduced without written permission. If you ascend in your Sears & Roebuck™ drone and remove the home's roof, this is what you'll find. 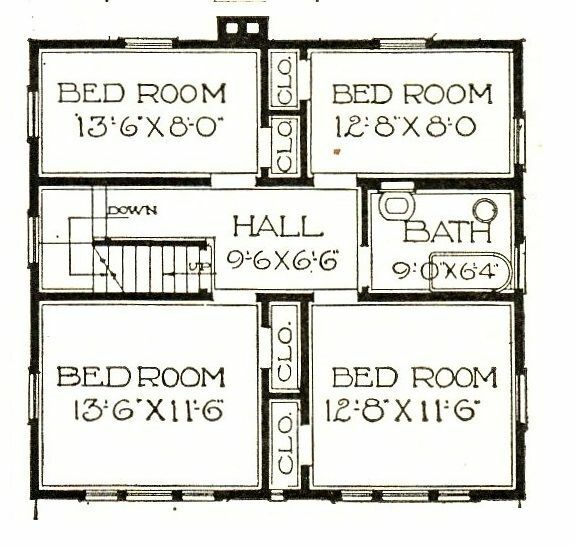 As Sears Homes go, those two bedrooms are pretty spacious. Did you figure this out? 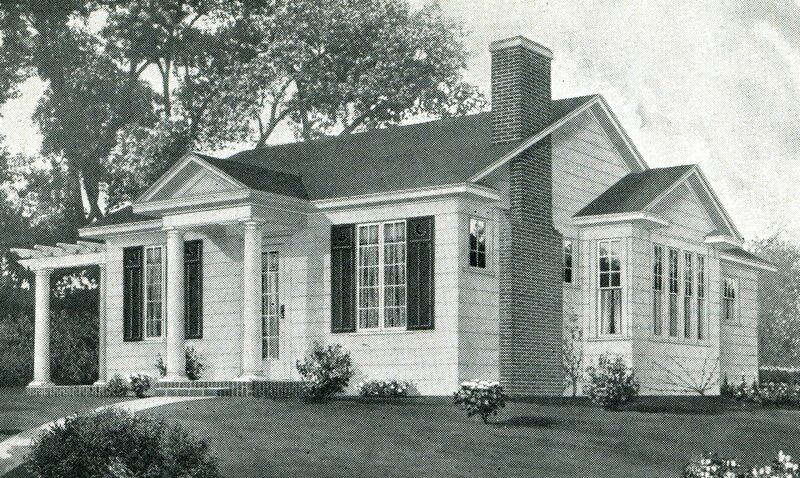 The 1939 model (left) has that dramatic bell-cast roof reaching almost to the ground, together with a short brick pedestal on the right side. The 1940 model (right) doesn't have those eye-catching features. 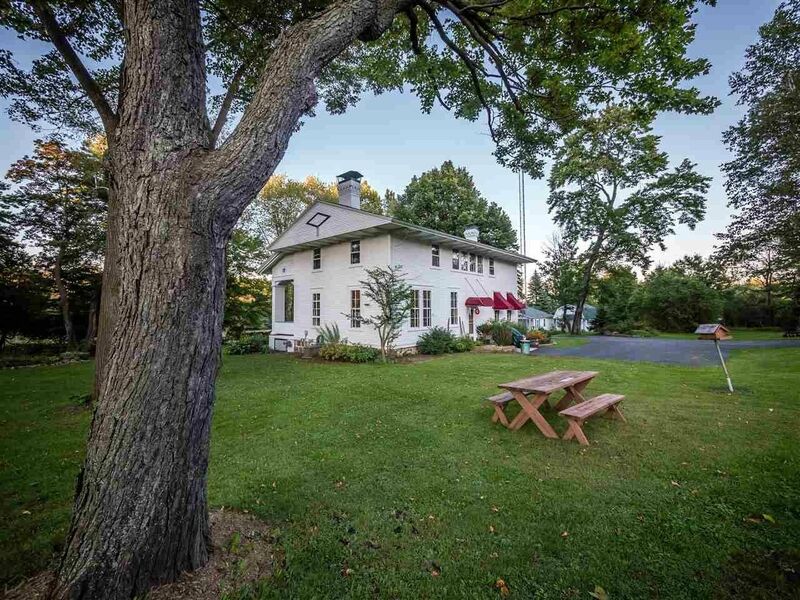 Did you miss that small pedestal adjoining the gable when you first glanced at our Croydon in Hastings-on-Hudson? I sure did! BTW, if one of my smart friends can give me the proper architectural term for that, I'd be grateful. I'm tempted to call it a "sideways cheek" but that is probably not right. Photo is copyright 2015 Jeff S. Alterman and may not be used or reproduced without written permission. Thanks so much to Jeff for sharing his expertise and his photos! While "google driving" around a bit in Hastings-on-Hudson, I found this glorious Sears "Gladstone" around 17 Hillside, which Jeff tells me isn't included on the main list. I'd love to come to Hastings-on-Hudson sometime a do a proper street-by-street survey! 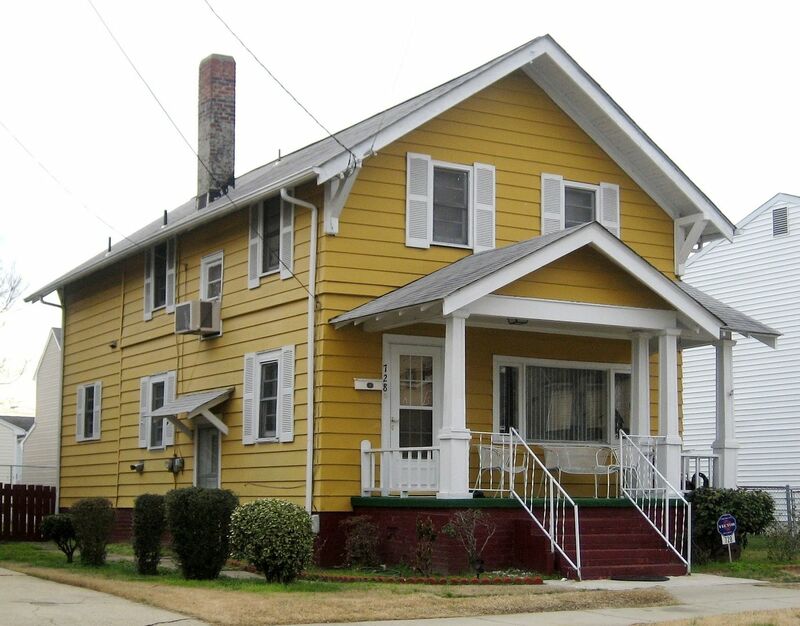 I found several Sears Homes (and a rare GVT house) in a short time in this delightful New York town. Thanks again to Jeff S. Alterman for the beautiful pictures. To join our happy group on Facebook, click here. Did you love Highlights Magazine as a kid? You’ll want to read this. Recently, this meme made the rounds on Facebook, and it’s fast become one of my all-time favorites. Even better than the meme were the comments. 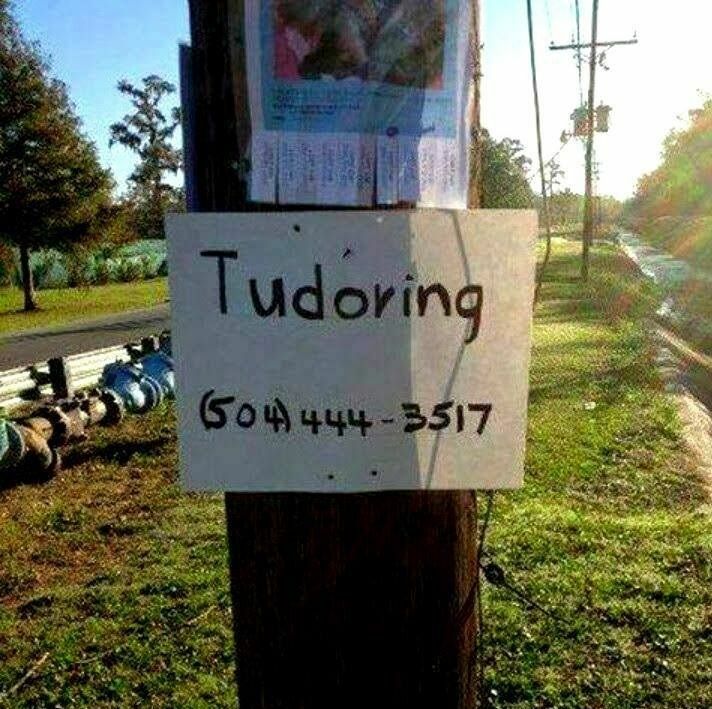 One wit quipped, "Maybe they're offering free lessons in wattle and daub?" All of which served to remind me, there's another Sears Home I've always wanted to see in the world. I've been looking for this one a long time, but without success. 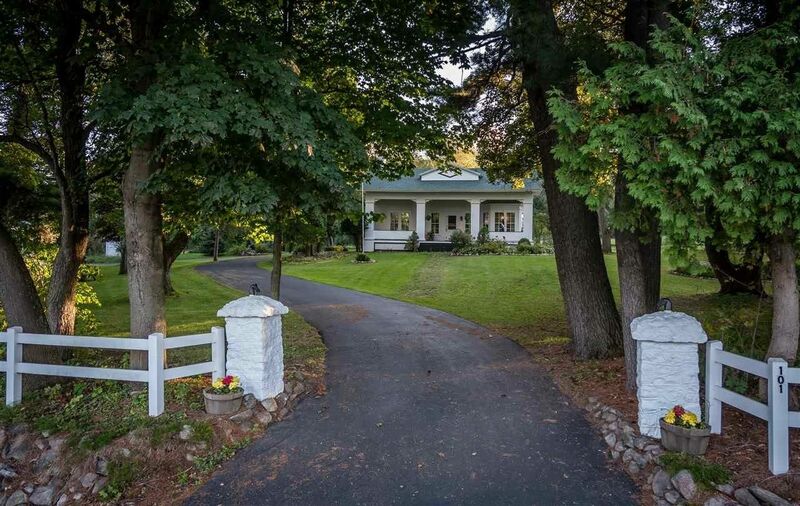 It should be easy to identify with its arched door and matching arched garden entry. Plus those stepped windows on the right front gable (staircase and bathroom) are very unique. 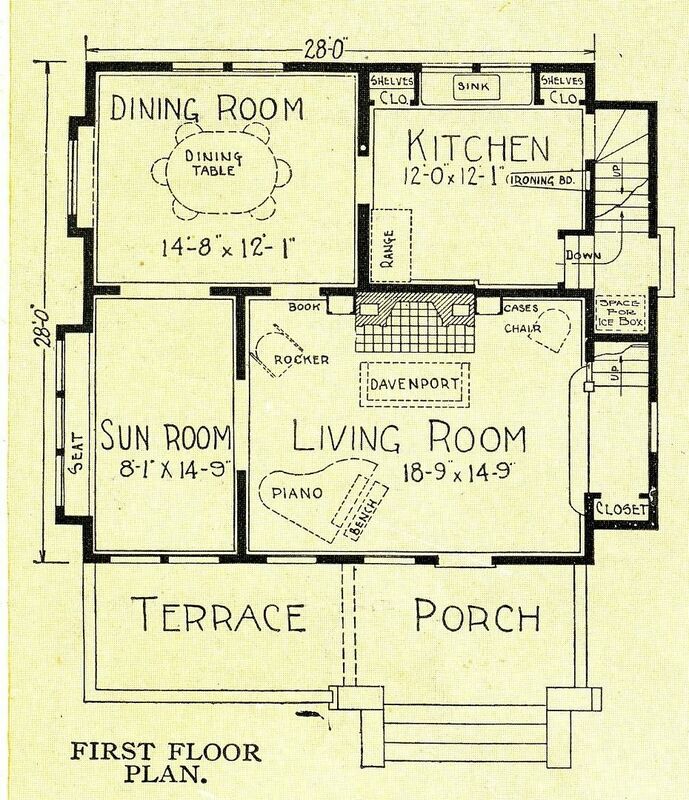 This house was offered only in 1929 and 1930, so there should be a couple of these around. 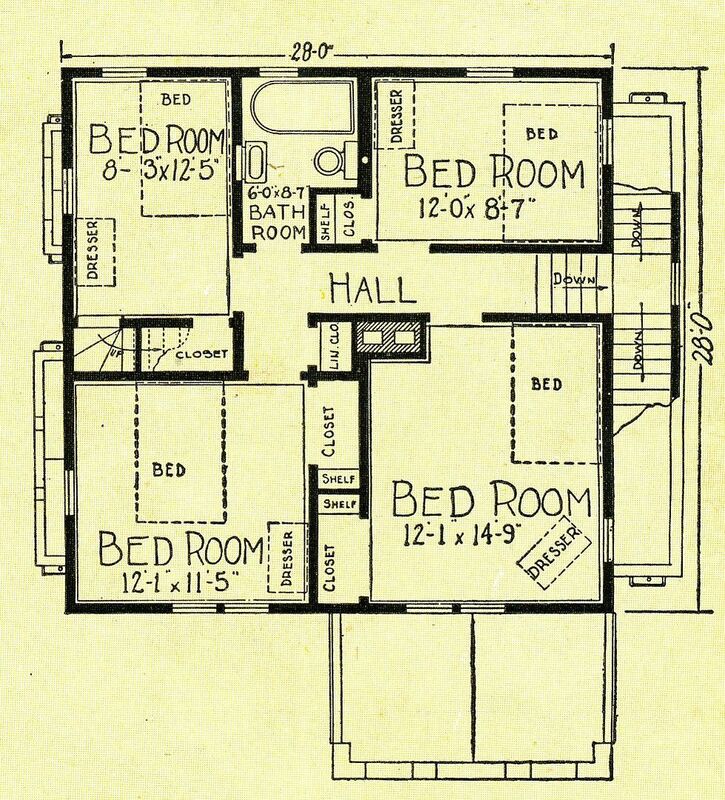 The floorplan is shockingly small, but it does have a half bath on the first floor. 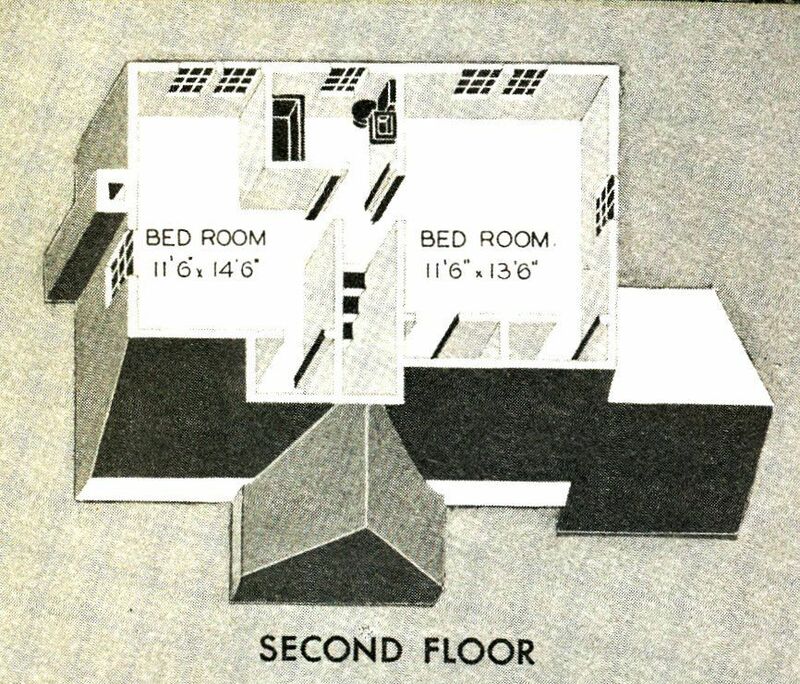 The second floor has two modest bedrooms and one really small bedroom. And here's the tudoring lesson for the day: "The Sherwood is an Americanized English type..."
Forensic artists create "enhanced images" of people after the passage of 10 or 20 years. 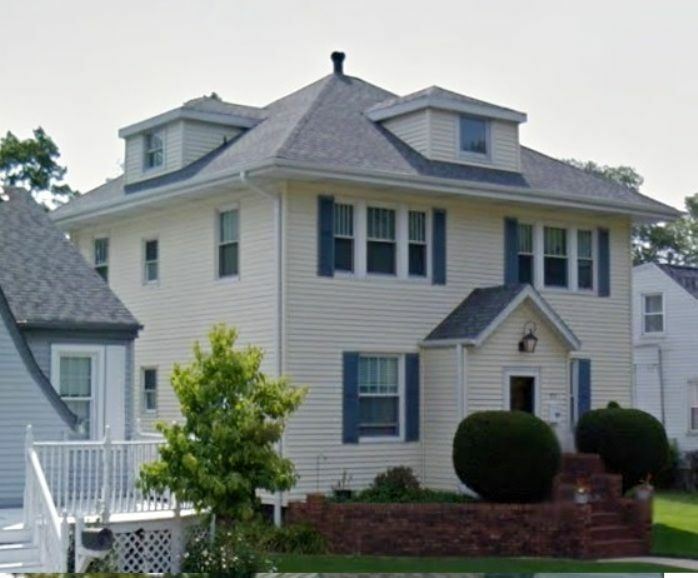 I wish someone could do an "enhanced image" of a Sherwood slathered in aluminum siding and vinyl windows. That might help a bit. Click here to join our merry band on Facebook. The Sears Monterey - In Real Life! 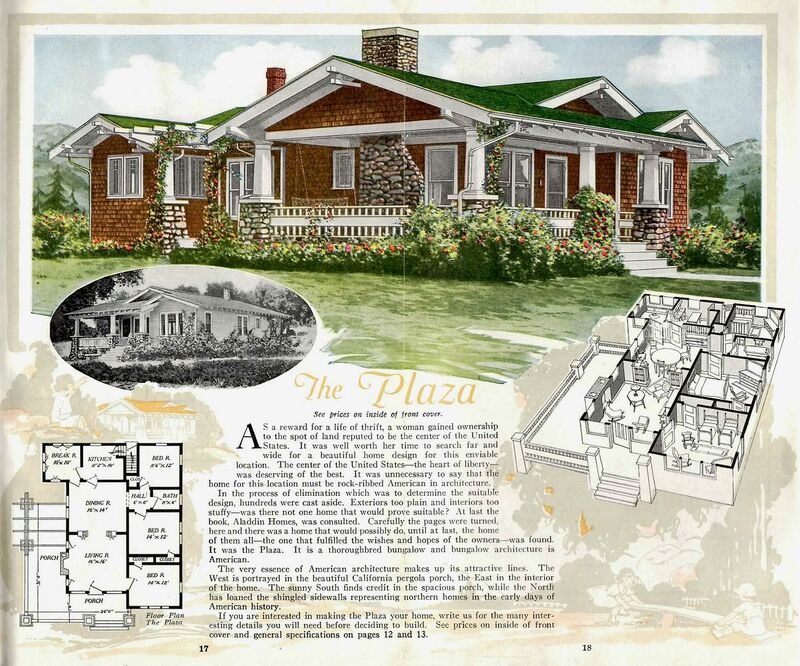 Just two months ago, I wrote a blog lamenting the fact that I’d never found a Sears “Monterey.” Last night in our Facebook group, I learned that Jennifer Hoover-Vogel found one of these very rare Sears kit homes in Mechanicsburg, Pennsylvania! 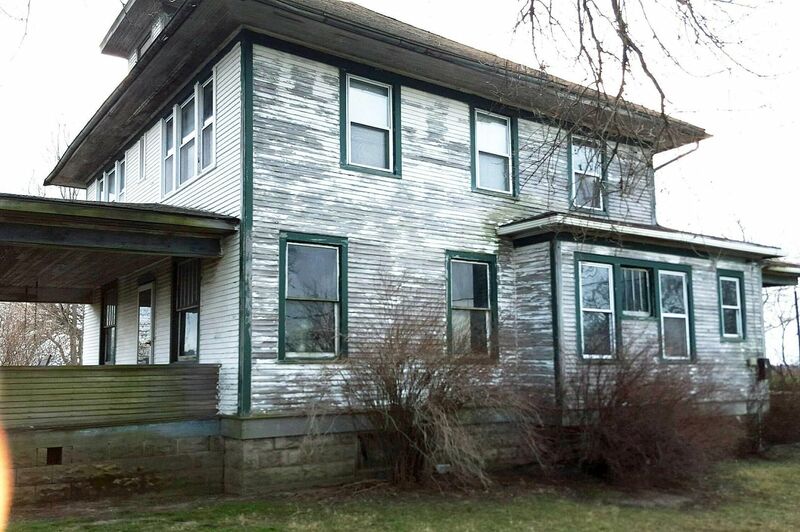 Now as you feast your eyes upon this kit-house beauty, you’ll note it’s had some siding installed over the stucco (sad face), and the windows have been removed (oh dear), however, it’s still standing and there’s something to be said for that. Many thanks to Jennifer for finding this treasure! And thanks to the unknown (but delightful, generous and lovely) Realtor who posted these images when the house was for sale. To read read about the Alhambra (a kissing cousin), click here. Same footprint as the Sears Alhambra, but slightly different exterior. Upstairs is a little different from the Alhambra, too! That is one sweet little house. 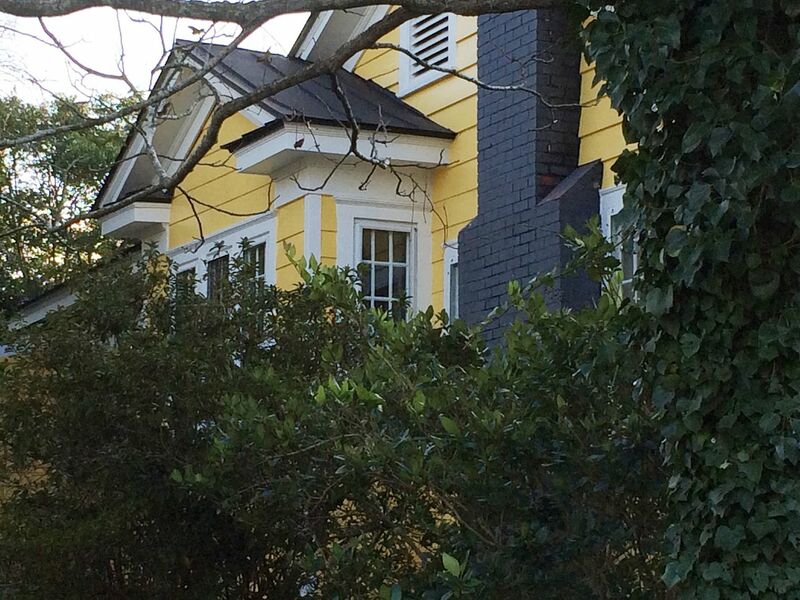 Check out the parapet on the porch, dormer and staircase wing. 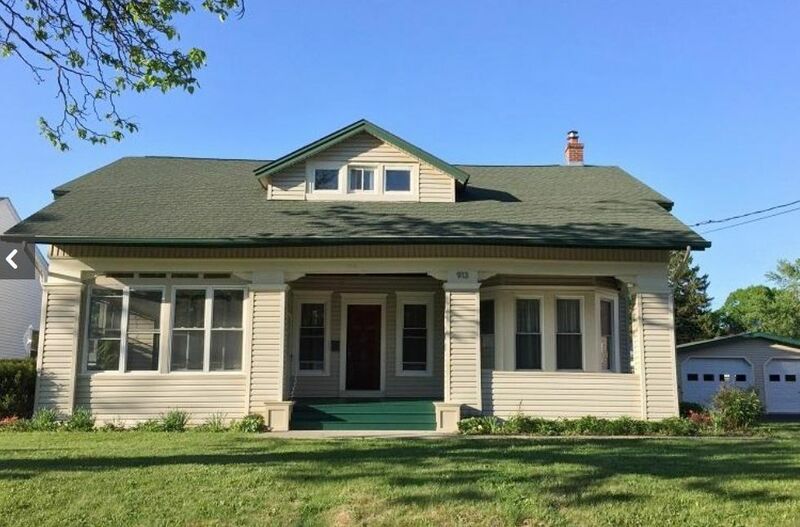 Well, they put a hurting on that front porch, and they replaced the windows with something rather, uh, less than ideal, but other than that, it's a fine house. To a flat-lander tourist such as myself, that stonework is stunning. That is a fancy floor. 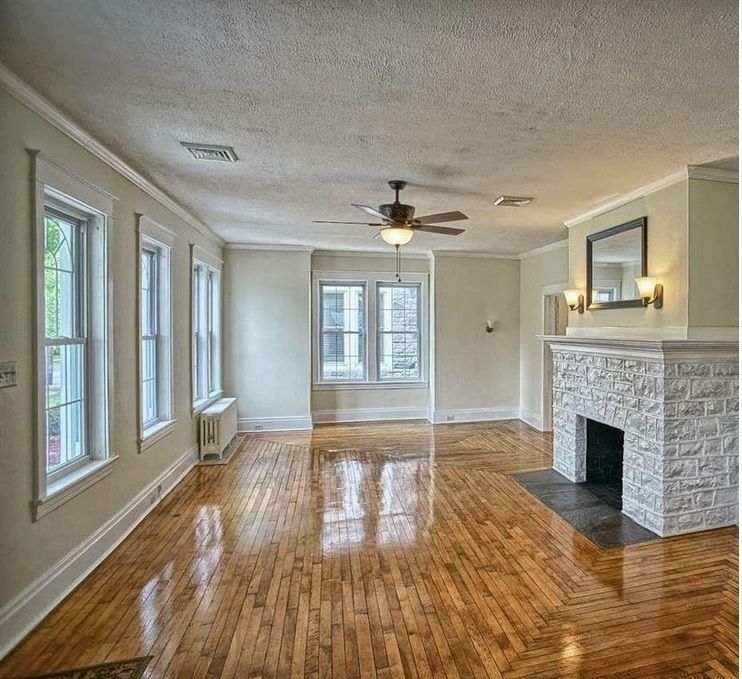 I wonder if the home's original owner had a background in flooring, and did his own "upgrade" while the house was under construction. 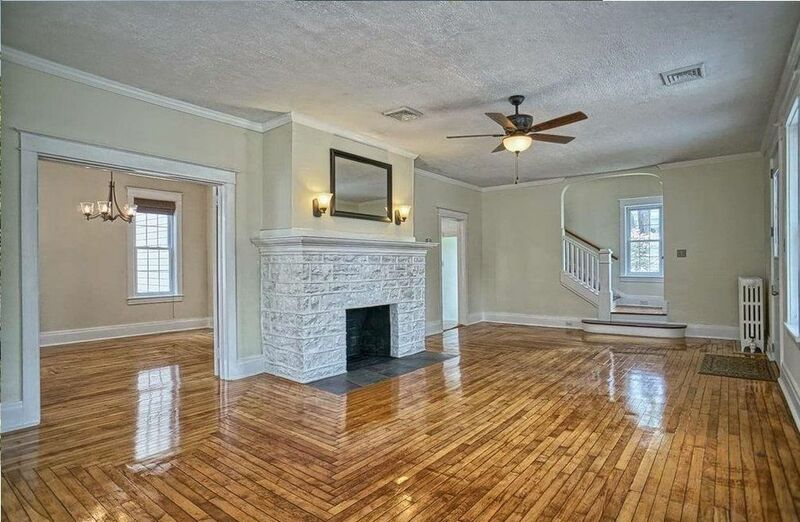 Another view of that beautiful floor and lovely fireplace. The kitchen's had a real hurting put on it, but from what I've read, there are people in the world that like this kind of thing. Honestly, I wish I was one of them. It sure would simplify my life. 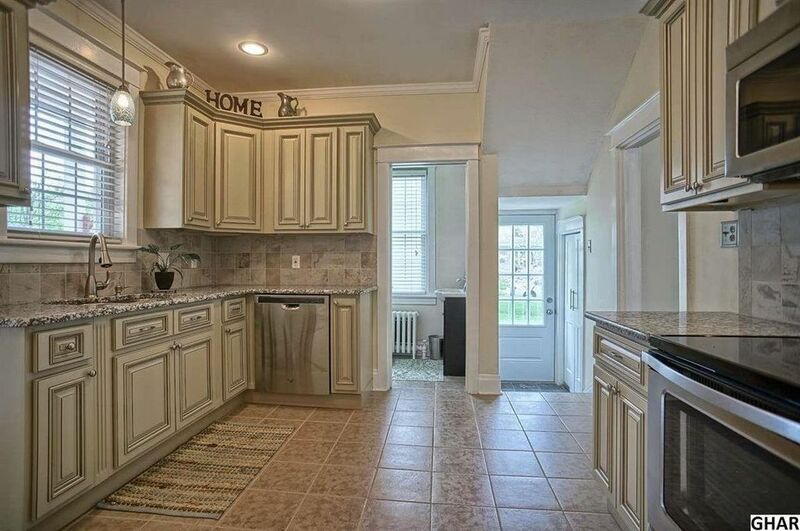 I am intrigued by the sign on top of the cabinet that says "Home." 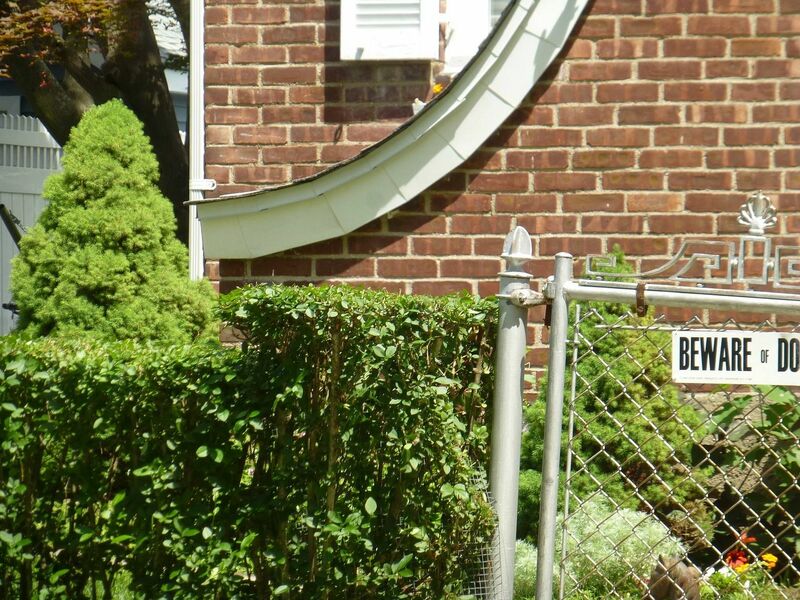 Is that in case someone forgets where they are, and start thinking that they're at a neighbor's house? It's a puzzle. Another view of the kitchen. 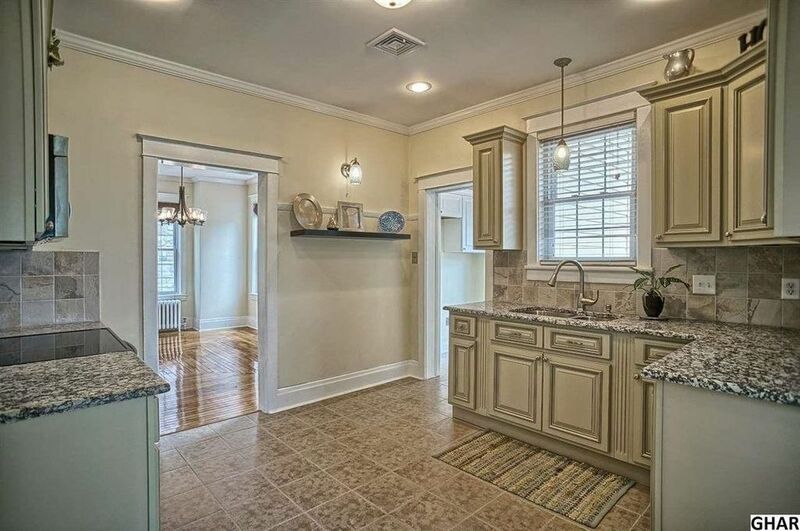 I'm highly allergic to stainless steel, beige tile floors, French provincial cabinetry and granite countertops, so that explains why this kitchen would be difficult for me to visit. There's that "home" sign again. 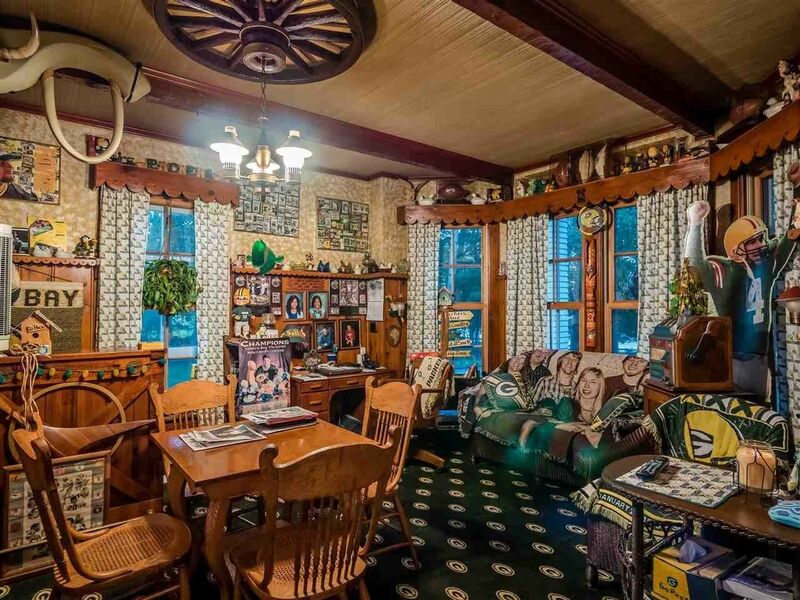 Other than that, great dining room. The bathroom is more my style. 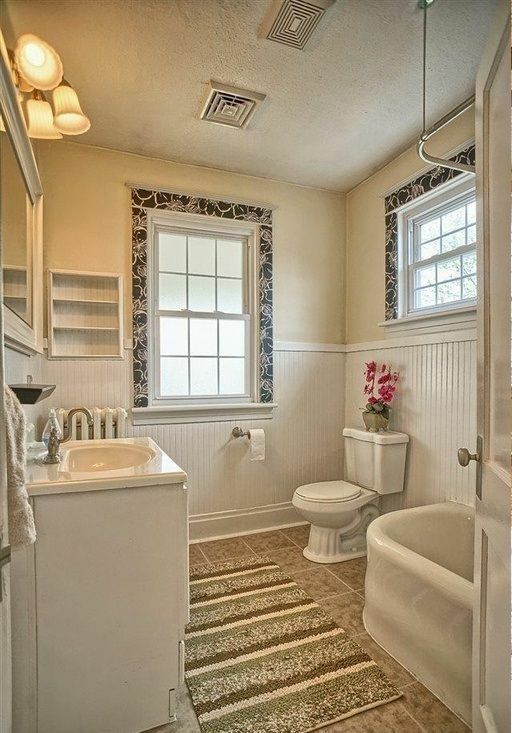 That double-apron porcelain tub makes me swoon. 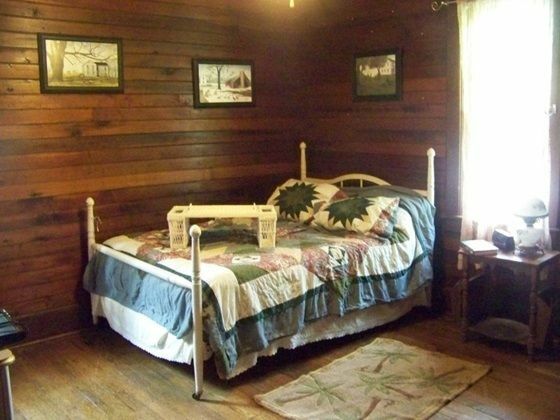 The bedrooms in this house seem unusually spacious. See that step to the left? 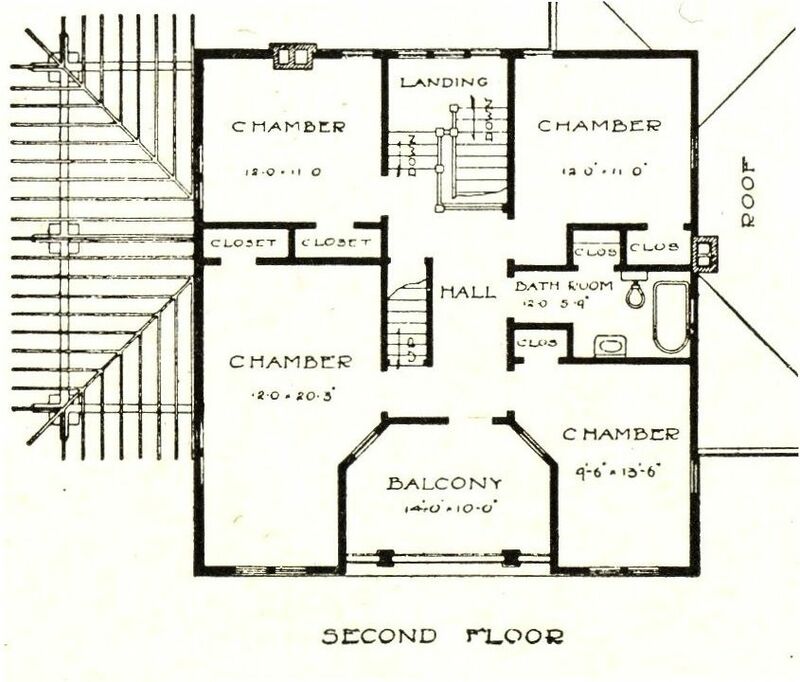 It's on the floor-plan and is an access to the attic. Even the back of the house is lovely! Wait, is that a koi pond? Okay, sign me up. I want the house. And the pond. A comparison of the two images. Fun house, isn't it? And thanks to the unknown (but delightful, generous and lovely) Realtor who posted these images. 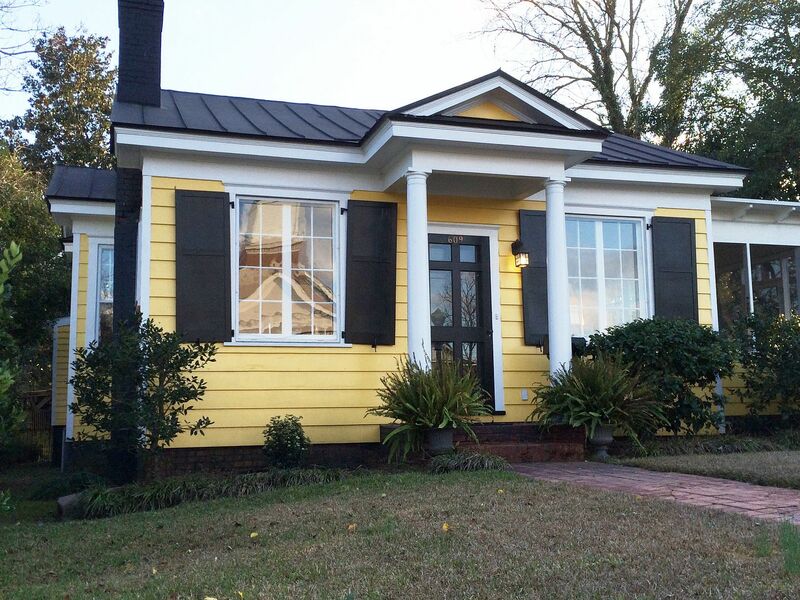 How did New Bern come to have so many kit homes? 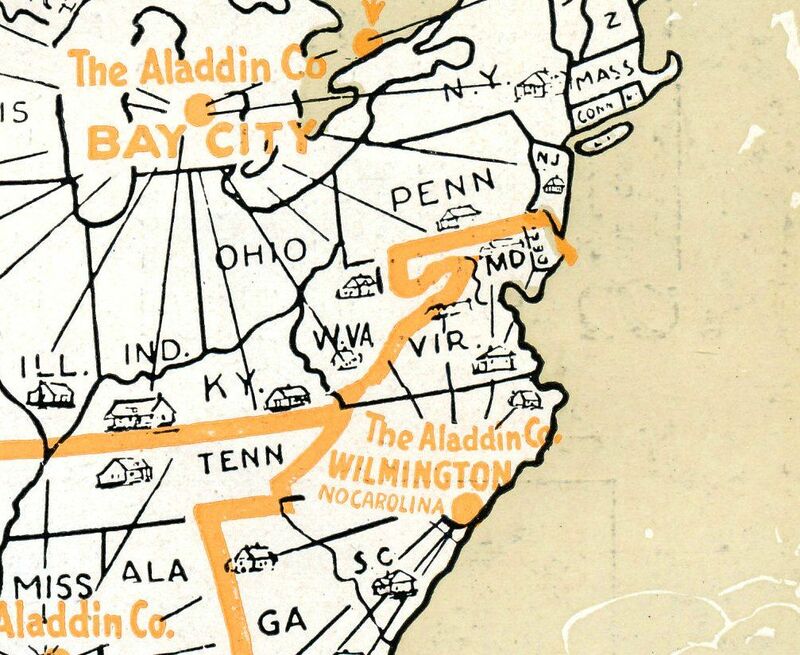 Is it because of New Bern’s proximity to Aladdin’s largest mill in Wilmington, North Carolina? Perhaps, but how does that explain the grandiose Sears Homes I found on Spencer Street? It’s a mystery, but I hope it’s one that this community will fully explore! 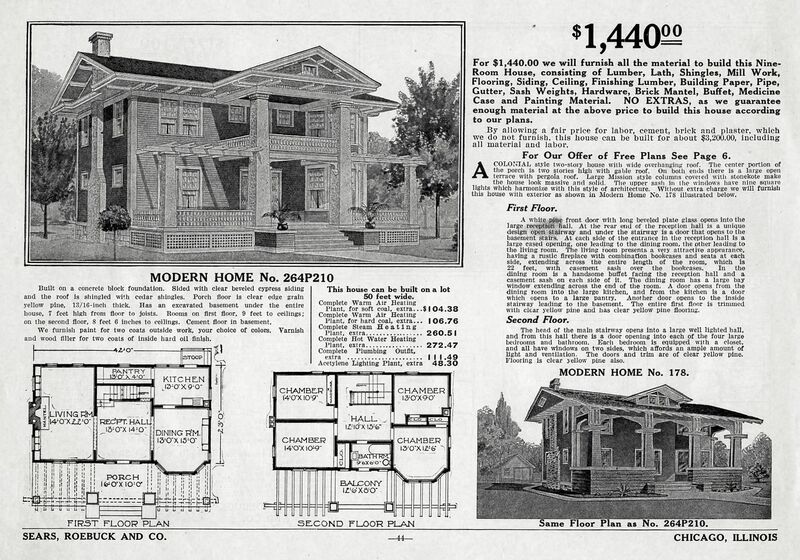 Sears is the best-known name in the kit home business, and they started selling houses through their mail-order catalogs in 1908. These “kits” came in a boxcar in 12,000 pieces, and included a 75-page catalog that told you how all those pieces and parts went together. 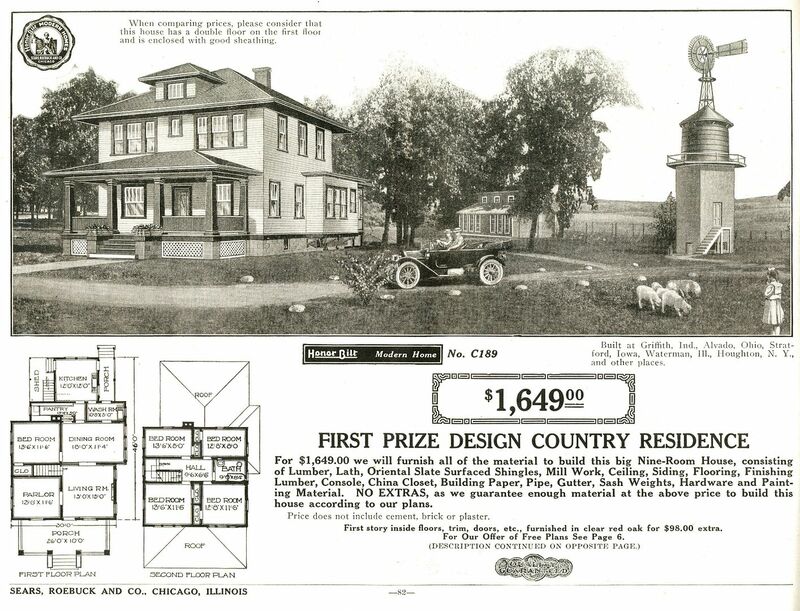 Sears promised that a “man of average abilities” could have the house complete and ready for occupancy in about 90 days. Sears closed their “Modern Homes Department” in 1940, and during a corporate house cleaning, all sales records were destroyed. The only way to find these homes today is literally one by one. 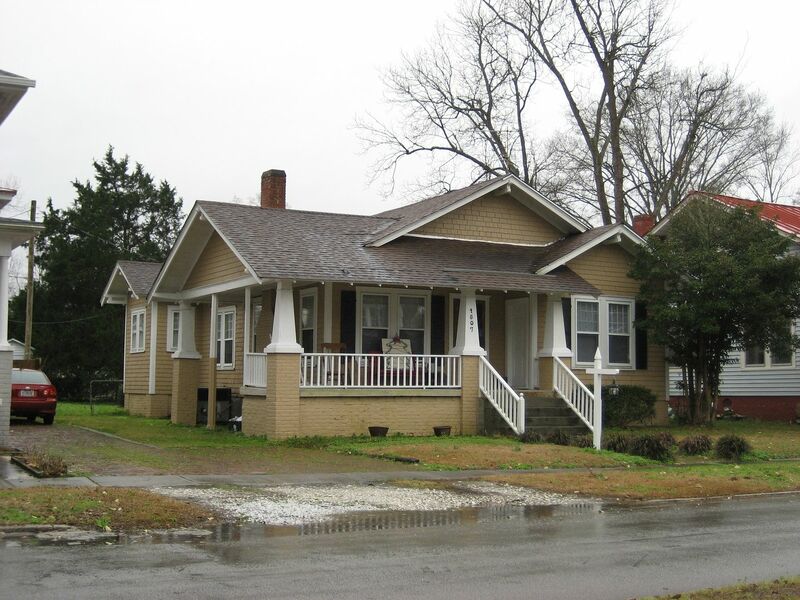 I’m confident that New Bern has many more kit homes than shown below. I saw less than 30% of the town, and I went through that 30% very quickly! 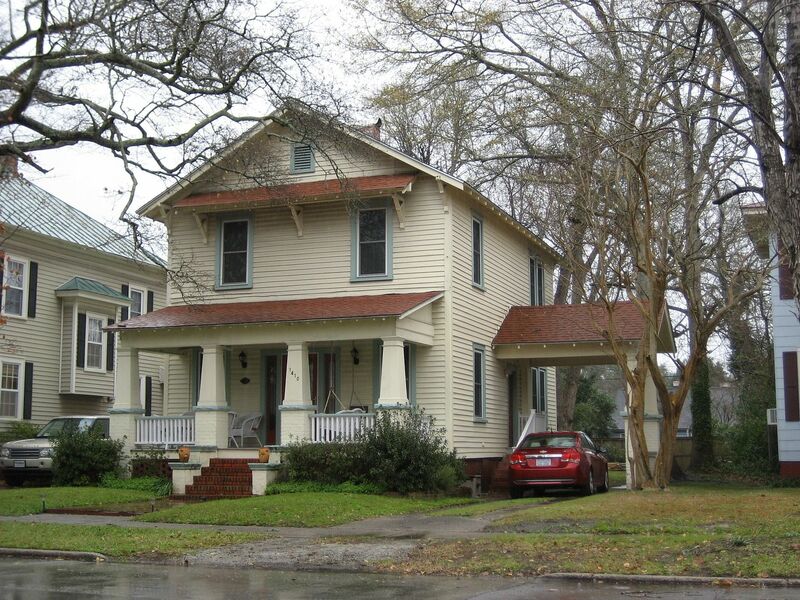 I’d love to return to New Bern soon and do a proper, thorough street-by-street survey. If you enjoy the information and pictures, please share this link with friends on Facebook and/or via email! To contact Rose (who art in Norfolk) about returning to New Bern, please leave a comment below! 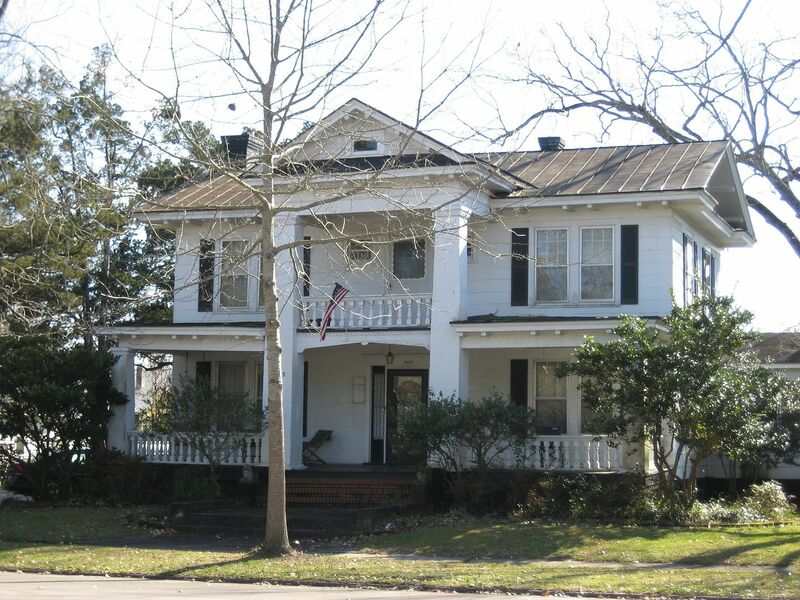 To read the prior blog on New Bern, click here. 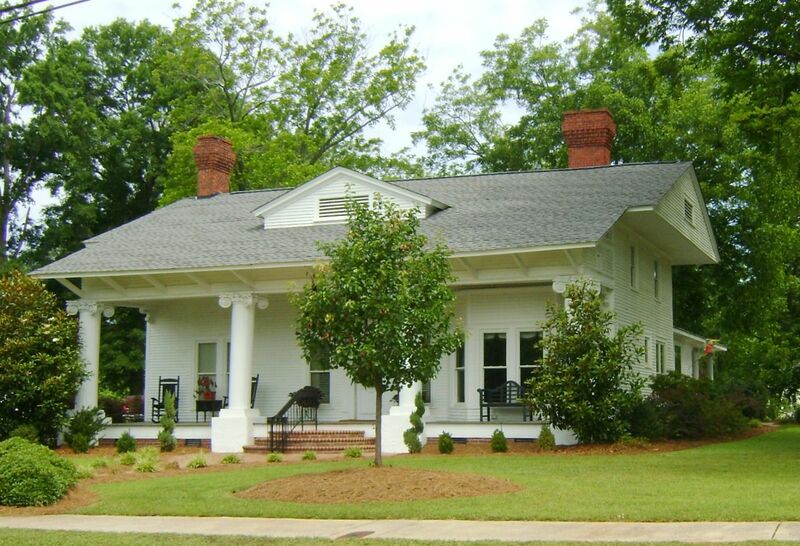 Read about The Peach House in nearby Kinston here. New Bern has many Aladdin kit homes. Is that due to their proximity to a large Aladdin Mill in the southern part of the state? Most likely, yes. Image is from the 1923 Aladdin catalog. One of my favorite finds in New Bern was the Aladdin "Hampshire" located in the heart of the historic downtown. 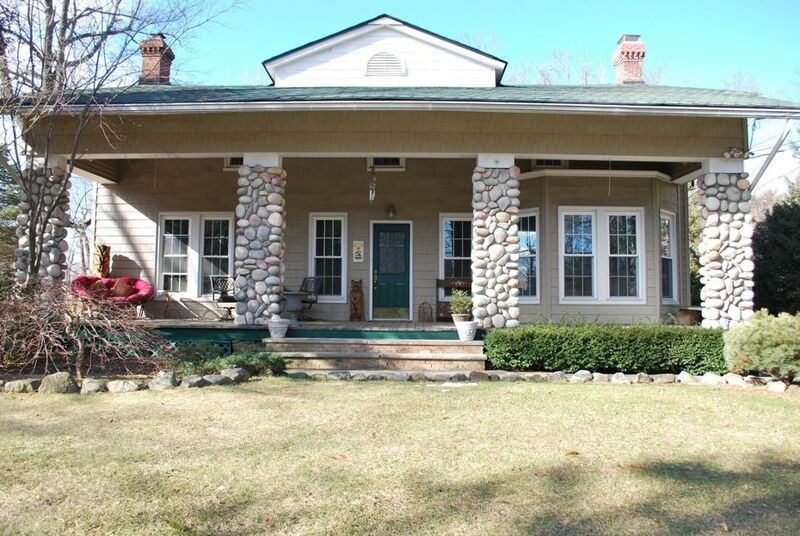 This house was offered in the early 1920s. 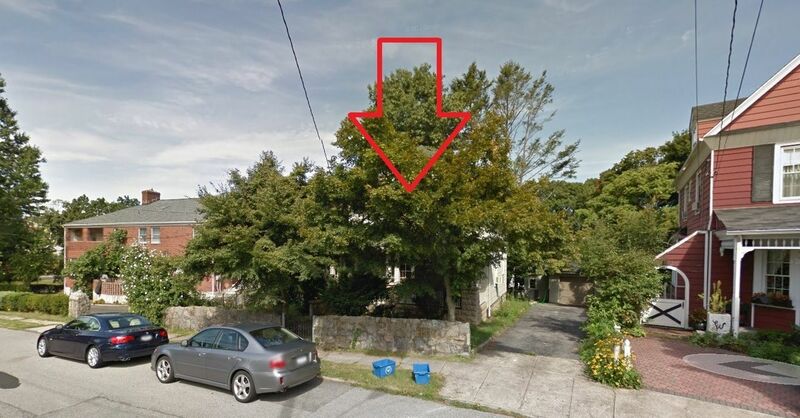 This must surely be infill, because the houses around it all date to the mid-to-late 1800s. It's a beautiful little house in wonderful condition. And it retains its original casement windows! 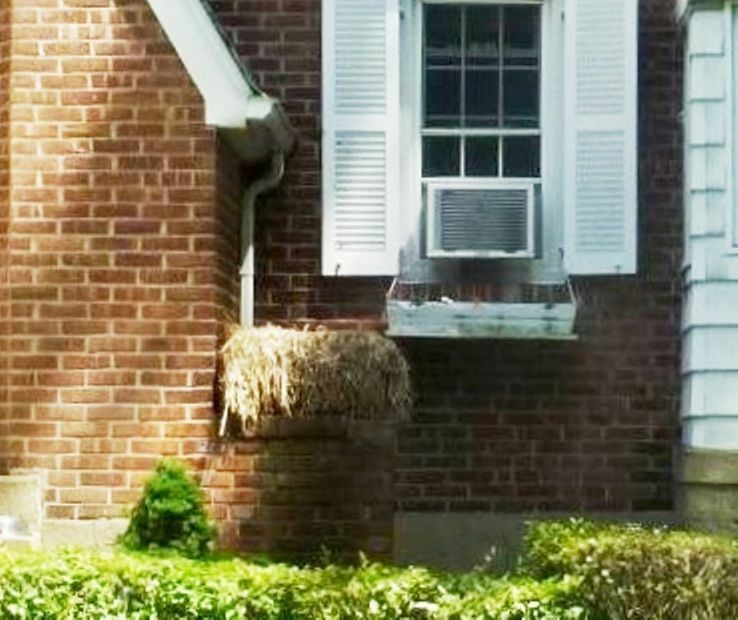 Due to heavy landscaping, I had trouble getting a good shot, but you can see that little bay window poking up from the bushes, and the small fixed sashes flanking the fireplace. 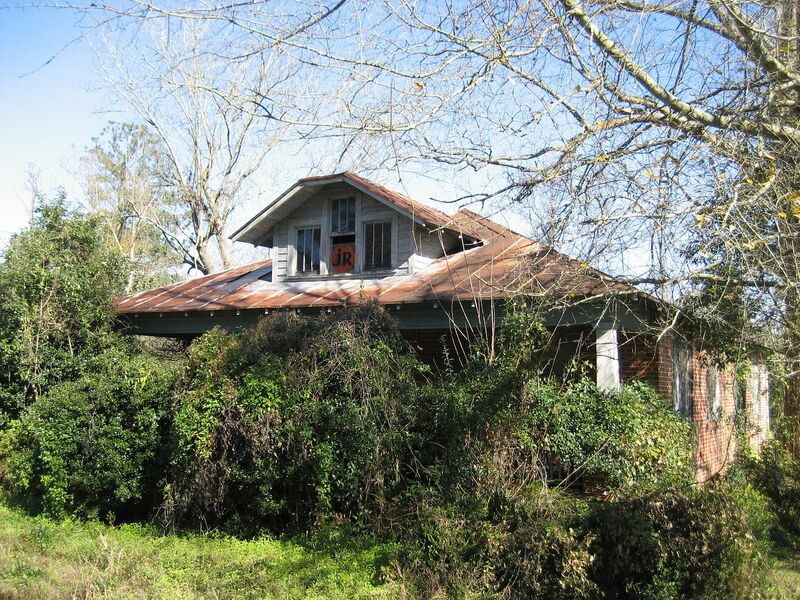 It's a thrill to see a 90-year-old house in original condition. What a cutie! 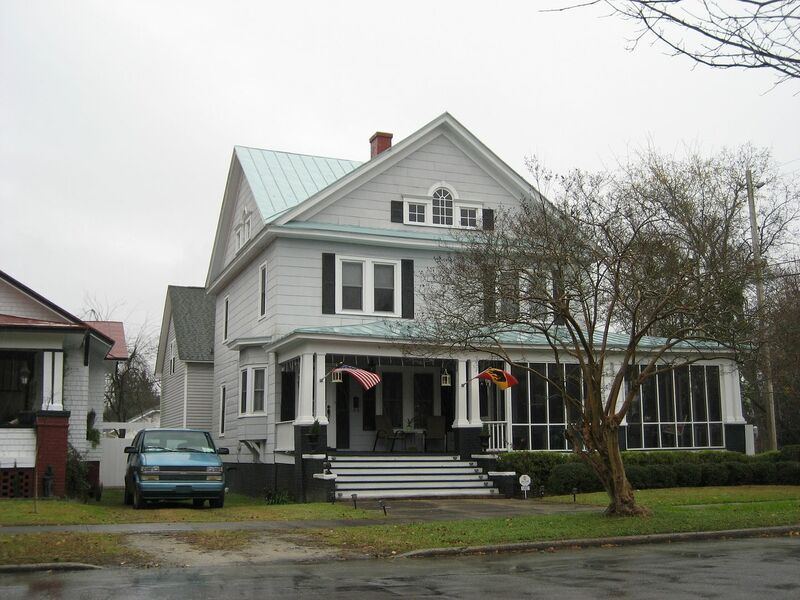 The house in New Bern is "flipped" (the mirror image). The Aladdin Plaza was another very popular house for Aladdin (1919). Is this an Aladdin Plaza? Given its proximity (near other Aladdins within Ghent), I'd say it's likely. 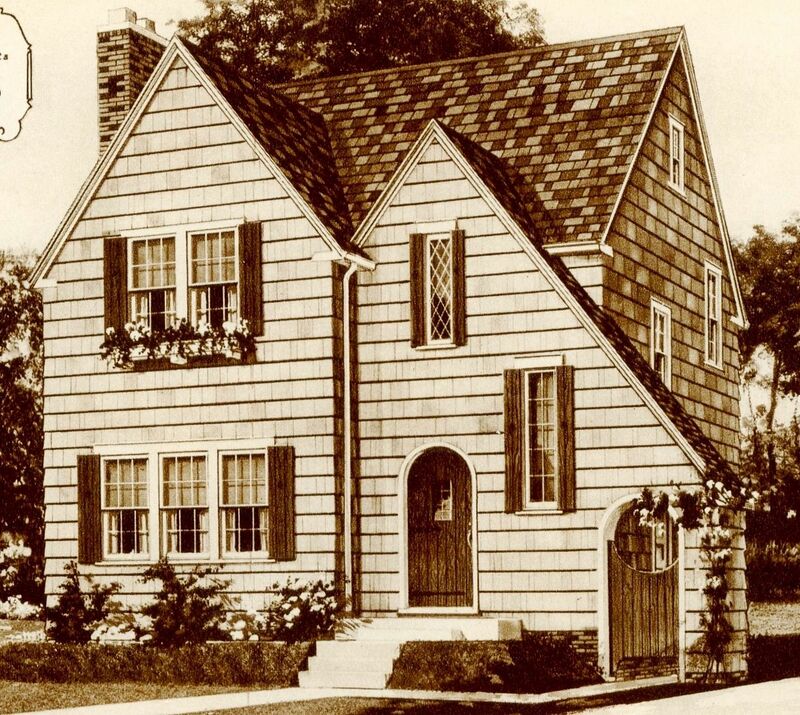 The Pomona was one of Aladdin's most popular homes. I saw two of these in New Bern, and neglected to capture the address of the second one. The first one (in Ghent) is shown below. It's a terrible picture, but it shows a piece of the Aladdin Pomona in New Bern's Historic Ghent neighborhood, on Spencer Avenue. 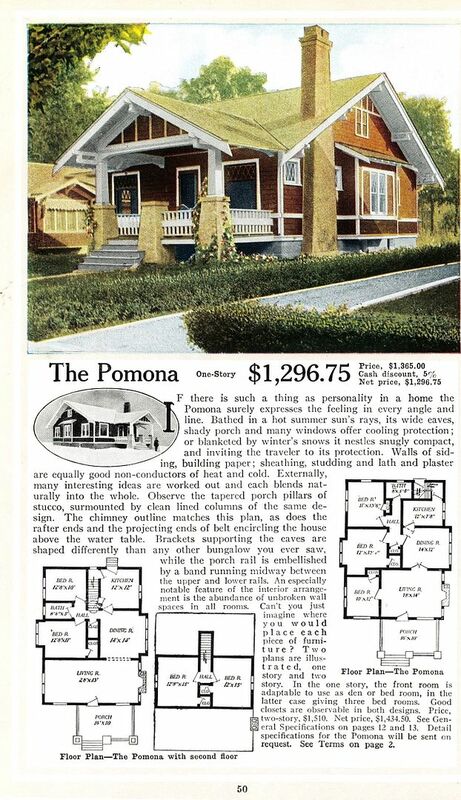 It's definitely a Pomona, but has endured a great deal of remodeling. 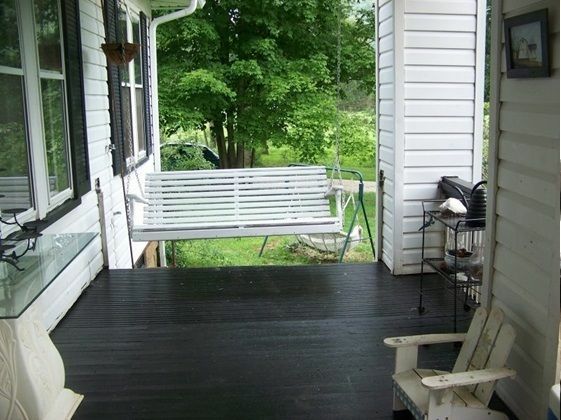 The front porch is 100% enclosed. 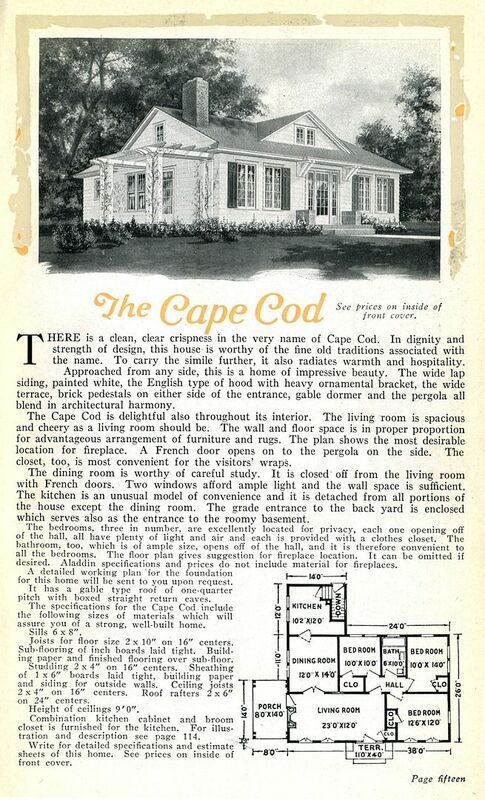 The Aladdin "Cape Cod" (1923) was another popular kit home. Did someone order an Aladdin Cape Cod from the Wilmington Mill and say, "Supersize Me"? It is a nice match to the Aladdin, but it's much too wide. It's likely that this is a pattern-book house, but I haven't been able to find a corresponding match in my collection of early 1900s pattern books. More than 30% of kit homes were customized, so it's possible this was ordered "extra large" from the Aladdin mill. 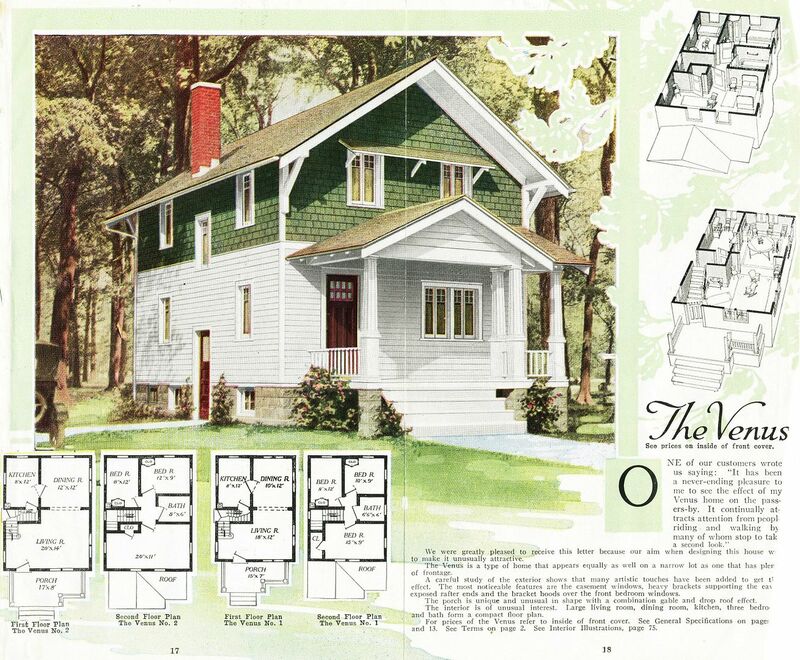 Gordon Van Tine, like Sears and Aladdin, also sold kit homes through a mail-order catalog. Shown here is the GVT "Roberts"(also known as the #560). And here's a near-perfect Roberts I found on Rhem Avenue. 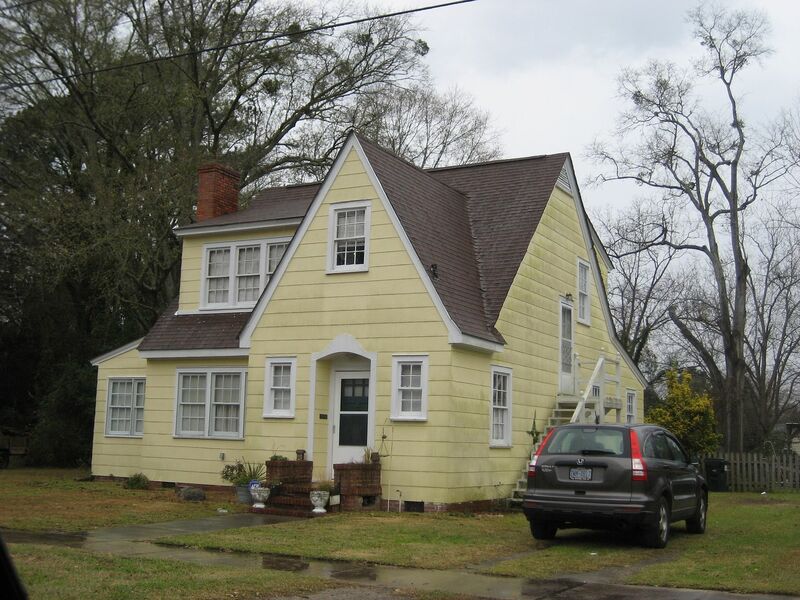 Within New Bern, I found two of these Gordon Van Tine homes, but neglected to make a note of the address. 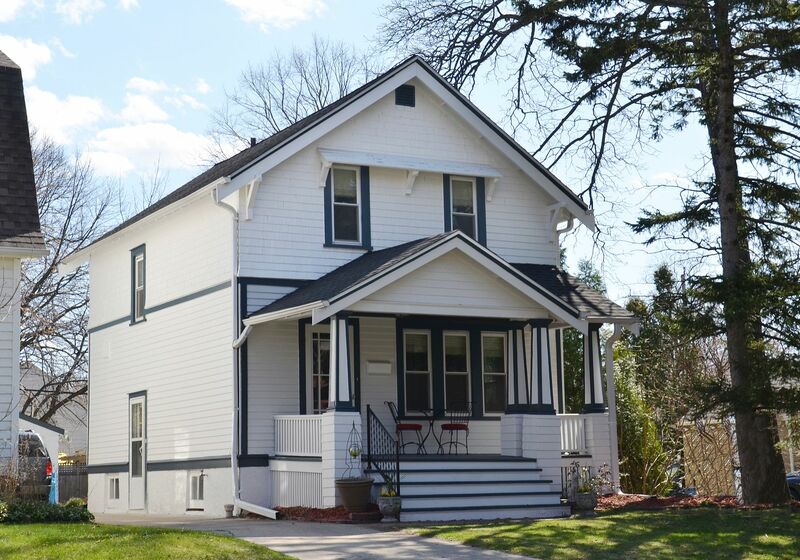 The porch on this house and those clipped gables are what first catch your eye. If you find this missing "Mt. Vernon," please give me an address (and a photo)! And now Sears. 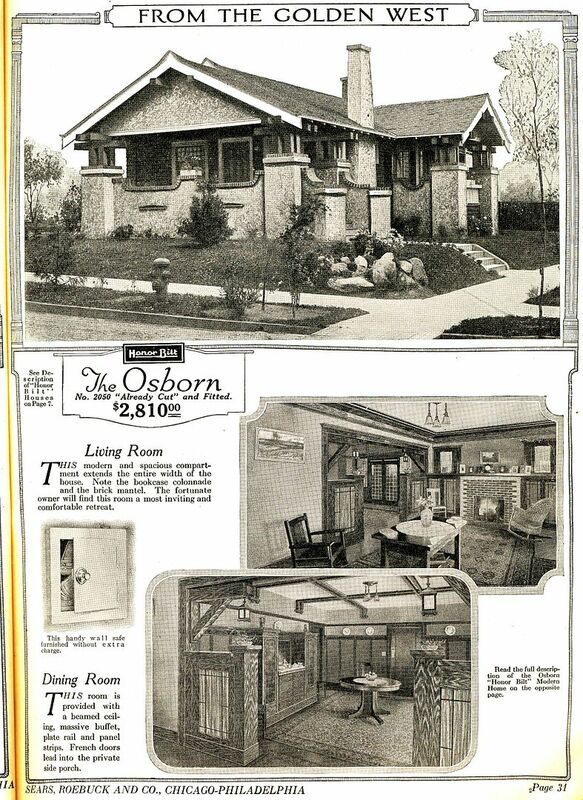 The Sears catalog identified the "Osborn" as a bungalow "from the Golden West." 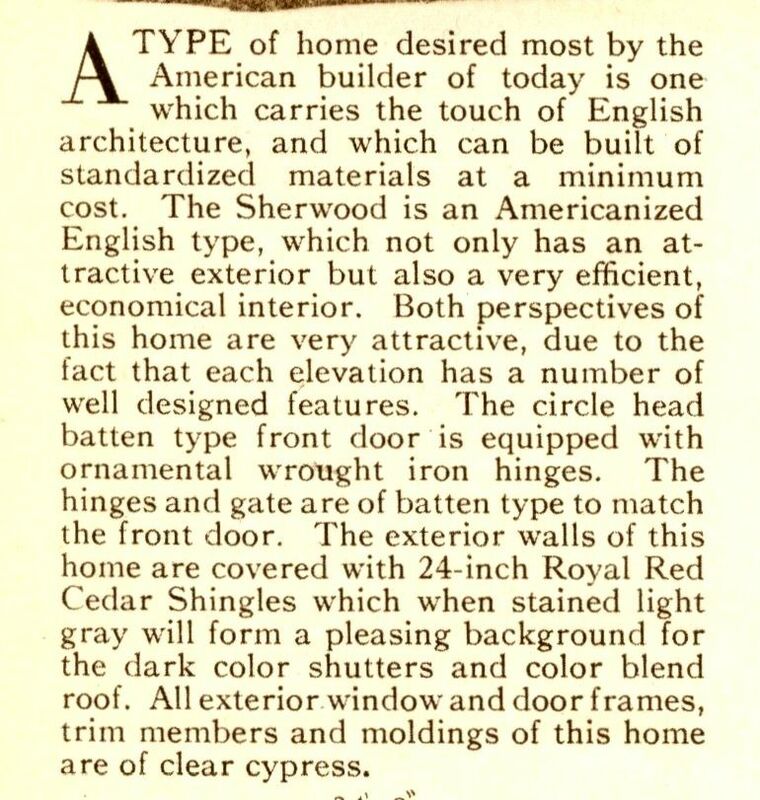 It's distinctive and easy to pick out in a crowd (1921 catalog). 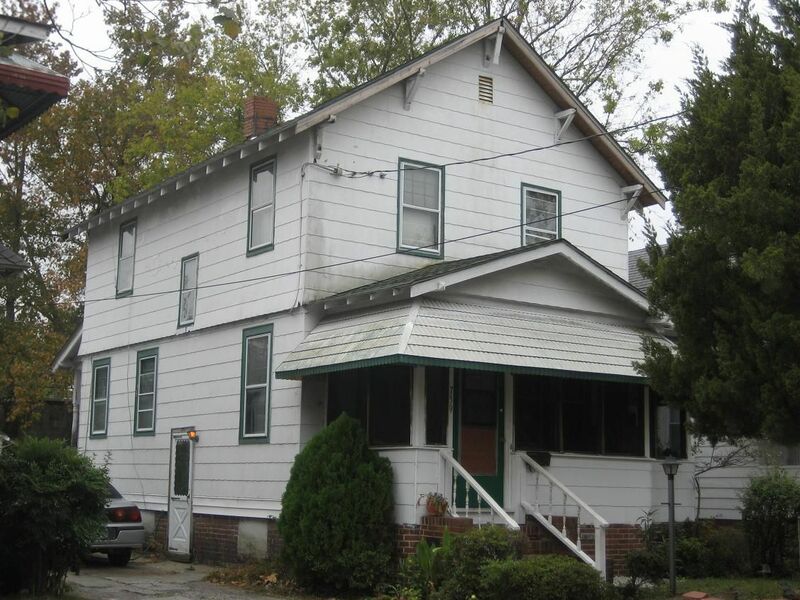 It's had some remodeling, but it's very likely that this house on Spencer Avenue is the real deal: A Sears Osborn. 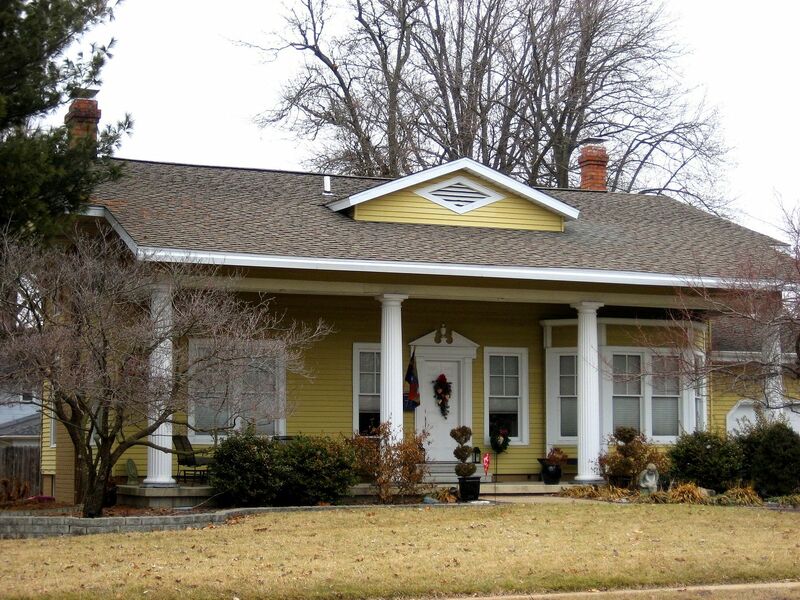 Check out the tapered chimney, rafter tails and detailing on the porch railing. The Sears Roanoke is another distinctive Sears house (1921). 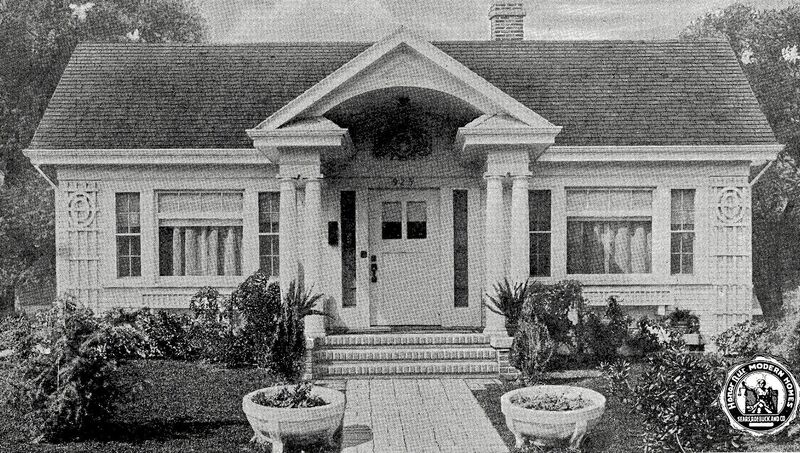 That side entry (originally with a pergola) is a unique feature of the Roanoke, as is the wooden awning and symmetry on the home's front. It's so lovely to see that awning still in place. And look to the left. What's that next door? Boy oh boy, it's hard to know for sure. 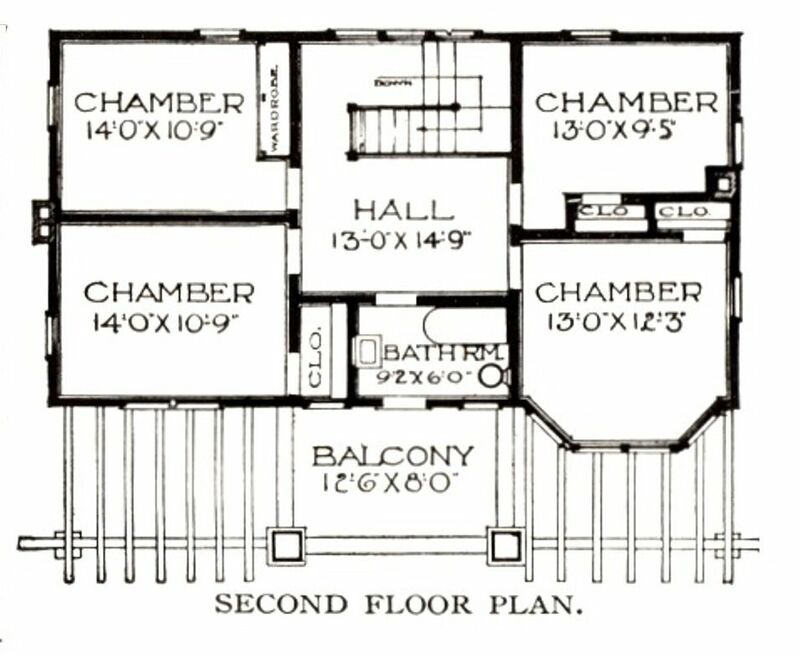 In that the "Chelsea" (also known as #111) in New Bern was built without a basement, that side with the staircase bay is not going to have a doorway under it (as shown here). I'd have to see this house up close and personal to make a positive ID. For now, I'd say it's a "definite maybe." Just down the street from the Roanoke and Chelsea is something that looks a lot like a Sears Saratoga. Is this a Sears Saratoga? The Saratoga is 30 feet across the front. 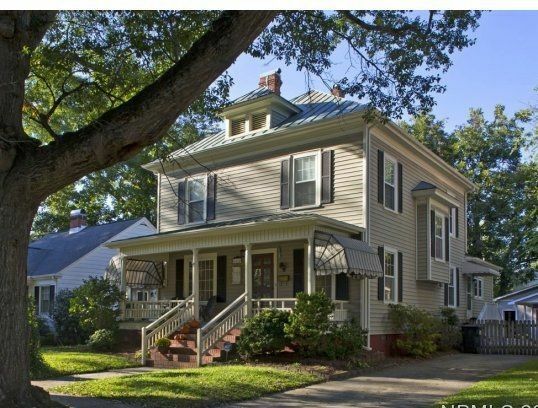 This house in New Bern looks much wider than that. Again, was it supersized? 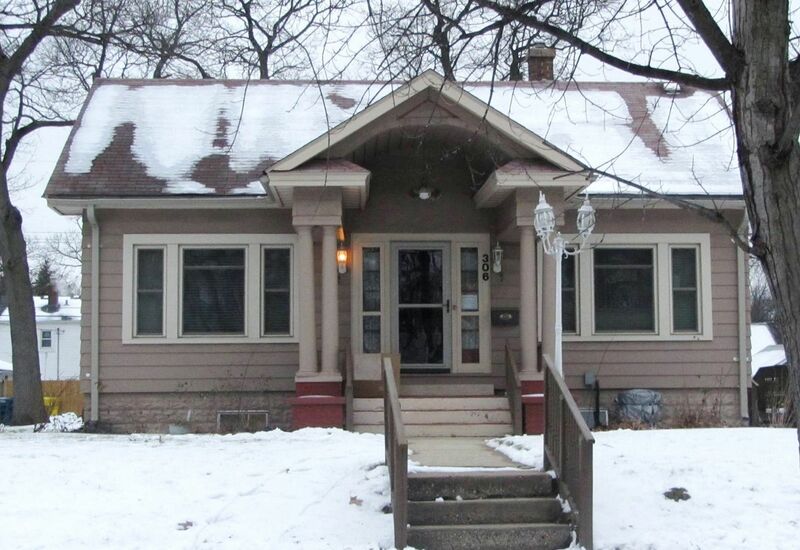 It's another house that is a "definite possibility." I'd need to see the interior to make a proper judgement. It certainly is a good match in many other ways. The majestic Milton (1918 catalog). What a glorious house, and it's in such beautiful condition! 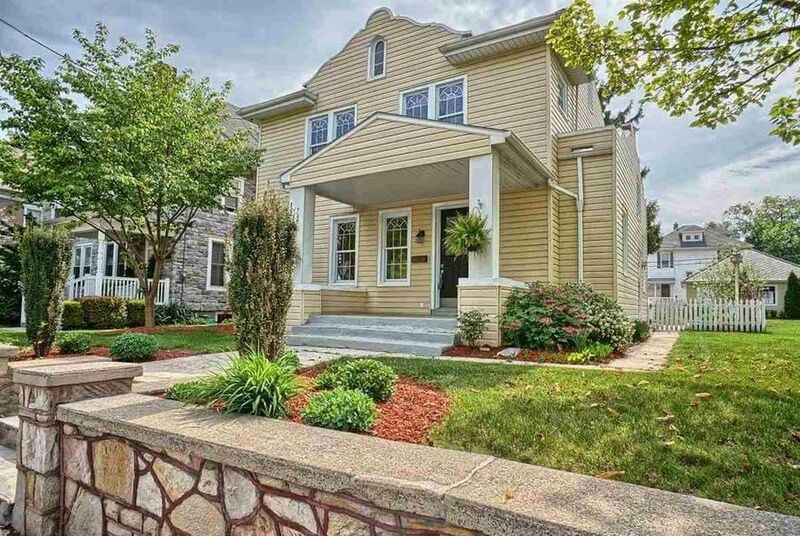 And just across the street from the Milton is Modern Home #178. It's the ONLY #178 I've seen in my many years of traveling (25 states and 200 cities). What fun to scratch one more house off my "never seen this model" list! And right in New Bern, North Carolina. The Lynnhaven is a tricky model to identify authoritatively because it had so many "kissing cousins" that looked very similar. The position of the shed dormer and the depth of that front-facing gable are good clues for this model. Is this the Real Deal? Might be. It looks like a good match. 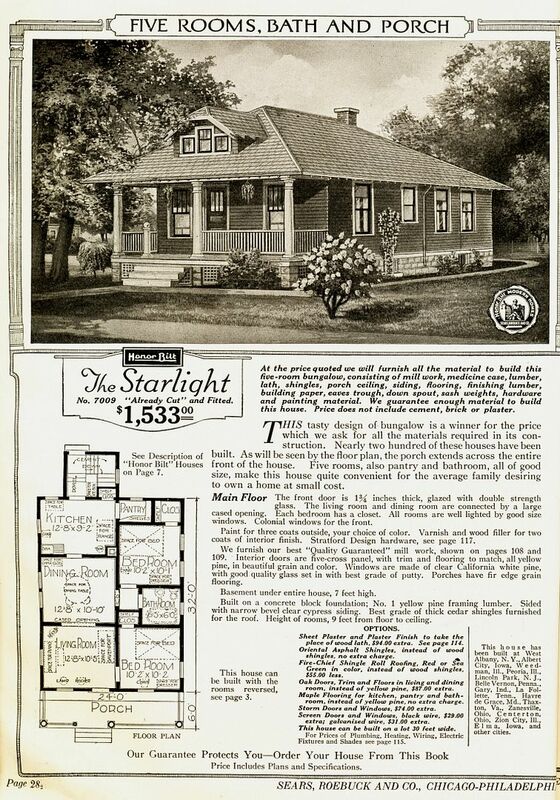 Last but not least is the sweet little "Starlight" (1921). Forlorn and forgotten, it sits next door to the RollerLand Skating Rink in the 3500-block of Neuse Blvd. Stay strong, little Starlight. Perhaps help is coming. Either that, or you'll be eaten by Kudzu soon, and it'll all be over. If you enjoy the pretty pictures, please share this link with friends on Facebook and/or via email! To read the prior blog I did on New Bern, click here. Oh My! Who Knew That New Bern Had So Many Kit Homes! Fun times in New Bern! 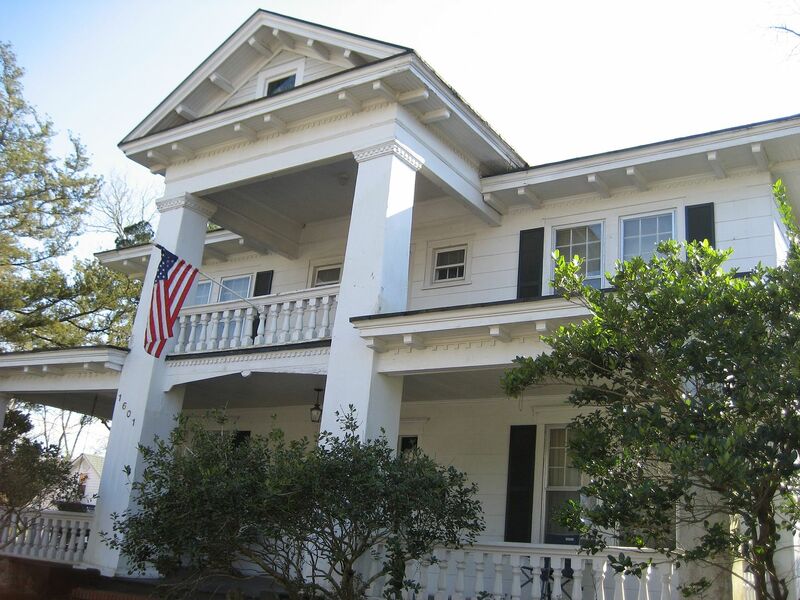 Mr. Hubby and I just returned from a visit to New Bern, NC where we stayed at the Aerie Bed and Breakfast and spent the days seeing the sights (and looking for kit homes). 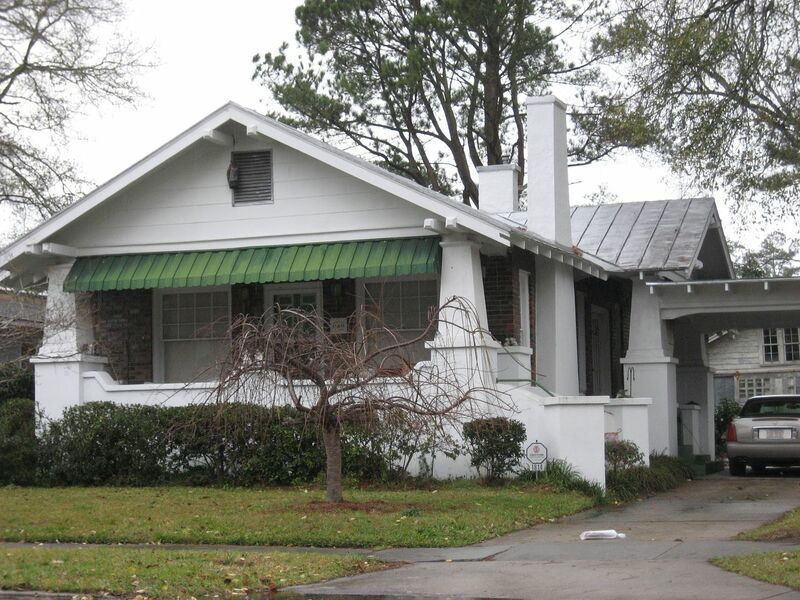 Within New Bern’s Ghent neighborhood, we found an abundance of kit homes, and (a nice bonus) one turquoise Lustron, (all-steel homes from the late 1940s). My favorite two finds within Ghent were the Sears Milton, and - just across the street - a Sears Modern Home #178 facing the Sears Milton. 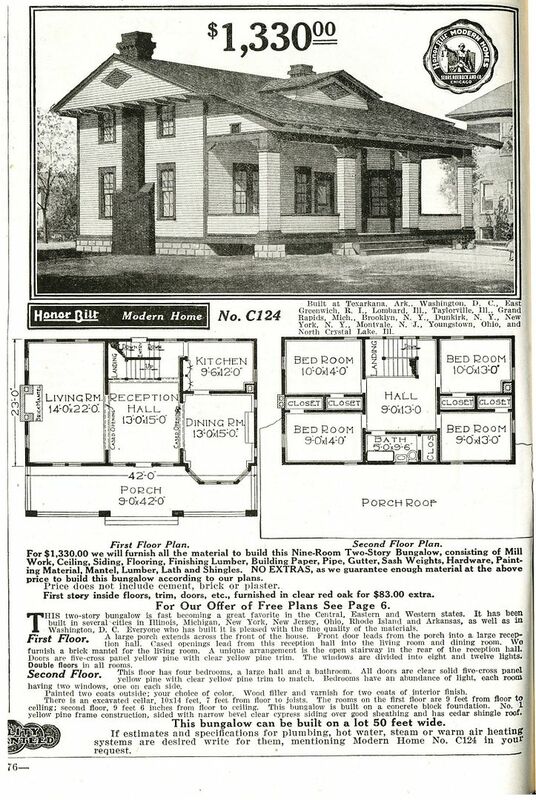 And here’s what’s even more fun: In the 1914 Sears Modern Homes catalog, Modern Home #178 was featured on the same page as the Milton. 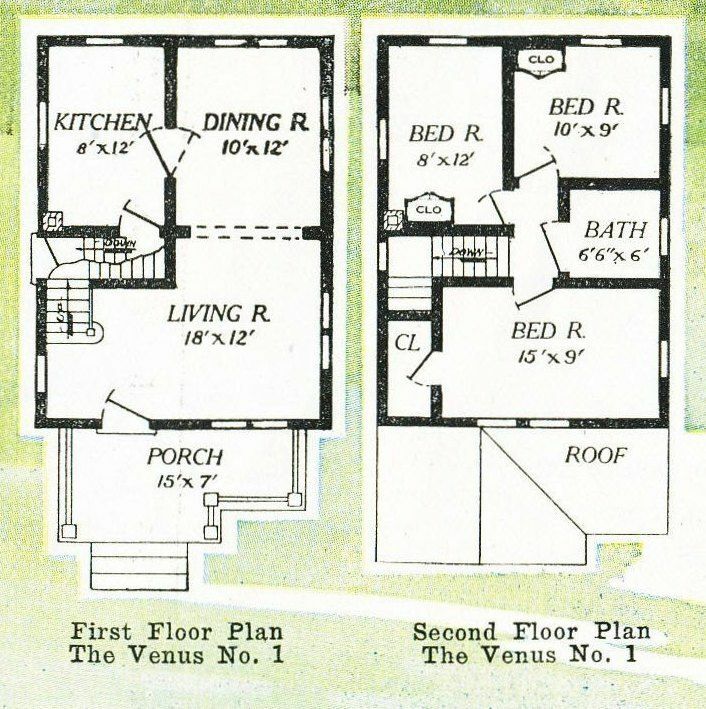 And I was surprised to find that these two radically different houses - The Milton and Modern Home #178 - share an identical floor plan! 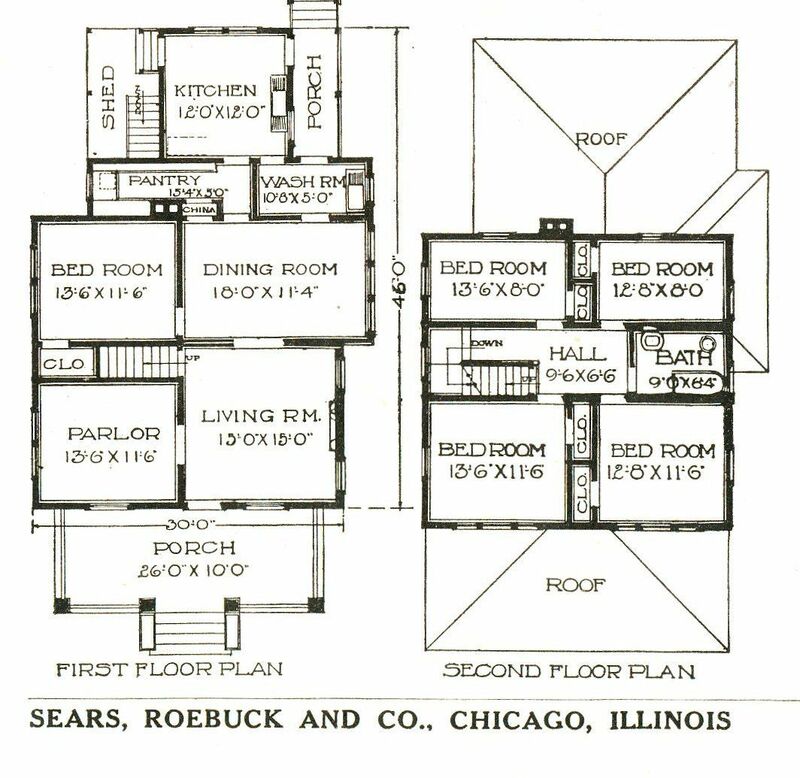 I’ve been playing around with Sears Homes for 15+ years and never noticed that before. 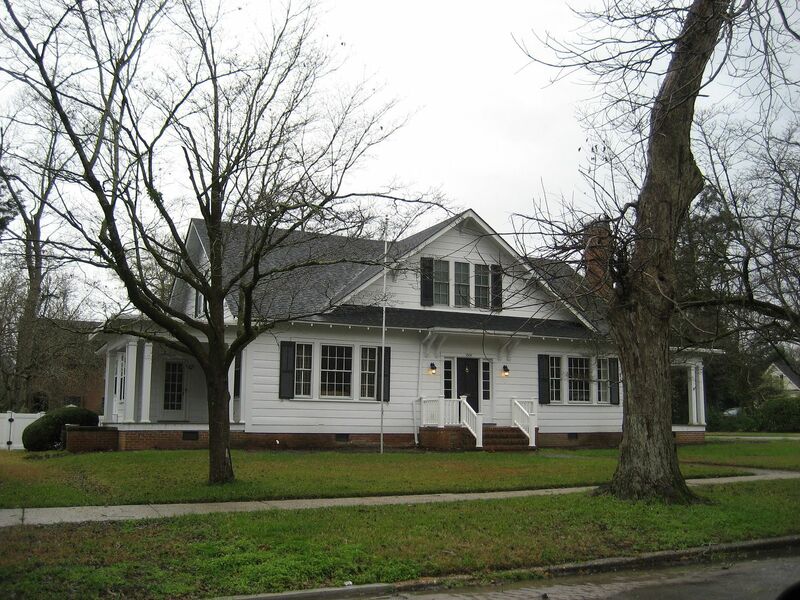 The next blog will showcase a few of the two dozen kit homes I found in New Bern, but today, it’s all about the Milton and it’s fraternal twin, Modern Home #178. To read more about the Milton, click here. Updated: Will I ever be able to return to New Bern? I doubt it. New Bern is the place where my husband and I celebrated our honeymoon, and also a second honeymoon in January 2016. And in January 2016, while I sat reading in another room of our suite, he made some phone calls in preparation of his upcoming suicide in April. Just seeing these pictures causes me so much strife. His suicide ruined every single thing. 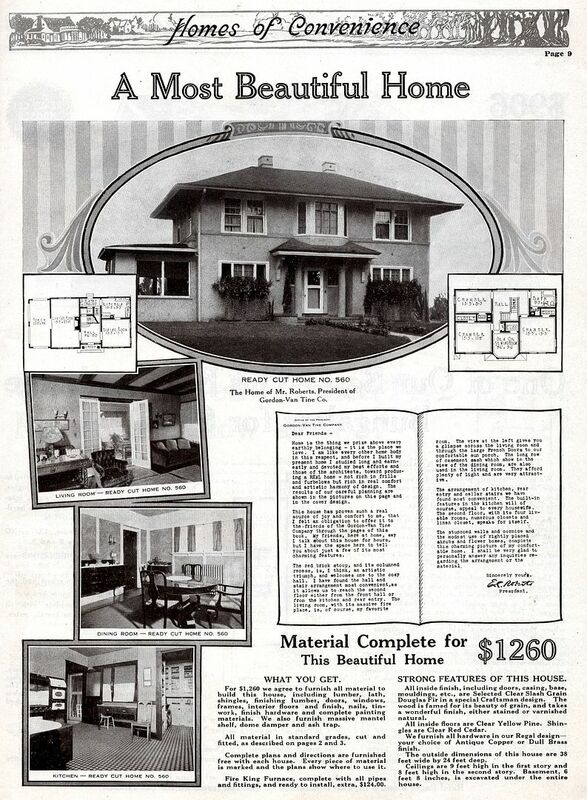 The Sears Milton and Modern Home #178: Two different models, one floor plan. 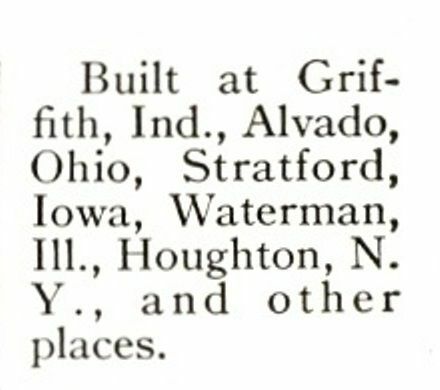 Sears Homes were given names in 1918. Modern Home #264P210 survived long enough in the catalog to merit a name: The Milton. 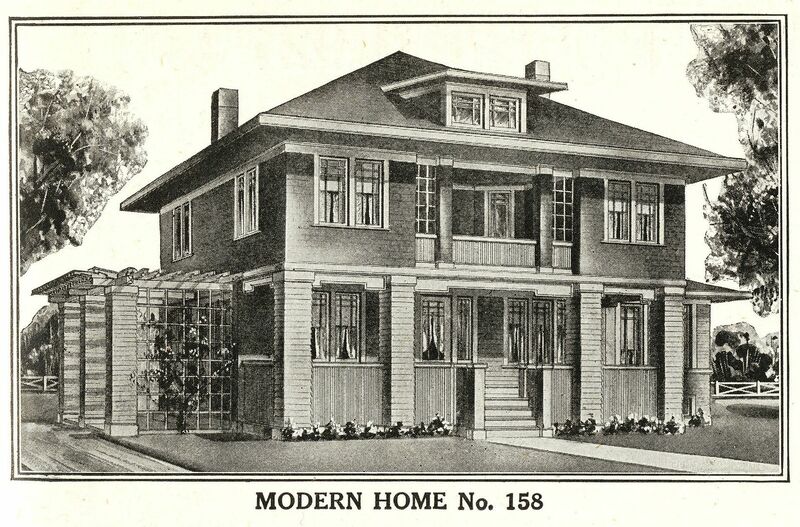 Modern Home #178's last year was 1914. 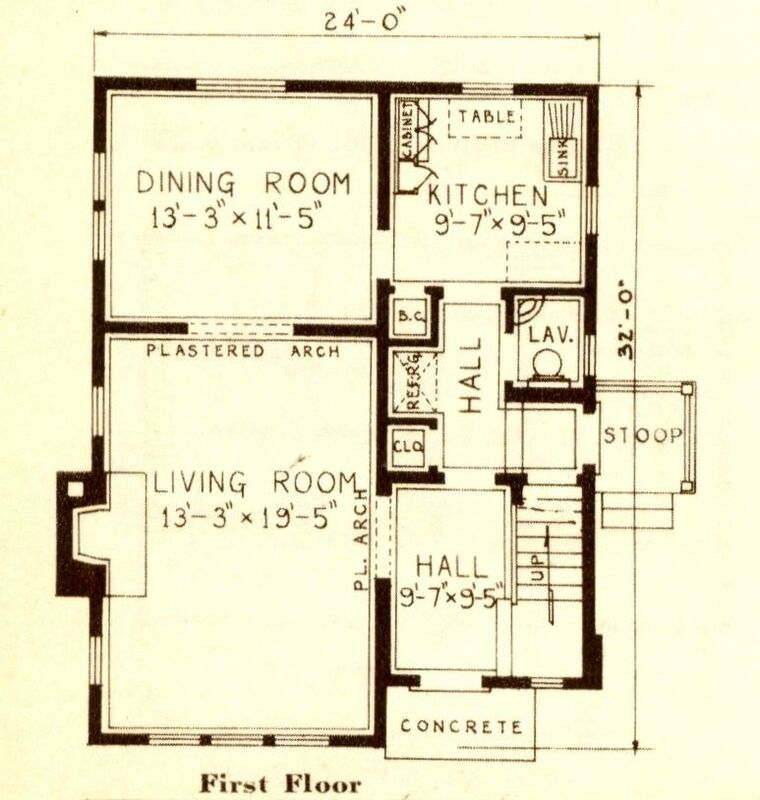 Two houses - one floorplan. 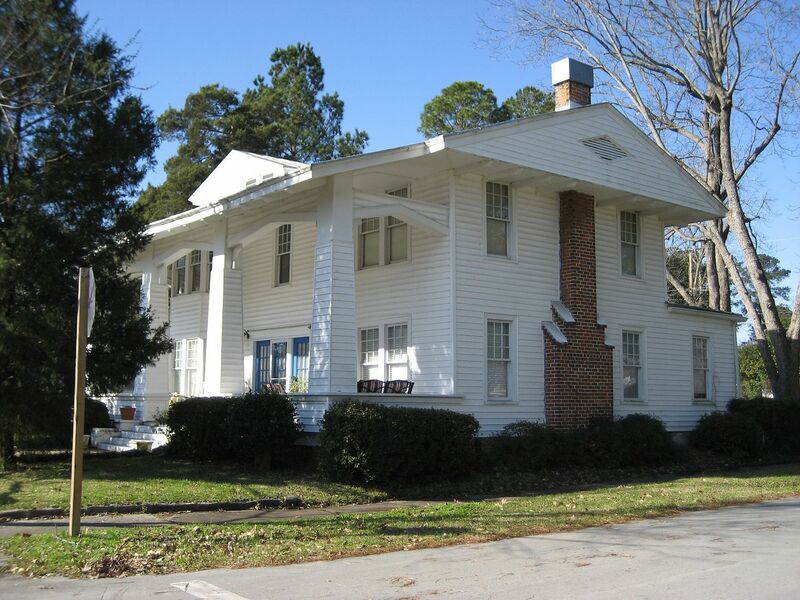 The Sears Milton in New Bern (across the street from #178) was customized when built, and does not have the traditional two-story bay window. 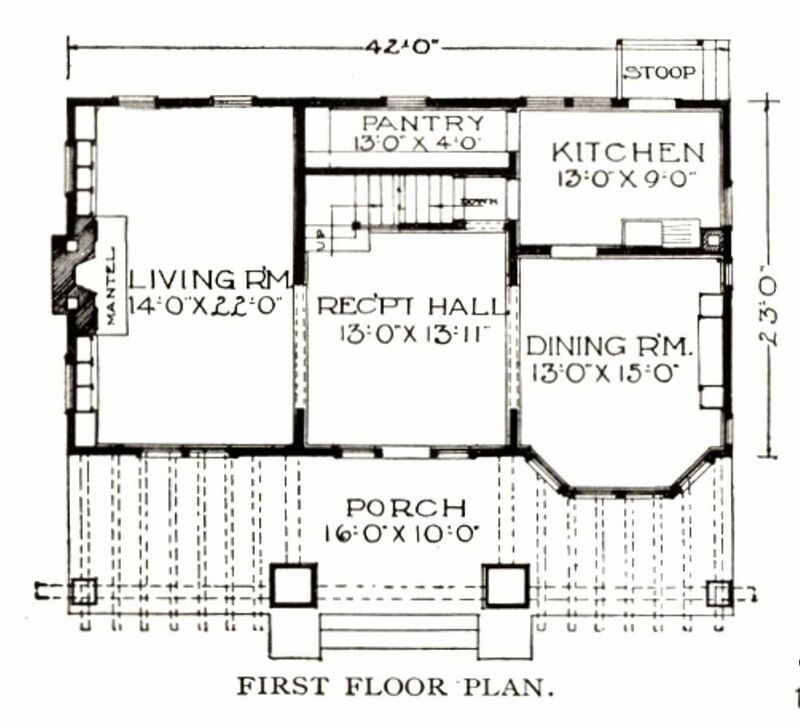 Both first and second floors are identical in the Milton and Modern Home #178. 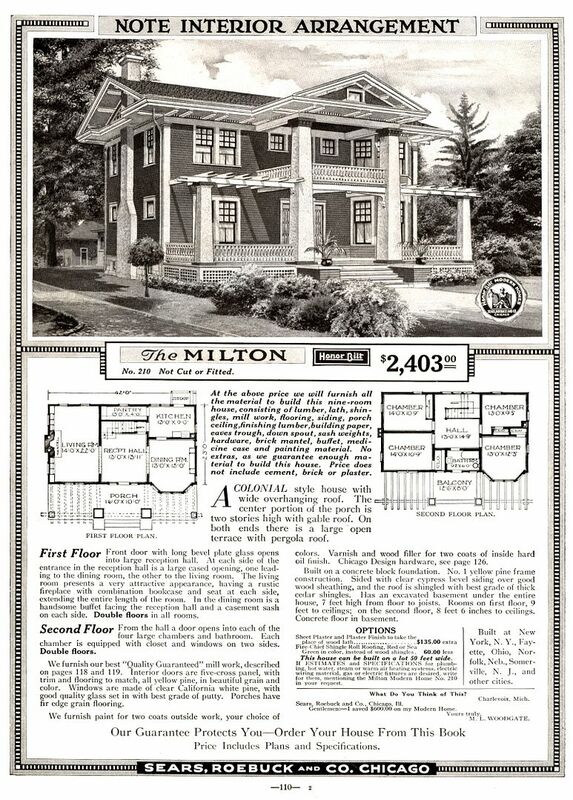 The Milton was one of Sears finest homes. 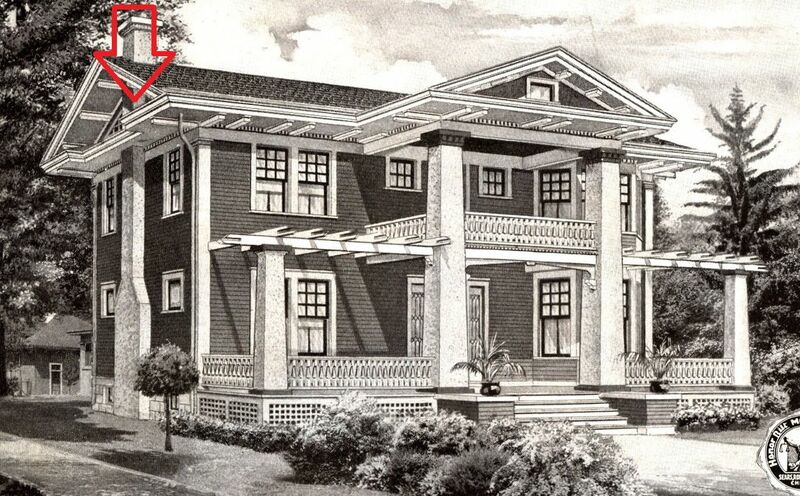 Notice the massive eaves, and cornice returns on this grand house. It's a very distinctive house (thus making it easier to spot). 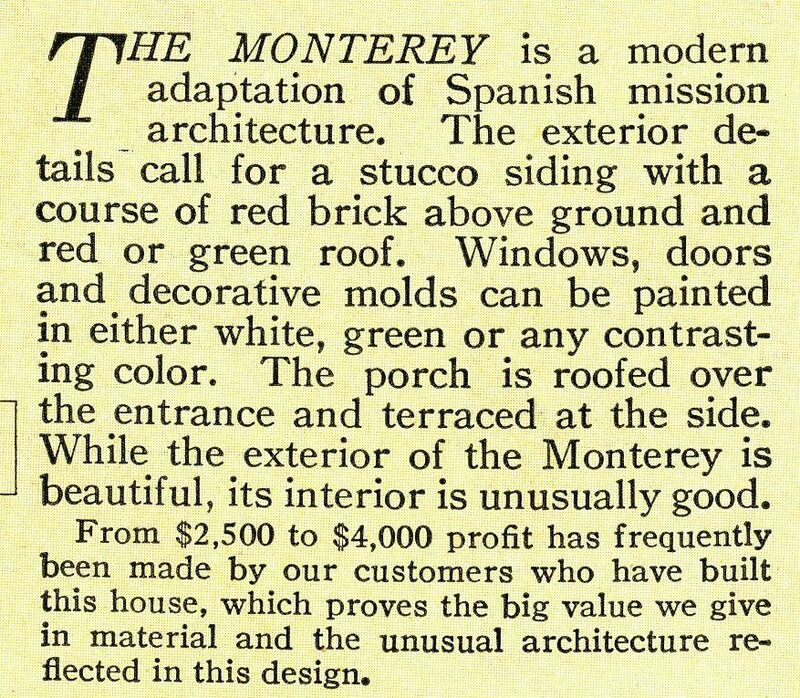 In the Miltons that I've seen, those pergolas have been converted into a roof, covering the expansive front porch. Notice also the dramatic bracketing on the eaves. 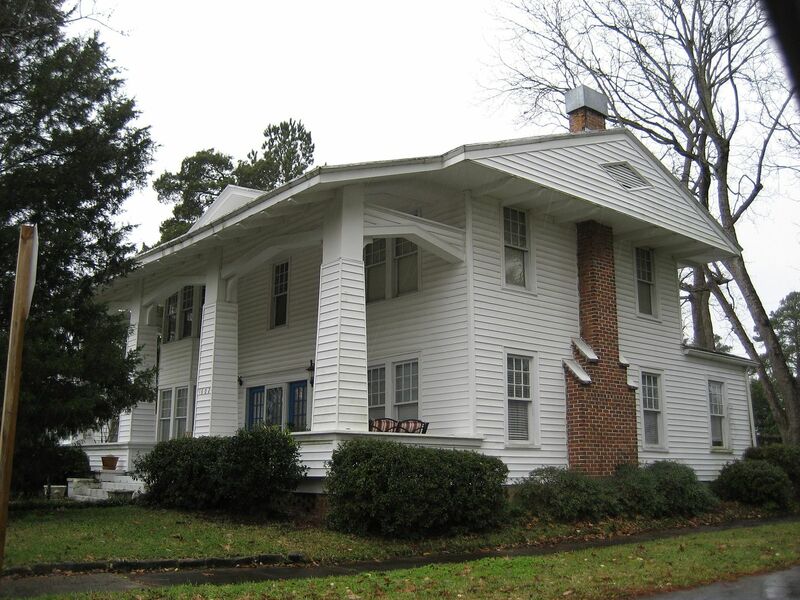 Dentil molding is found at the top of the columns and around the eaves. 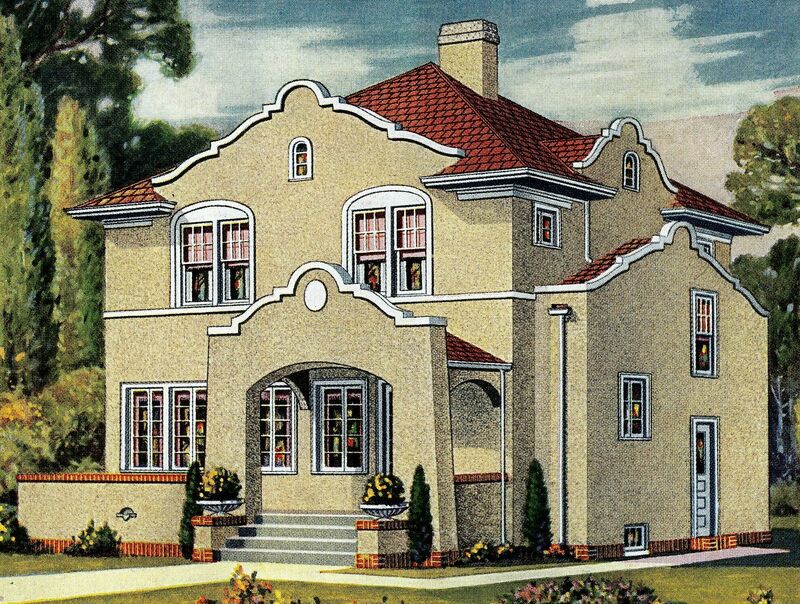 Absent that two-story bay window, every other detail on this Milton is spot-on. Here's a close-up of those distinctive cornice returns. 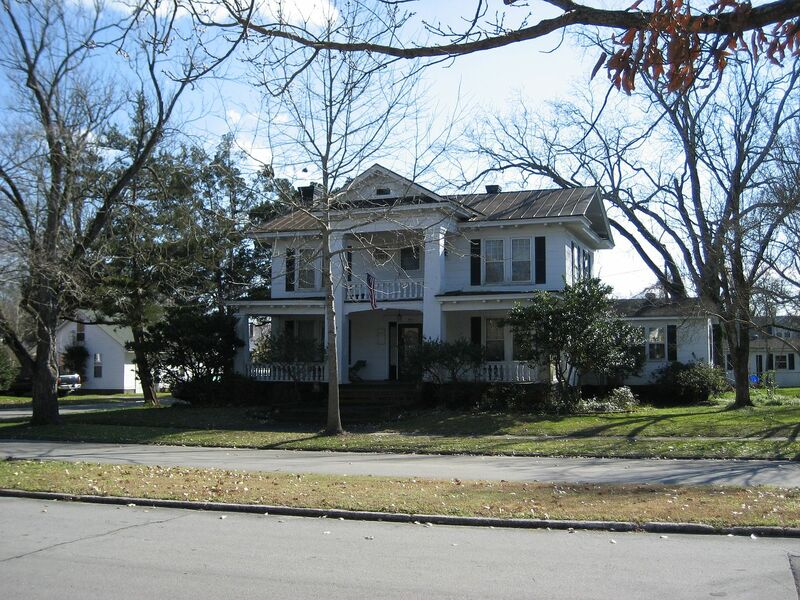 Another view of this grand old kit home in New Bern, NC. 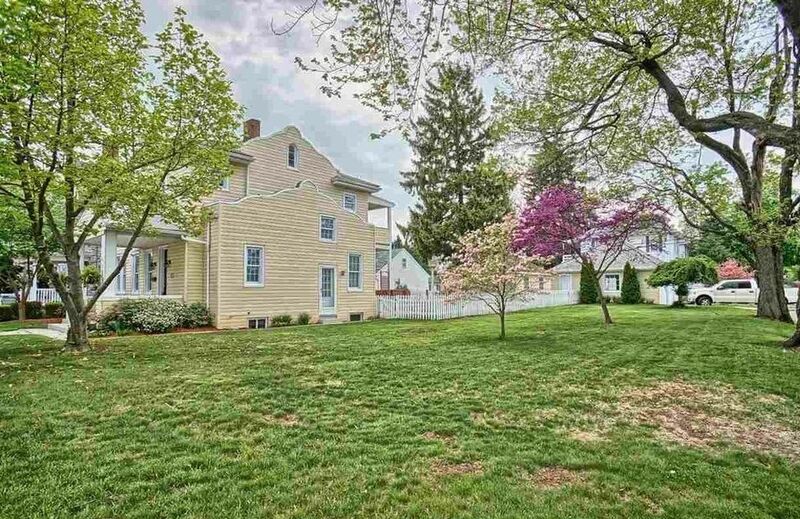 A surfeit of landscaping obstacles made photographing this old house a challenge. 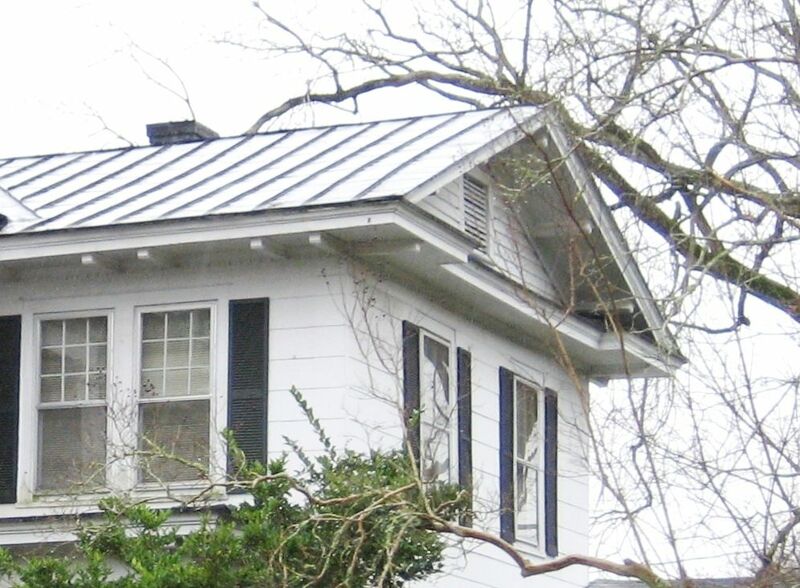 Note the tapered board on the underside of the first-floor porch roof, with a small block at its center. This is also a perfect match to the old catalog image. And just across the street is the Sears Modern Home #178. Beautiful! 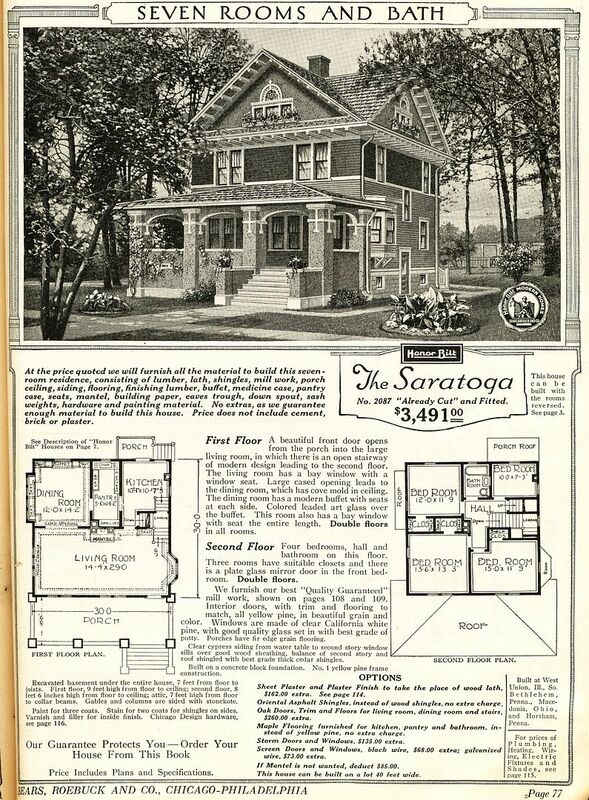 There must be s a story here, as to how these two spacious (and fancy) Sears Homes were built just across the street from one another! A view of the Milton, as seen from the front yard of #178. "One of these Miltons is not like the other!" On the far left (in blue shirt) is my BFF, Milton Crum, with Jim Silverstorf (holding an antenna tuner). When I first told Milton (blue shirt) about the Sears Milton (white clapboards), Milton said, "Now that's a darn fine name for a house!" My next blog - the OTHER 22 kit homes I found within New Bern, including this little cutie in the 600-block of Broad Street! Isn't it a darling little house? To read more about the Sears Milton, click here. And a Hillrose in Griffith, Indiana! 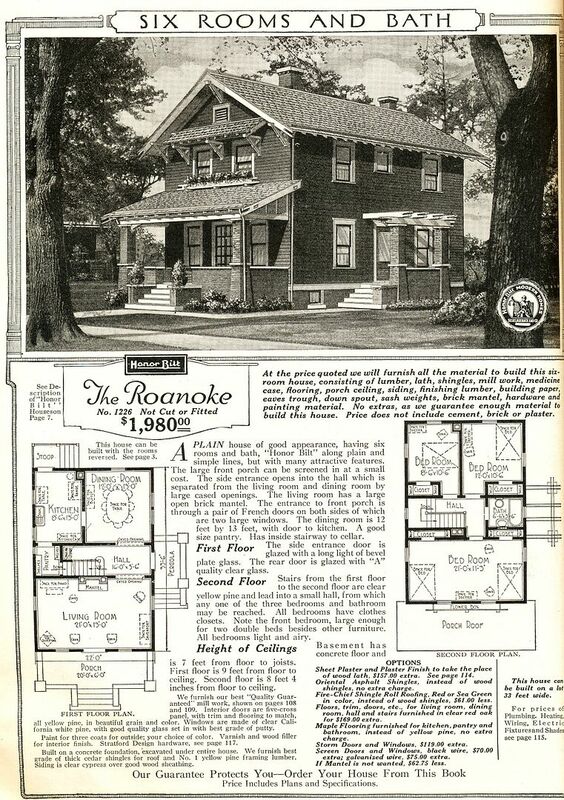 A couple days ago, I did a “preview” blog on a stunning Hillrose in Brandy Station, Virginia (about three hours north of my home in Norfolk), and posted it in our Facebook group, Sears Homes, together with a blurb saying that there were other Hillroses in Griffith (Indiana), Alvada (Ohio), Stratford (Iowa), Waterman (Illinois), and Houghton (New York). 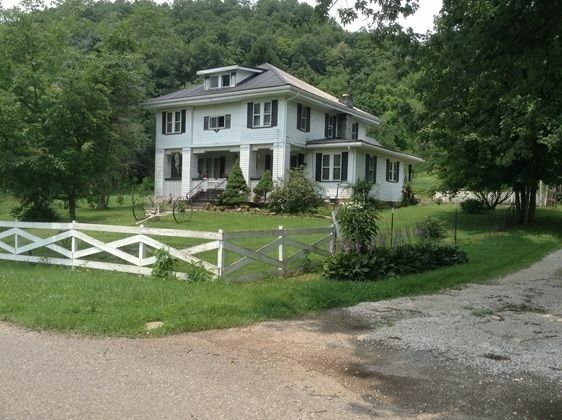 A long-time member of that group - Carrie Milam - spoke right up and offered to go find the Hillrose in Griffith, Indiana. I was tickled pink, as the Hillrose in Brandy Station was the only Sears “Hillrose” I’d ever seen. 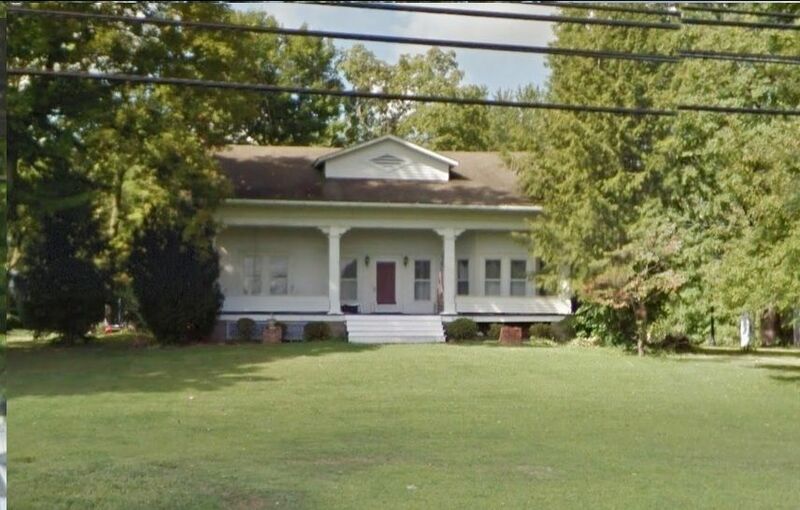 Here’s the thing: Folks often promise to “go find that house” and I never hear back from them, but Carrie and her husband Greg jumped right in their car and started hunting for the house. Carrie said that it took about an hour to find our missing (and forgotten) Hillrose. 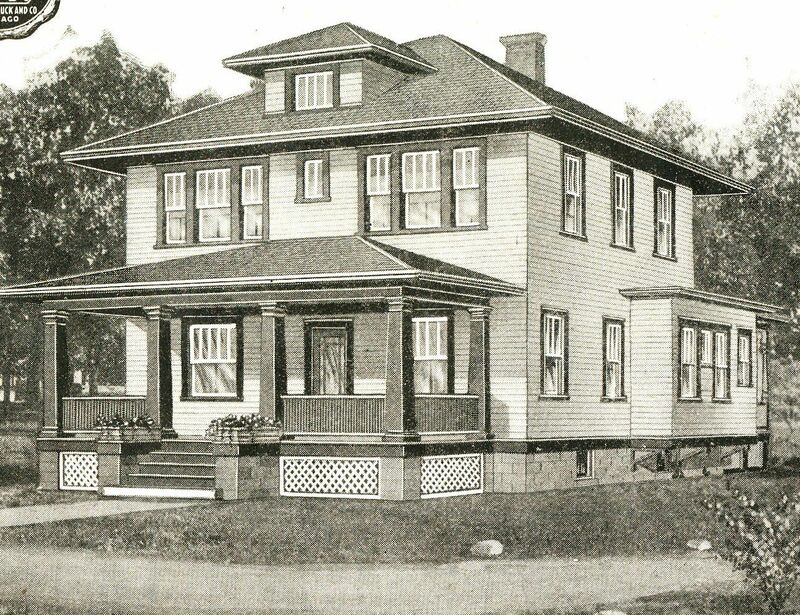 The house in Griffith has endured many changes in the last 95 years, but it’s still standing. Thanks so much to Carrie Milam and Greg Decker for supplying the photos! 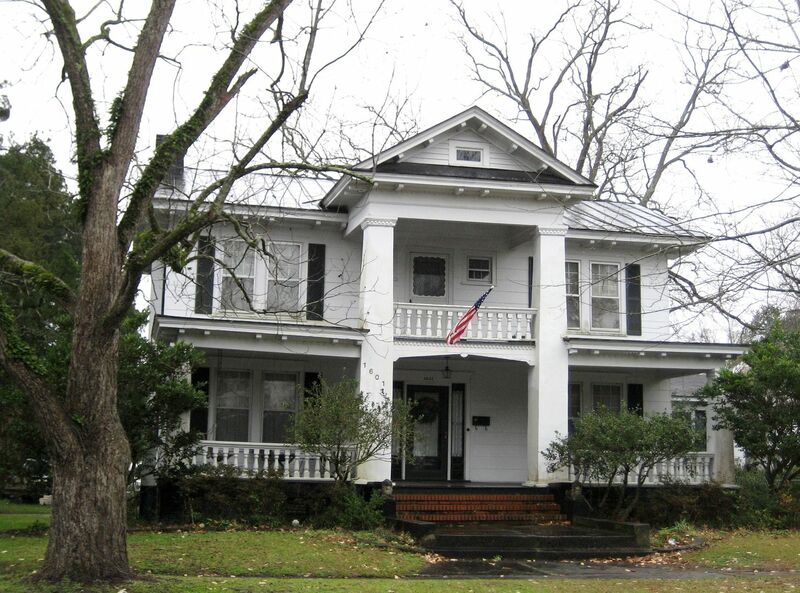 To read more about the Hillrose in Brandy Station, click here. Why is the Hillrose such a prize? Read about it here. 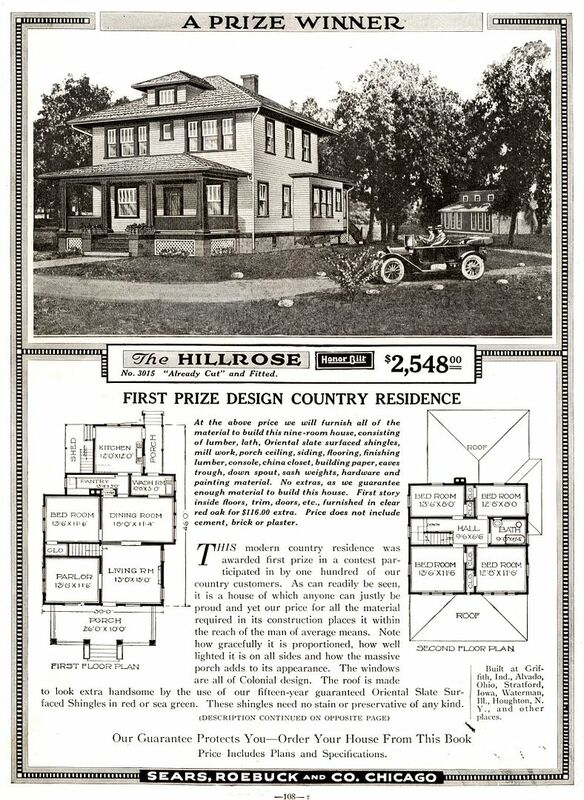 The Hillrose, as seen in the 1918 catalog. And we've still got a few missing! 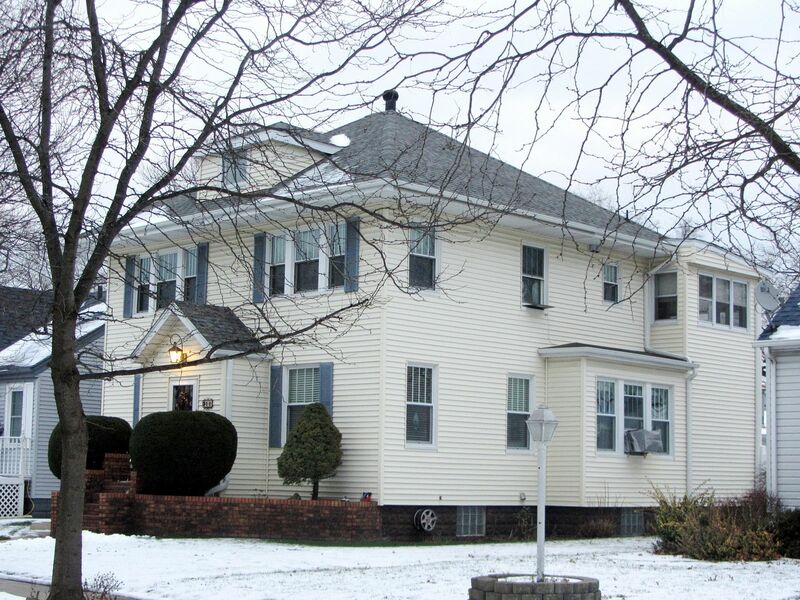 It's a distinctive house with some remarkable features, such as that oversized bay with three windows and a wide attic dormer with a small squared window. The window arrangement on the 2nd floor is also unique. 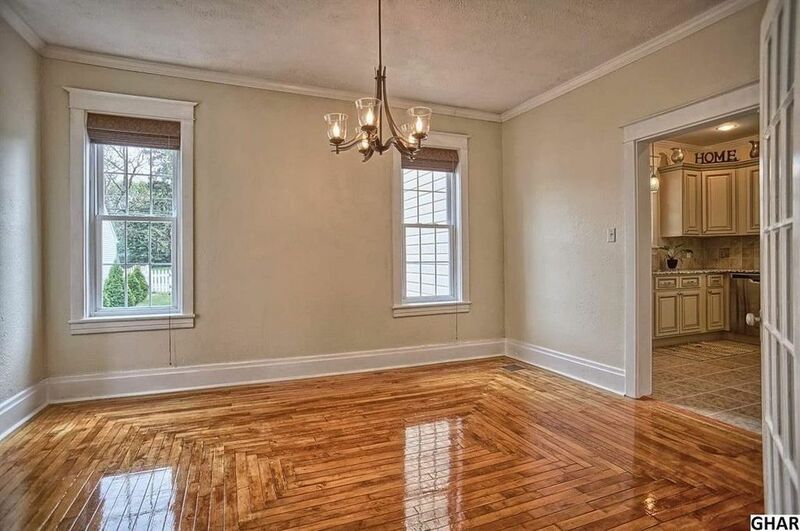 It's unusual for a foursquare of this vintage to have two sets of three windows (with the widest window in the center), and smaller windows on the first floor. In other words, this house should be easy to spot! 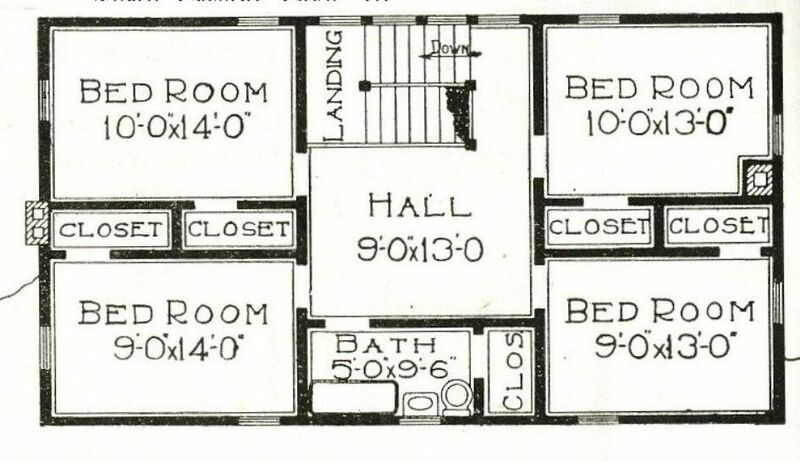 Lots of nice features inside too, such as a wash room for the hired hands (1918). 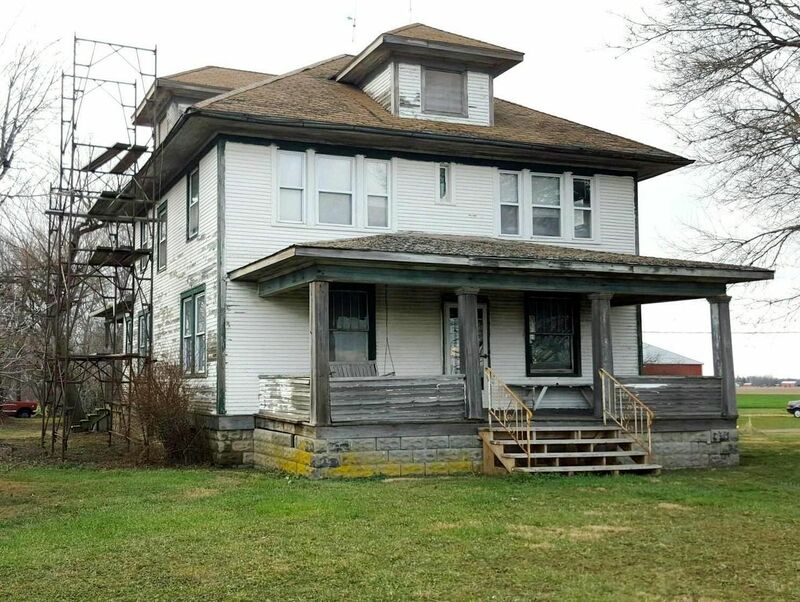 There are four bedrooms upstairs, but they're not too big. And here it is in Griffith, Indiana. It's been through many changes, but I'd bet my hat that it's a Hillrose. Photo is copyright 2015 Greg Decker and may not be used or reproduced without written permission. A close-up on that bay shows that the details are right. In place of the diminutive small window (between the two long windows), there's a full-size window, but it's altogether possible that the house was built this way. 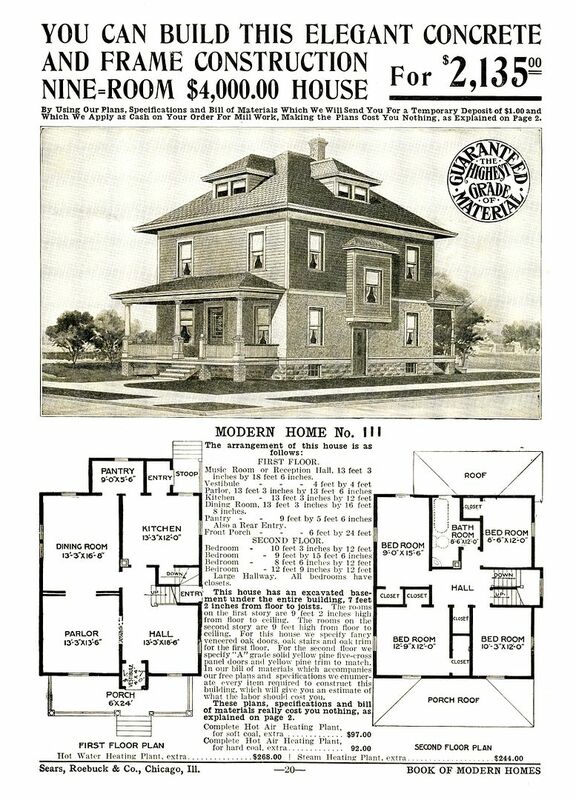 The smaller window (shown in the catalog image) probably got swallowed up by that large addition on the rear. Photo is copyright 2015 Greg Decker and may not be used or reproduced without written permission. 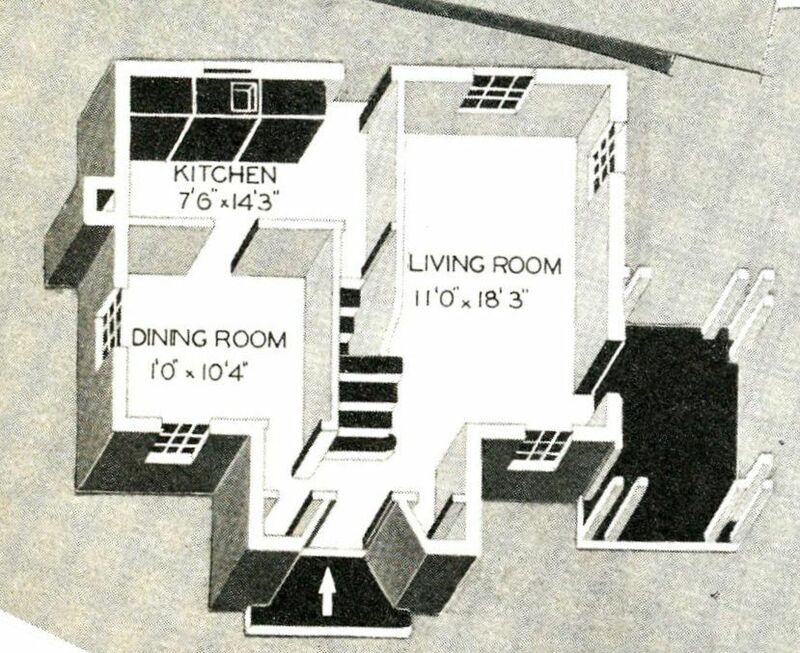 If you look down that left side and compare it to the floorplan, you can see that it's a good match. There's a tiny window in that closet (between the two large rooms on the left). Photo is copyright 2015 Greg Decker and may not be used or reproduced without written permission. 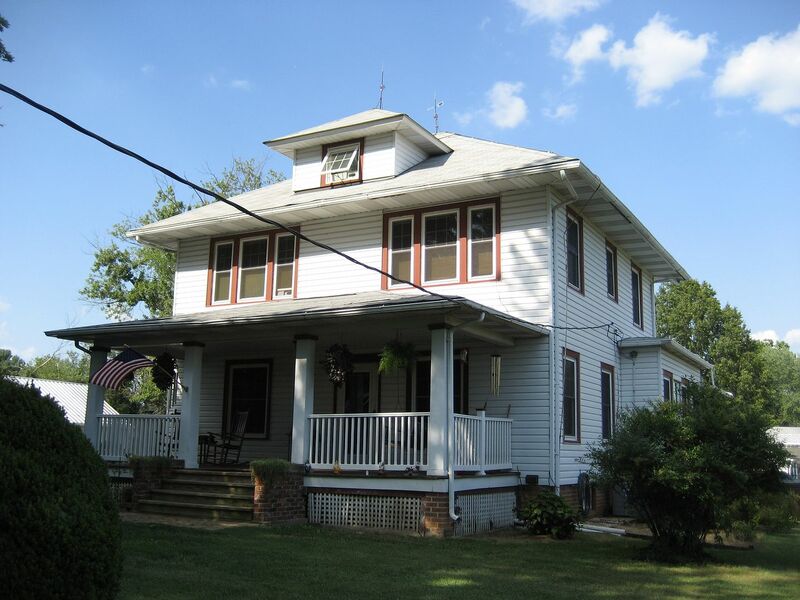 The Hillrose in Brandy Station (shown on the right) has a door at the end of that first floor hallway, and a small porch has been added to the side of the house. 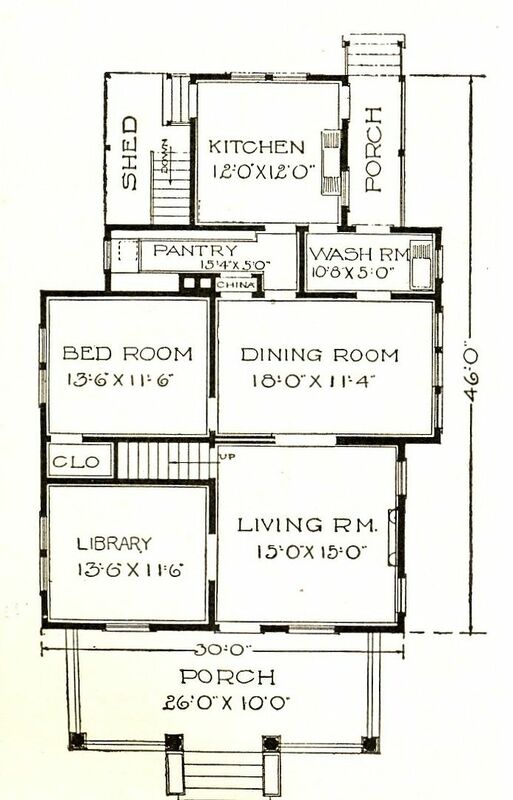 The 2nd floor is also a good match to the floorplan. That small window on the 2nd floor is a landing window. Photo is copyright 2015 Greg Decker and may not be used or reproduced without written permission. So what happened to the porch? 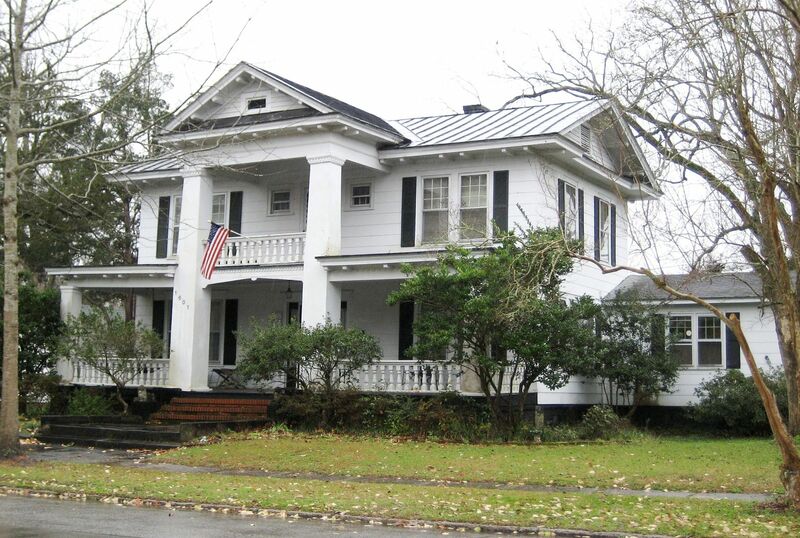 The Hillrose in Brandy Station still has its magnificent porch but it's endured some significant repairs through the years. What a pity that the Hillrose in Indiana suffered a porchectomy. That's a grievous loss for a foursquare. 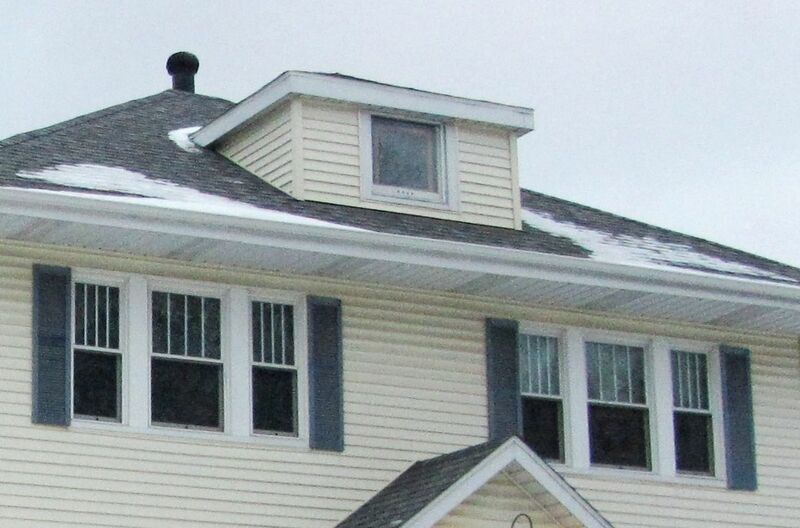 The vinyl-siding installers also had their way with the attic window. Photo is copyright 2015 Greg Decker and may not be used or reproduced without written permission. 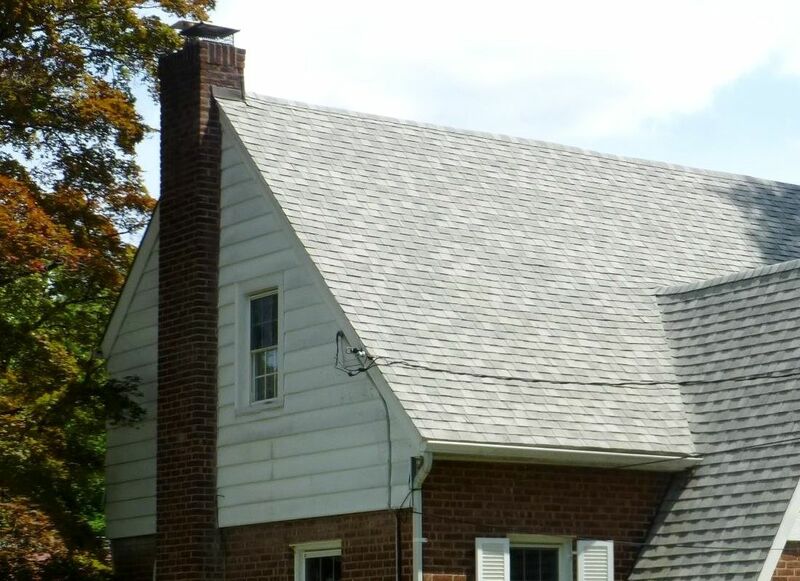 With a little bit different angle provided by Google maps, you can see it's definitely a Hillrose dormer. 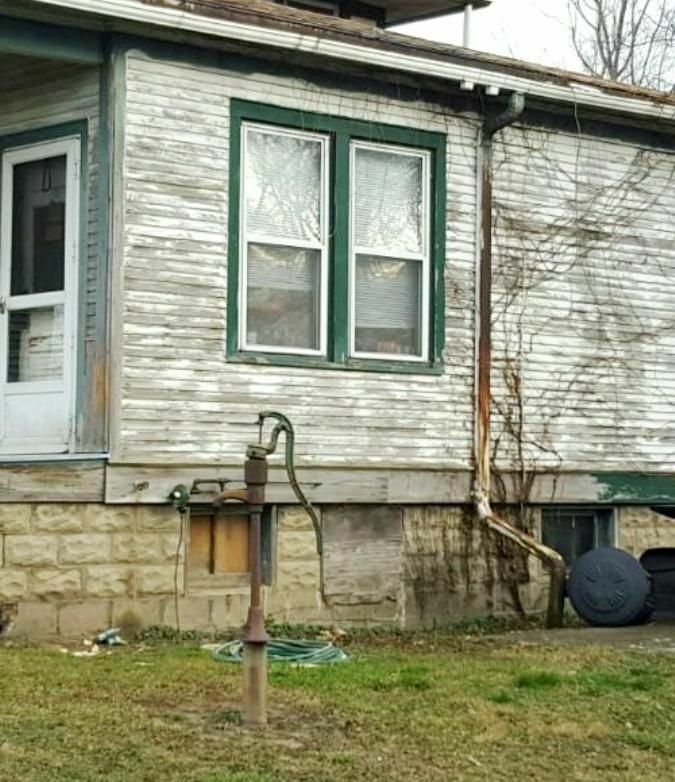 Perhaps one day, the home's happy owners might consider restoring the front porch. 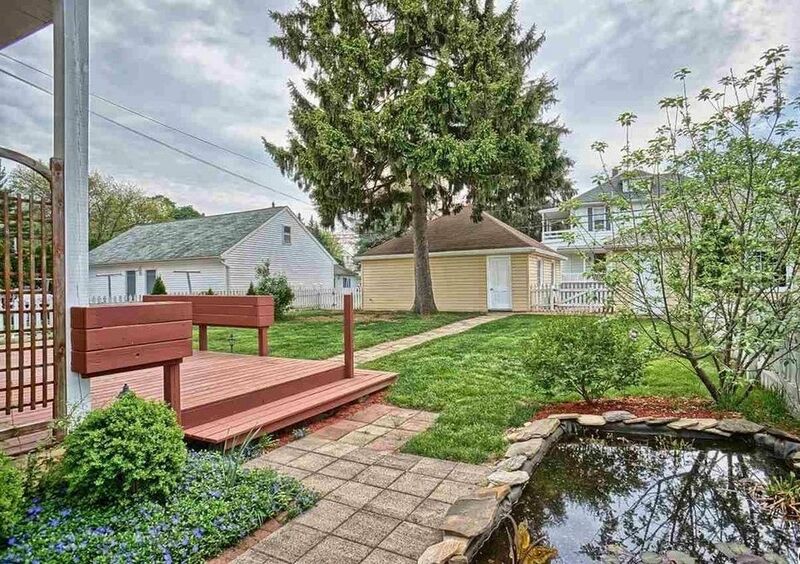 That brick decking is a puzzle, as it looks newer than the home, and yet it appears to have the same footprint as the original porch. Photo is copyright 2015 Greg Decker and may not be used or reproduced without written permission. Just around the corner from the Hillrose, Carrie and Greg found this darling Sears Crescent. Photo is copyright 2015 Greg Decker and may not be used or reproduced without written permission. 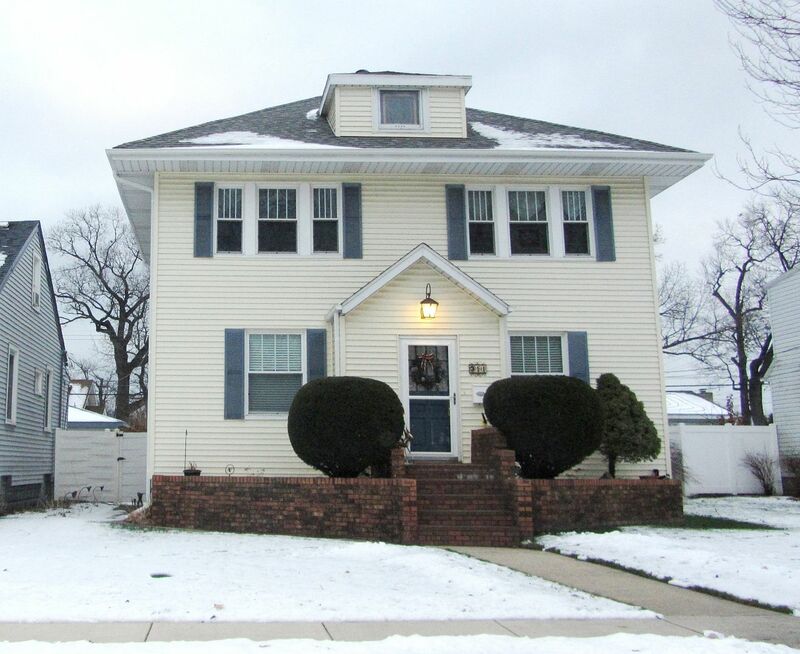 Thanks again to Carrie and Greg for finding this house and providing the wonderful photos. 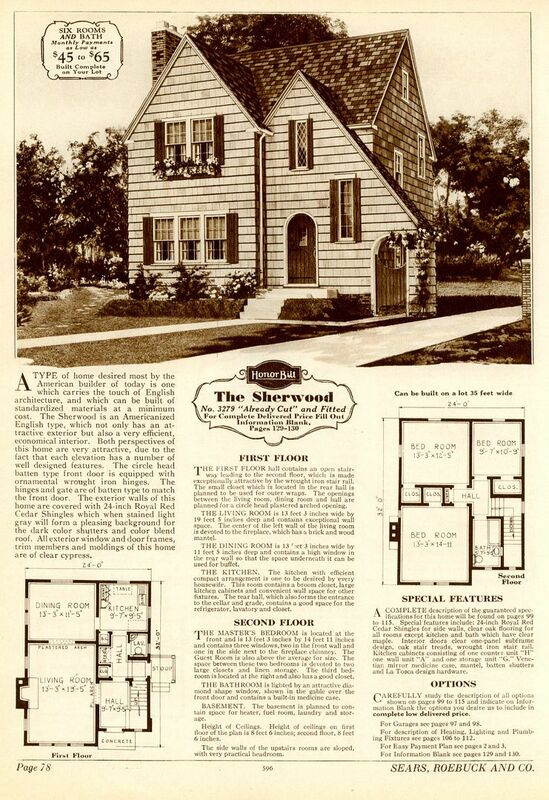 Sears Modern Home #124 in Amherst Can Be Yours! It was 2003 when I saw my first Sears Modern Home Model #124. I’d visited Rebecca Hunter in the Chicago area, and she took me to Crystal Lake to see “an authenticated #124.” It was all very exciting and Rebecca had even arranged for an inside tour. That was a very happy day. 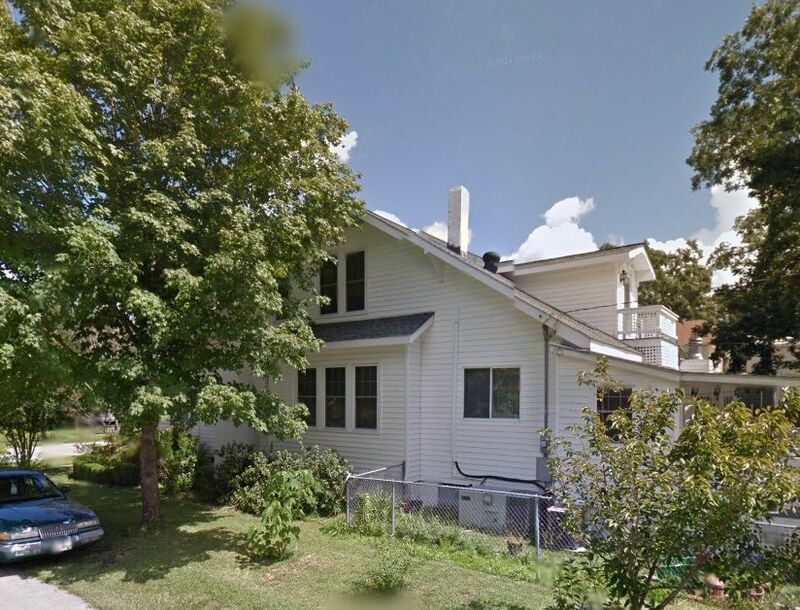 More recently, Pat Kluetz left a comment at my blog that she’d discovered a Sears Modern Home #124 in Amherst, Wisconsin and it was for sale! She was kind enough to leave a link to the site. 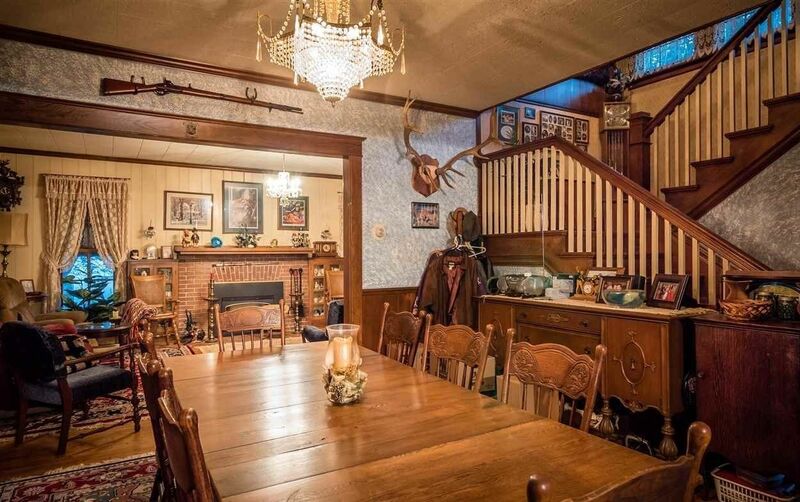 Having read the listing, I was surprised to find that the Realtor didn’t mention this is a Sears House. I wonder if they know? 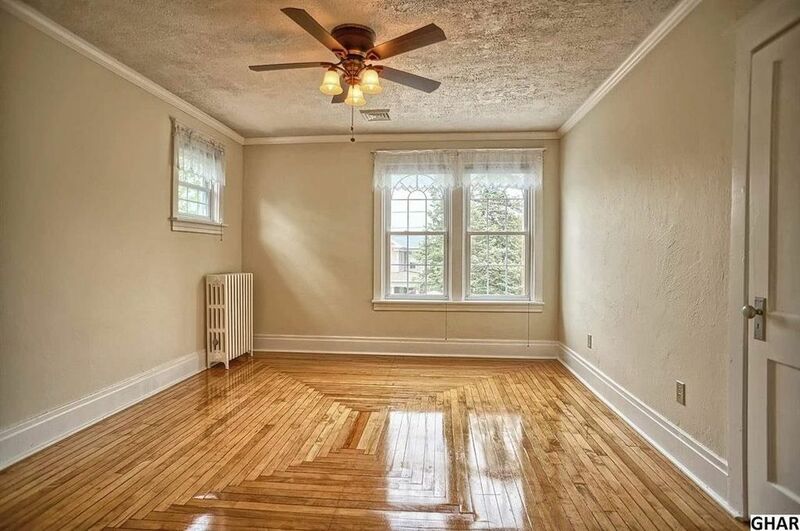 Many thanks to the unnamed Realtor who snapped all these wonderful photos! And thanks to Pat Kluetz for leaving a comment at my blog. To see the original listing, click here. You can visit Marguerite’s #124 by clicking here. 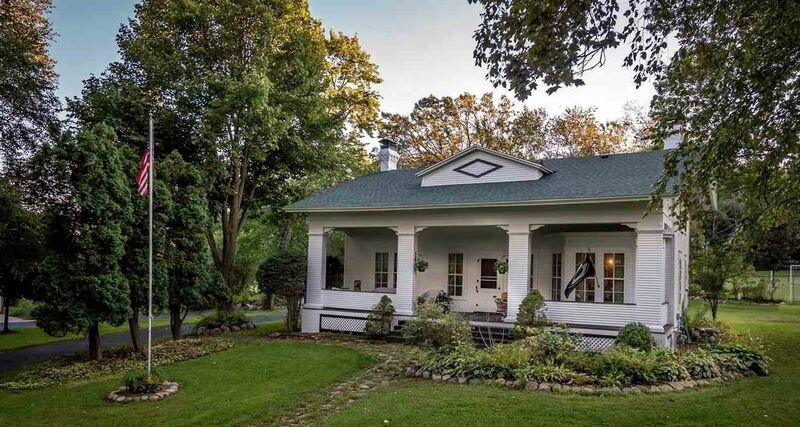 My oh my, what a fine-looking house and it's in such wonderfully original condition. 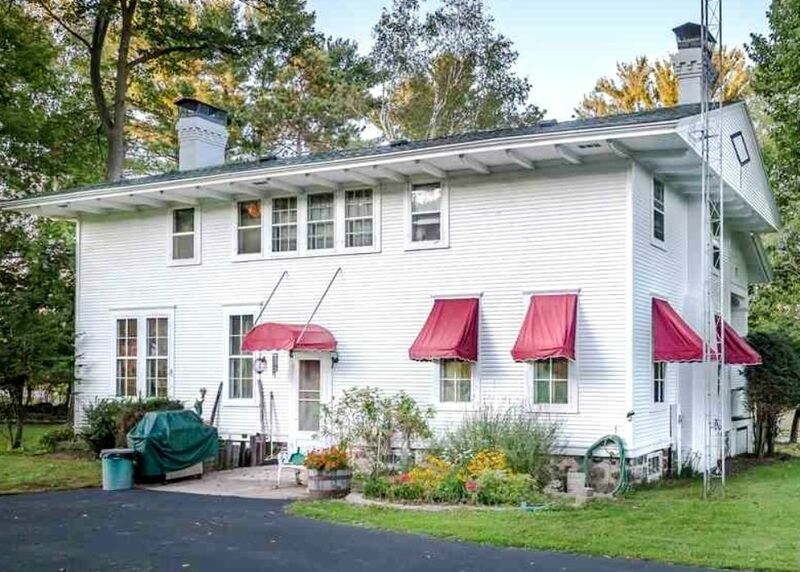 It's listed for $175,000 and for those of us living near a coast, it defies belief that a house like this (on 2+ acres) could be purchased at such a low price. This is my favorite photo, for so many different reasons. 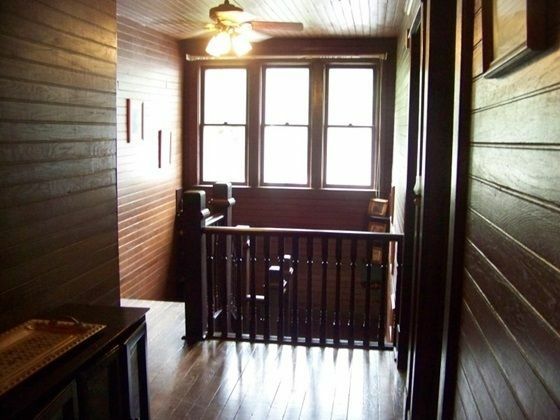 For one, it really highlights the beautiful condition of this 104-year-old house. Not only does it have original wooden windows, it also has wooden storms. Wow. 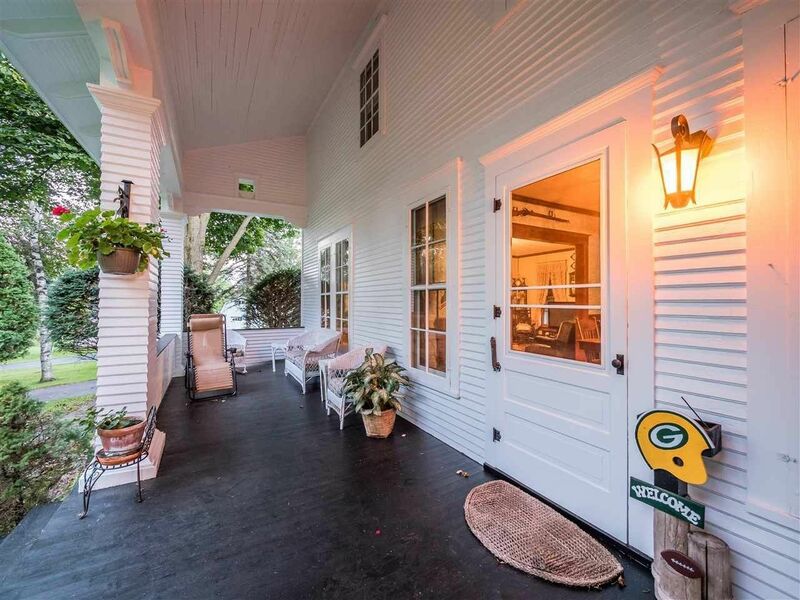 The entire front porch is so inviting. Those white wicker chairs help too. And it even has a private drive. Be still my heart. Santa, are you listening? Sears House. Wisconsin. 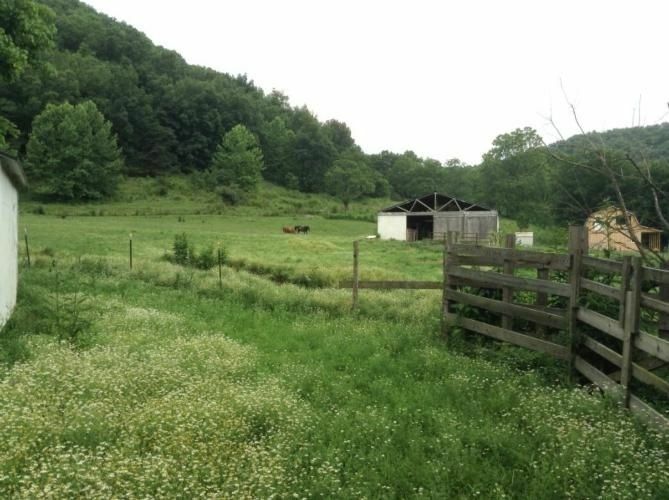 Two acres of bucolic bliss. Mature treees. Wow. Look at the size of those eaves! Notice all the windows across the back of the 2nd floor? Make a note of those many windows. More on that later. BTW, is that a ham radio antenna? And there are interior views too! 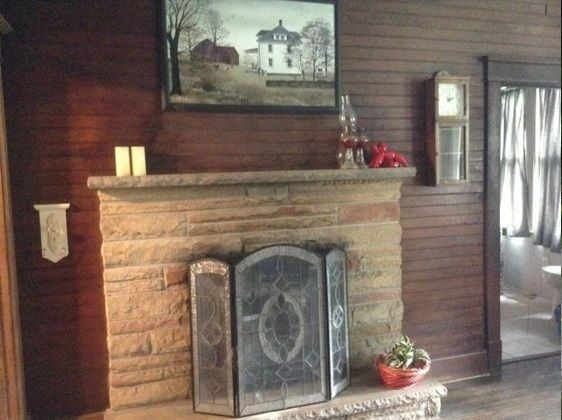 I suspect that fireplace mantel is not original to the house. That's just not the type of brickwork you'd see in an early 1900s house. 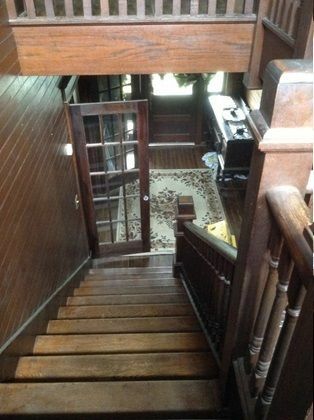 That staircase is a beauty, and a good match to the floorplan. You're left wondering: Who's their favorite football team? 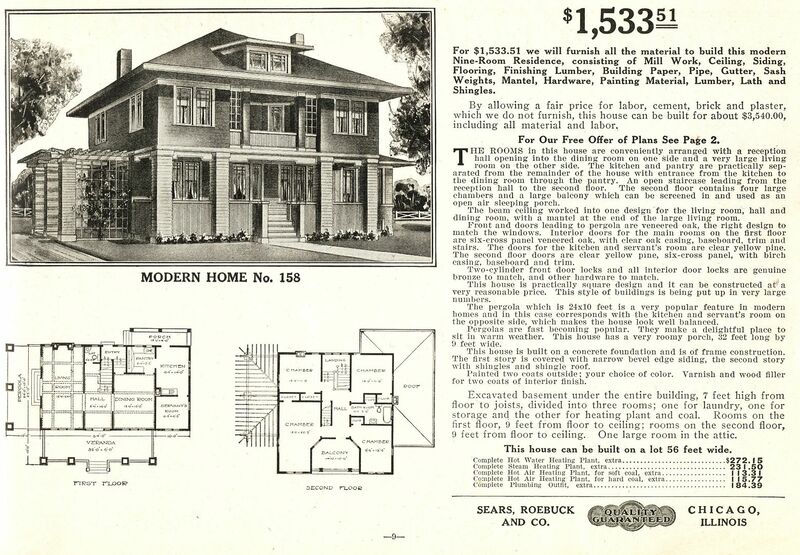 Sears Modern Home #124 was offered first in the 1908 catalog. 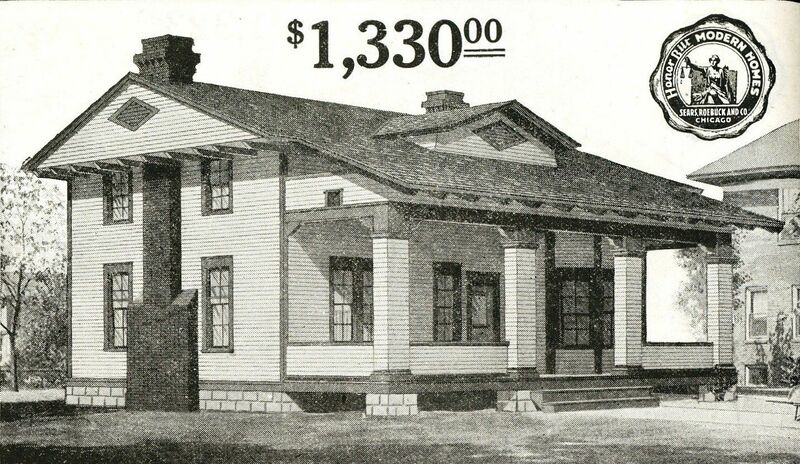 The image above is from the 1914 catalog. 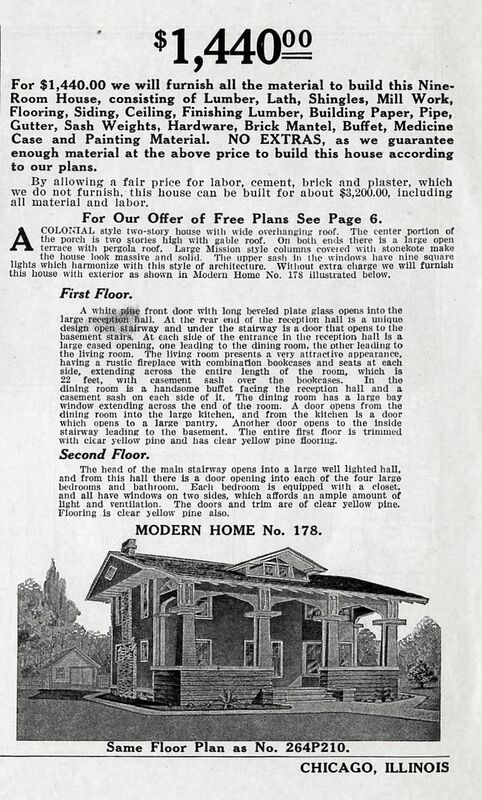 It last appeared in the 1916 catalog (shown above). 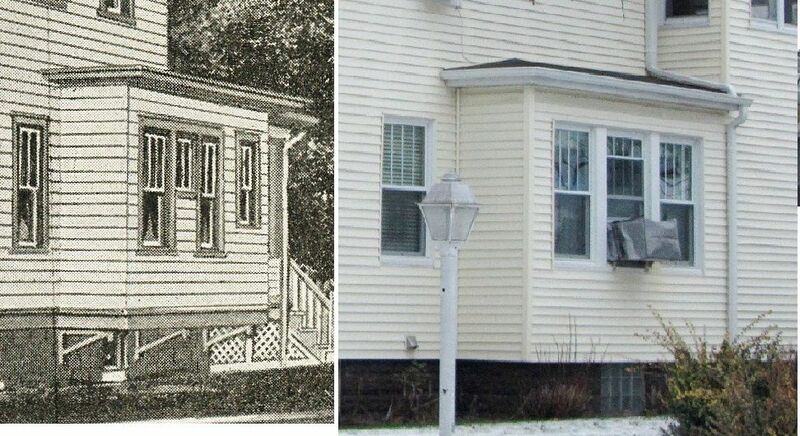 Pre-WW1 kit homes are pretty rare, and yet #124 appears to have been one of their most popular models. 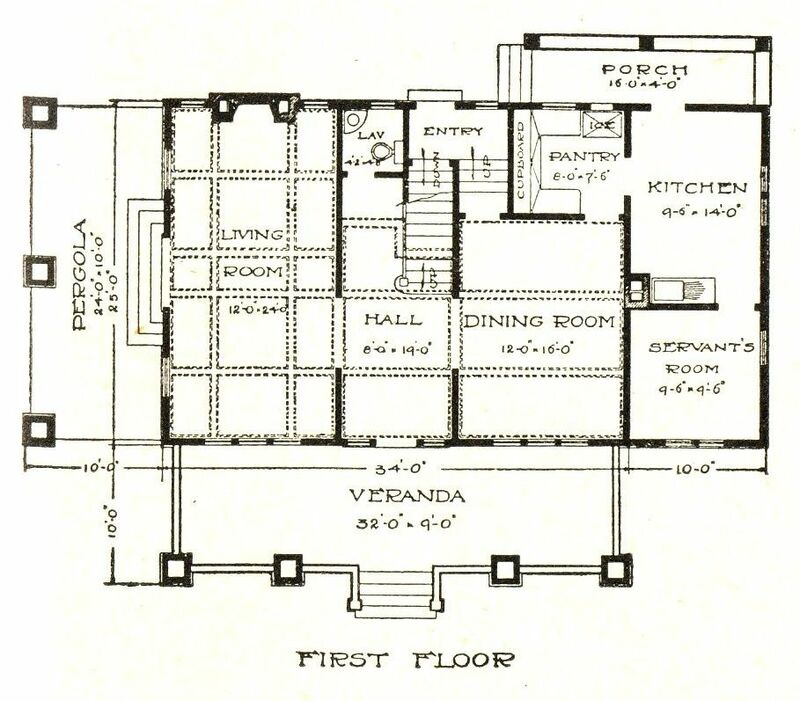 With 1930 square feet, this was one of their largest houses. Check out that bank of windows on the 2nd floor (by the landing). That's a whole lot of windows. Look at all those windows! 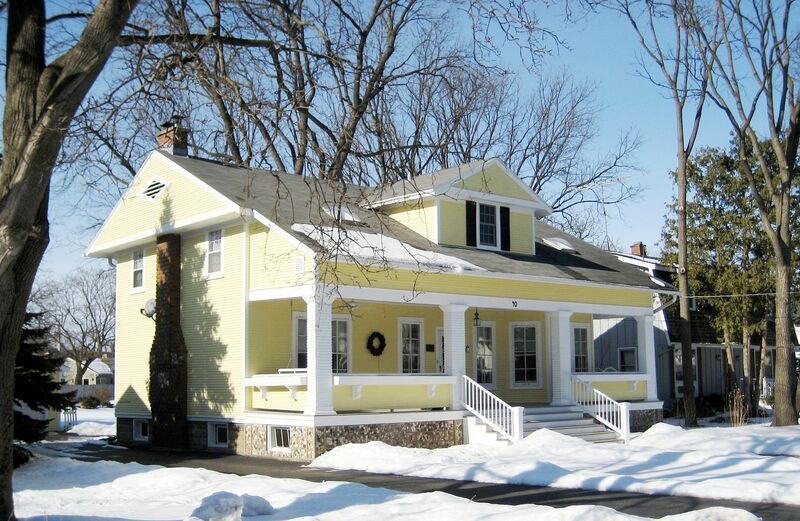 The house in Amhurst, Wisconsin is a perfect match - front and rear! 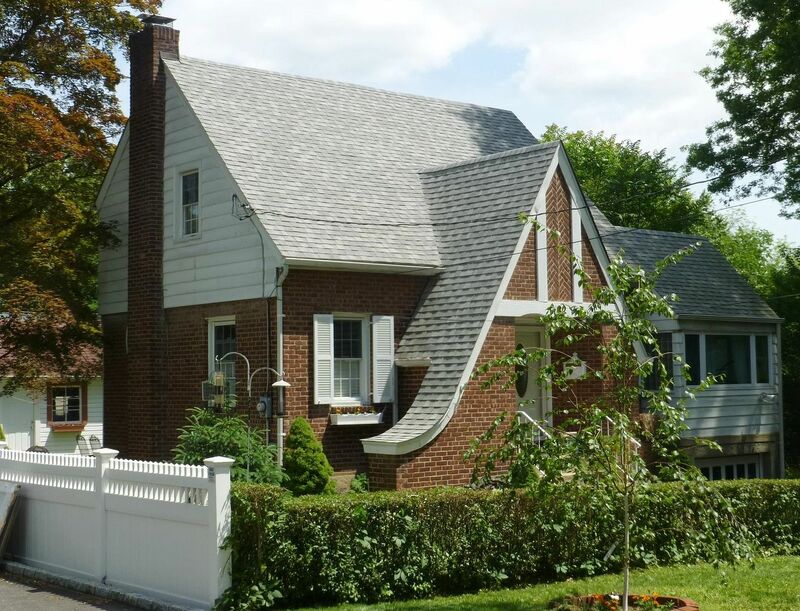 It's an unusual house, but lots of charm! What a beauty! And such a good match to the catalog image. Why isn't it being promoted in the listing as a kit house? And you wonder, why would anyone leave this little slice of heaven? Here's the first #124 I ever saw, and it's in Crystal Lake Illinois. 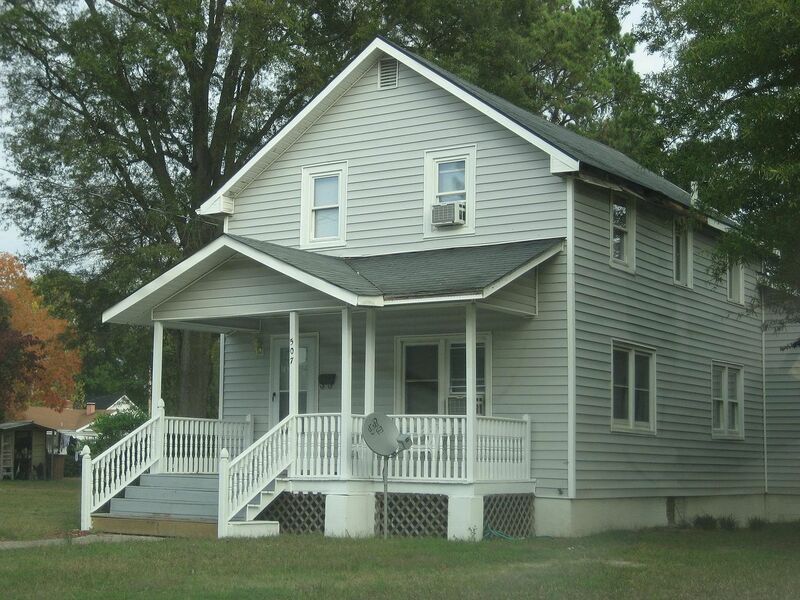 Even tiny Taylorville, IL has a Sears Modern Home #124. Dale Wolicki found this #124 in Augres, Michigan Check out the river rock on the column bases. Photo is copyright 2012 Dale Patrick Wolicki and may not be used or reproduced without written permission. Another commenter mentioned this #124 in Rensselaer. New York. Thanks to another unnamed Relator for sharing this photo. 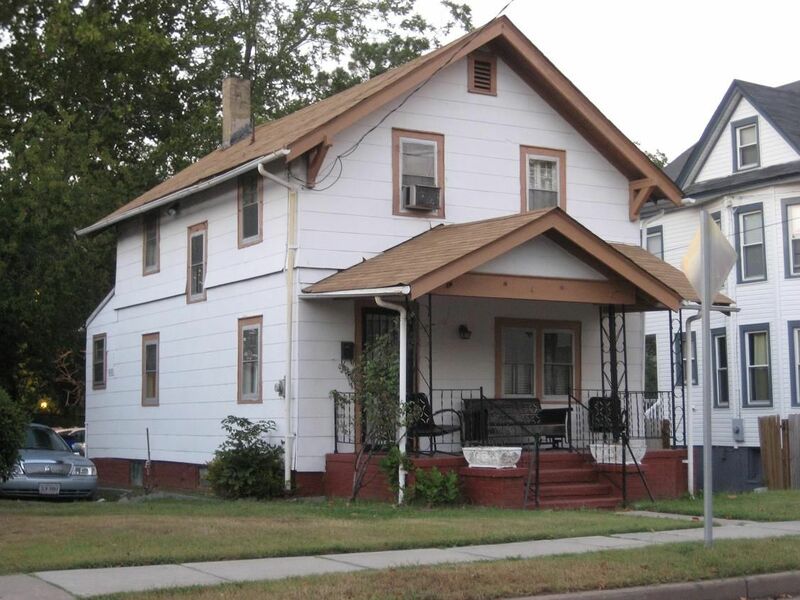 This house is lcoated at 913 Washington Avenue and is also for sale. 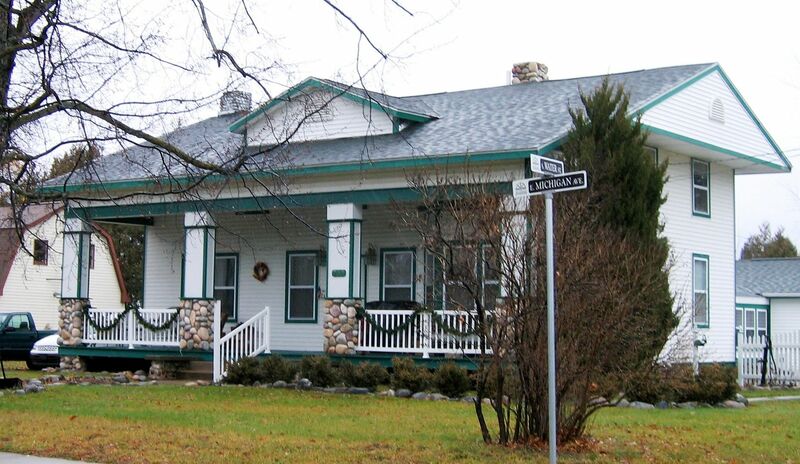 And Kris left a comment at my other blog on #124, saying that he'd found this house in Medina Ohio. 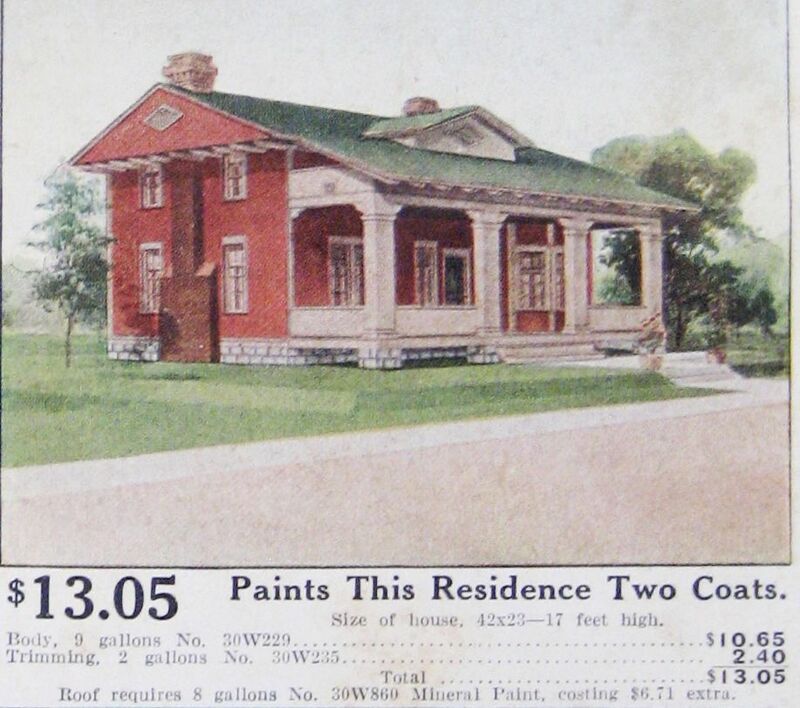 Modern Home #124 appeared in the 1911 Seroco Paint Catalog. 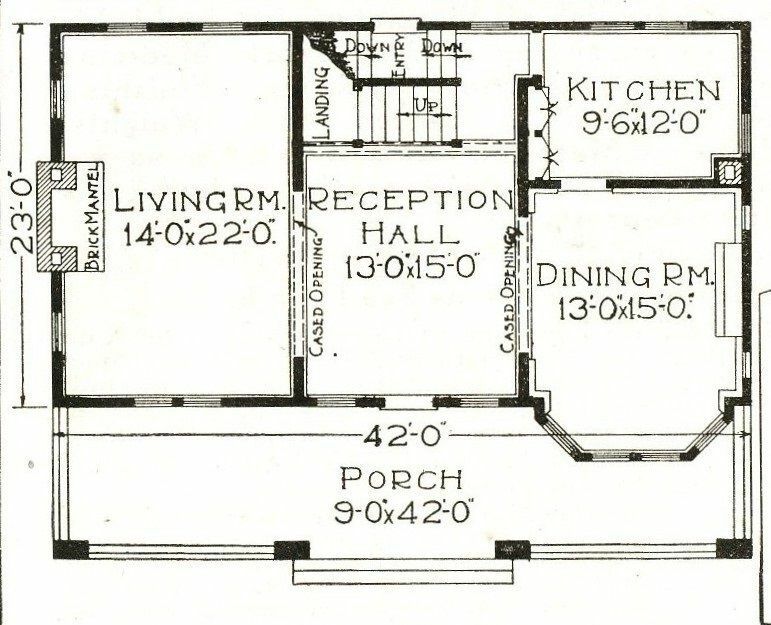 Even though Modern Home #124 was offered only from 1908-1916, it proved to be a very popular house. 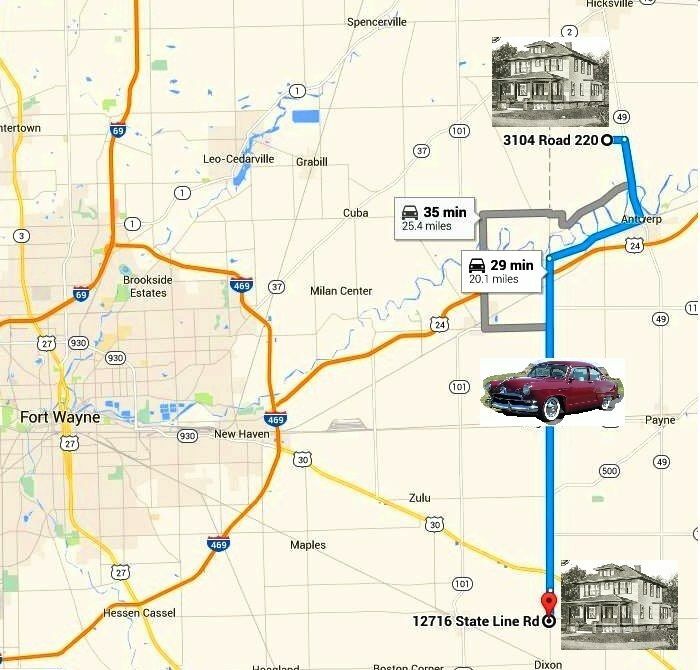 And while we've found the 124s in Montvale, Taylorville and Crystal Lake, there are still many MIA! 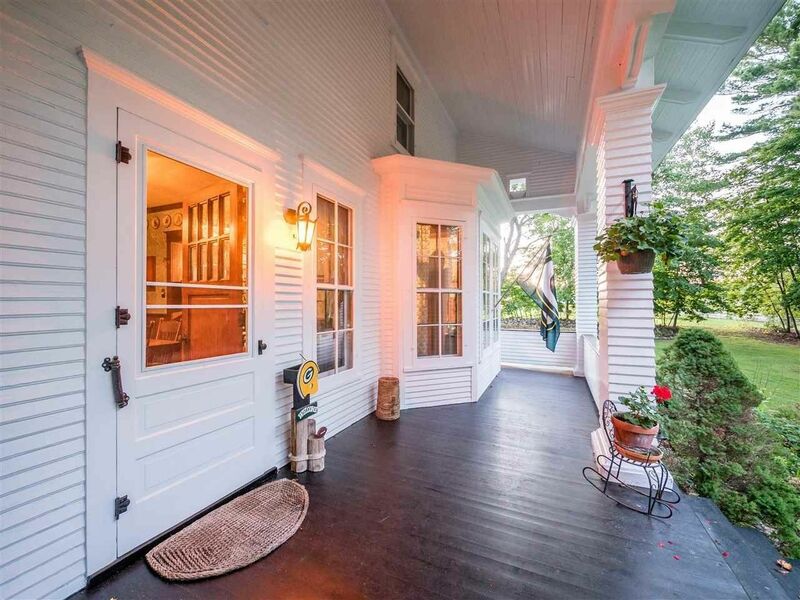 Want to learn more about America’s front porches? Click here. 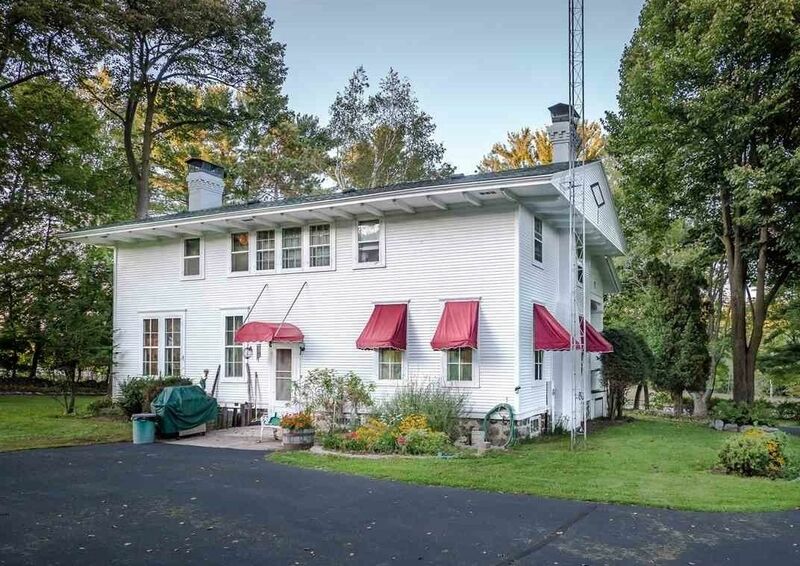 Last week, Elisabeth Witt of Wisconsin contacted me and said she thought there were a few kit homes in Shorewood, Wisconsin. 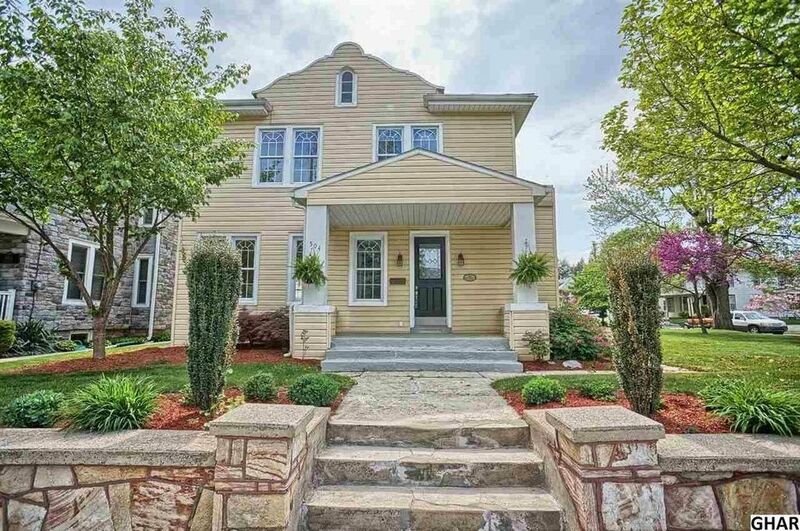 I went to Realtor.com and entered Shorewood to do a quickie search, and one of the first hits was an Aladdin Venus! 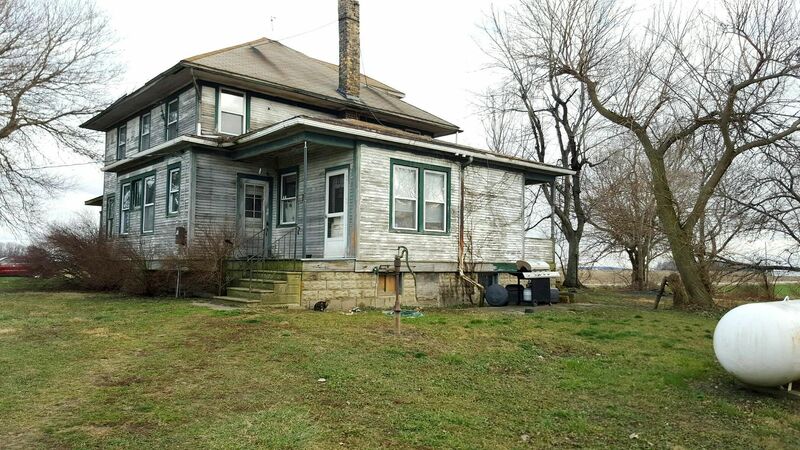 Click here to see the listing. 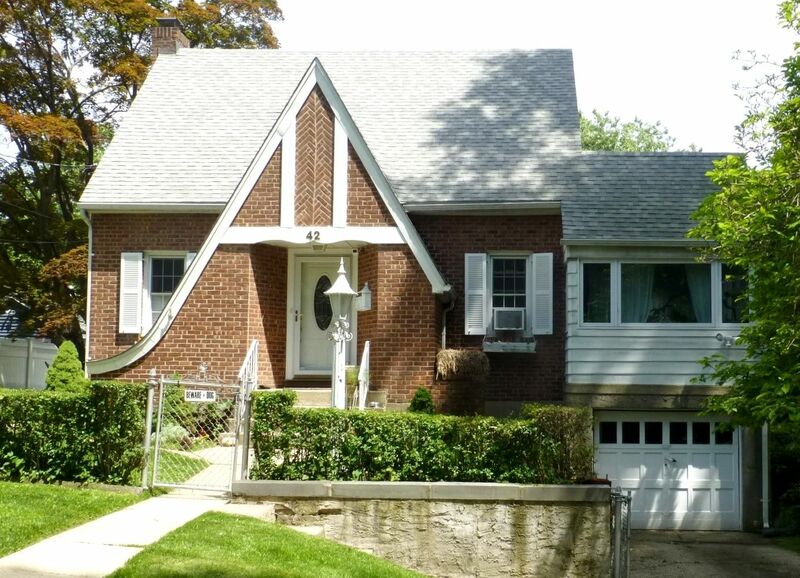 The Aladdin Venus was a popular house, but what makes this house in Shorewood so interesting is that it’s the only Venus I’ve seen that retains its original wooden awning. 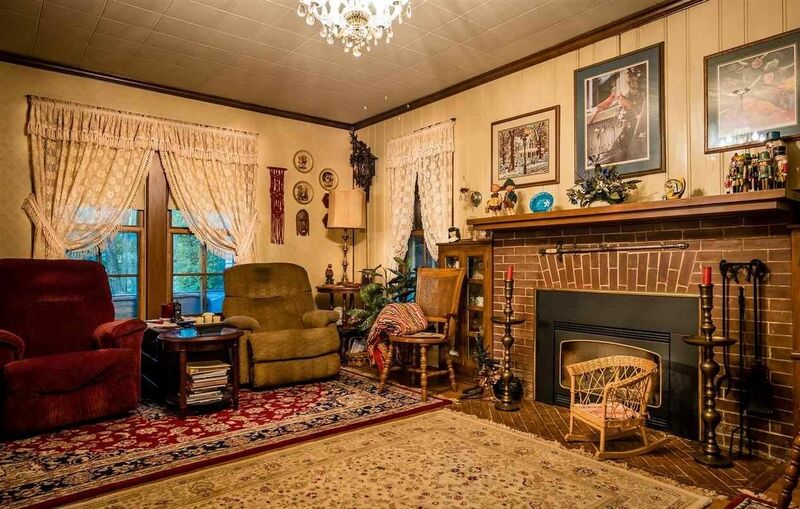 And before we get to the pictures, I wonder if the Realtor knows it’s an Aladdin kit home? If so, there’s not a peep about it in the listing! Thanks so much to Elisabeth for sending the photos! Located in Shorewood, Wisconsin, this is the only Aladdin Venus I've seen with that wooden awning intact! And the rest of the house is in lovely condition, minus the windows on the side. 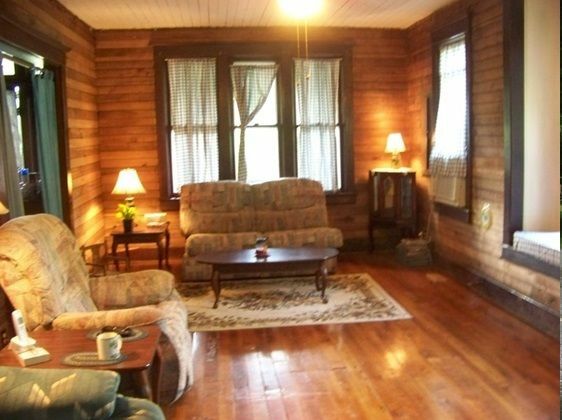 Best of all, this house is for sale and if you click on the link above, you'll find an abundance of interior photos. Thanks to Elisabeth Witt for getting this photo! Detail of that wooden awning. 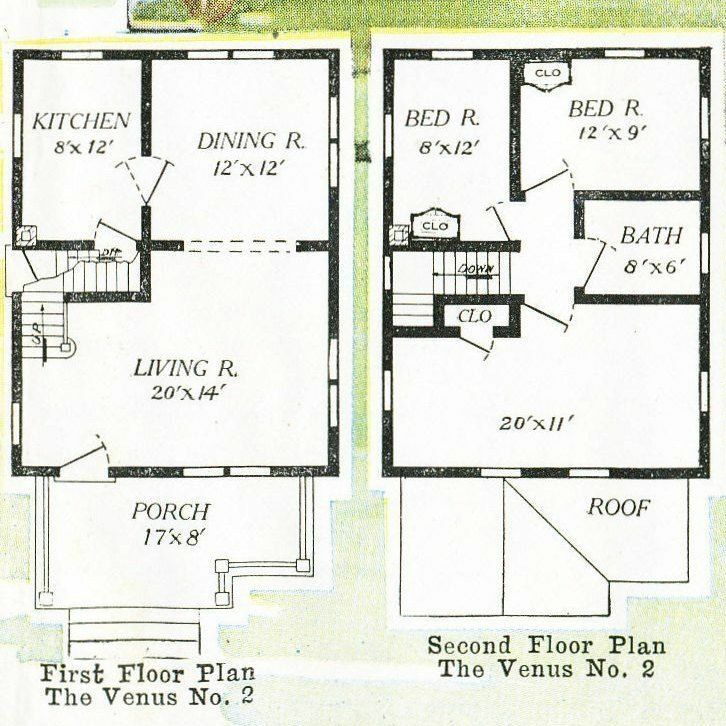 The Venus was offered in two floor plans. Venus #1 was smaller (18 by 24). Venus #2 was 20' by 26' and a couple other minor differences. 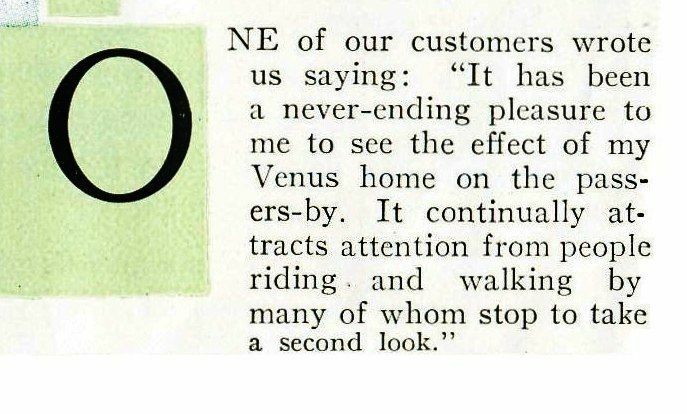 "It continually attracts attention from people walking by..."
The Aladdin Venus, as seen in the 1919 catalog. What a pretty little Aladdin Venus! But the removal of four windows is a curiousity! Here's a tired Aladdin Venus in Newport News, Virginia. Another weary Venus, and this one's in Norfolk (38th Street). Here's an Aladdin Venus just outside of Roanoke Rapids, NC. If those other Venuses (Venii?) are tired-looking, this one's exhausted. It's on 35th Street, in Park Place (Norfolk, VA). 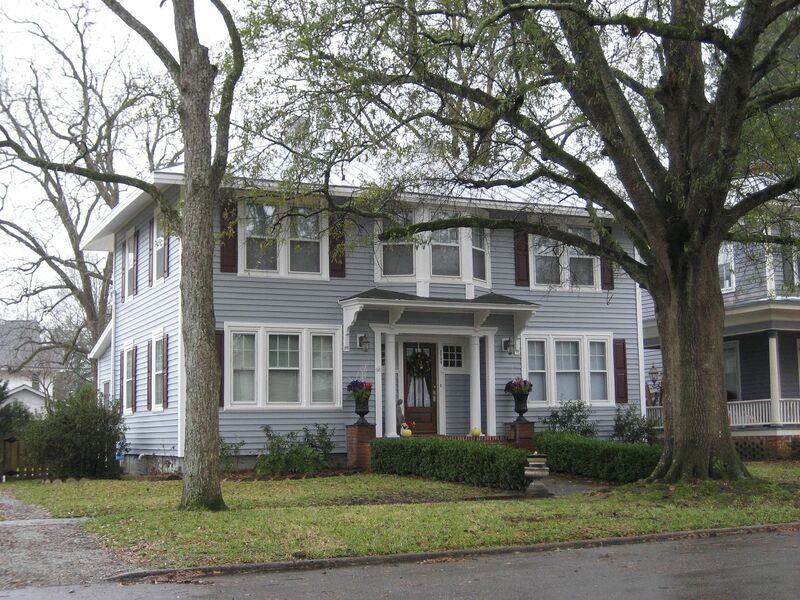 At one time, Park Place was solid working class neighborhood with many classic bungalows. Now it's a blighted, high-crime area that's trying to come back. In the meantime, the many bungalows in this neighborhood can be had for a song. Let's end on a happy note. Many thanks to Elisabeth for the wonderful photo. And someone should tell that Realtor that this is the real deal - an Aladdin (not Sears) kit home!